My trip began at the end of January. Leaving my normal life behind for a while, I set out with a passport, some plane tickets, and a couple of bags, quickly packed the night before. 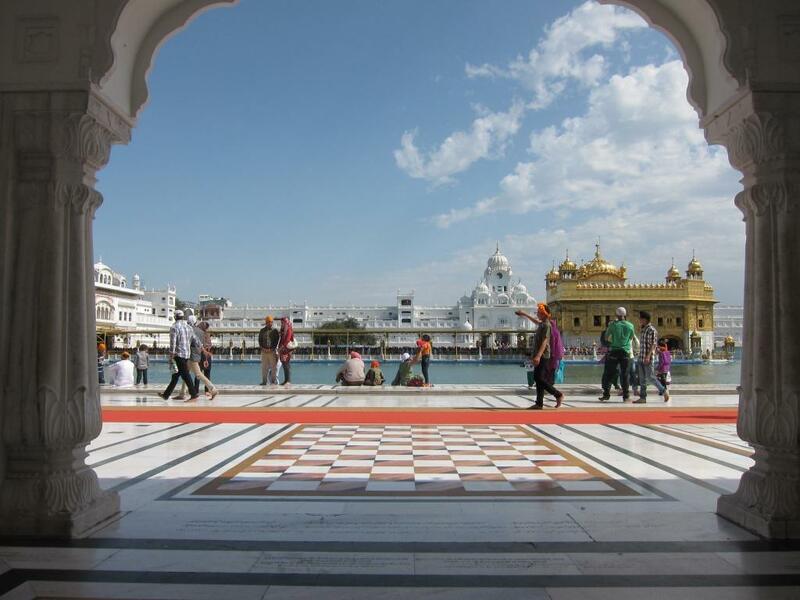 For several years now, India has been calling my name, and that is where I am headed. On the way there, however, I have a few stops to make and a few old friends to visit. My first stop was San Francisco, forty-nine square miles of ridiculously steep hills surrounded by ocean, mountains, and the entrepreneurial engines of America. San Francisco is a city I have long wanted to visit, and a fortuitous connection provided the opportunity to look up an old friend that I hadn’t seen in a few years. In addition to being one of the funniest people I know, my friend Kyle was also in some ways the original inspiration for this trip. Perhaps thinking of the biblical tale of Joesph’s dream-inspired prophecy of seven good years followed by seven lean years, Kyle proposed a long time ago that life should be lived cyclically: work hard, save money, and live right for say, four years; then, for the following year, let yourself go – stop earning, spend your money, travel, and see the world. After a year of profligacy, begin the whole process again. One may quibble about the details, but whether through intention or happenstance, my life seems to have followed a similar pattern, and it is with great joy that I find myself at the beginning of another adventure. One of the biggest benefits of traveling in a Westerly direction is the ability to easily adapt to the time change. In the interest of avoiding jetlag, Kyle and I decoded to go drinking with a friend of his on the night that I arrived. Although it took a supreme effort of will to stay up until the clocks on the West Coast reached last call, the combination of beer, Margaritas and Sangria ensured I slept soundly the first night, and from the next morning onward, I was properly adjusted (albeit moving at a slightly diminished pace). From brunch on my second day there, it felt as though the trip had truly begun. Over the weekend, Kyle and I decided to get out of the city. Meeting up with some of his friends, we crossed the Golden Gate bridge, driving North up the coast along Highway 1. With spectacular views of the Bay area, we wove our way up the mountainous terrain, sharing an amazingly tortuous and narrow highway with a never-ending processing of daring cyclists. Within the hour we were at Mount Tamalpais, and had a fantastic day of hiking down to Stinson beach. We also made a stop at Muir Woods, a beautiful, if somewhat touristy, protected redwood forest. While all agreed that the trees were not as big as one might expect, they were nevertheless straight and true, and generally an awesome sight to behold. Back in the city on Saturday night, I happened to discover that there was a week-long Film Noir festival happening at The Castro. Various parts of San Francisco simply exude a 1940’s hard-boiled feeling, and it seemed like too good an opportunity to miss. Slipping into a double bill part way through, I managed to catch the second half of the rarely seen Try and Get Me! and all of The Hoodlum, starring a young Laurence Tierney. The Castro is far and away the most beautiful movie theatre I’ve ever seen, and the place was packed, with many people dressed the part. All in all, San Francisco is one of the most remarkable cities I have ever visited, and my time there was all too brief. Much like in Manhattan, a thriving cultural scene is compressed into a small geographical area, in which only the best of everything managed to survive. 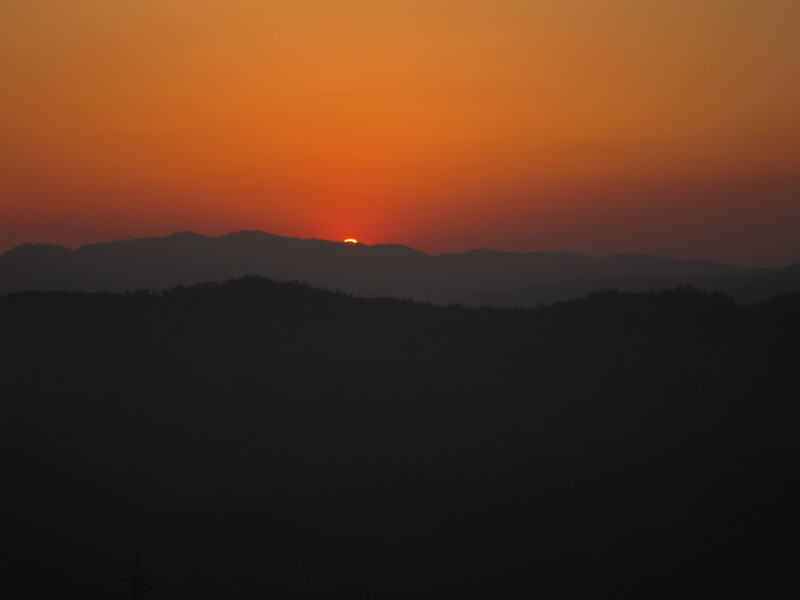 During the day, the heat of the sun is balanced by cool air, and at night, lights sparkle from the surrounding hills. The architecture is fantastic, with an interesting eclecticism, presumably at due at least in part to the various earthquakes that the city has experienced over the years. 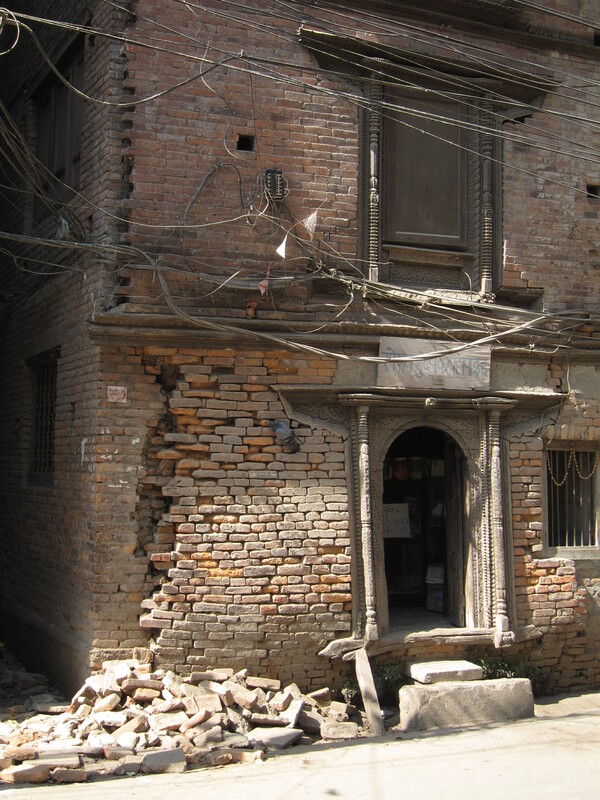 (Apparently the rule of thumb is that if a building survived the 1906 and 1989 earthquakes, you don’t touch it). 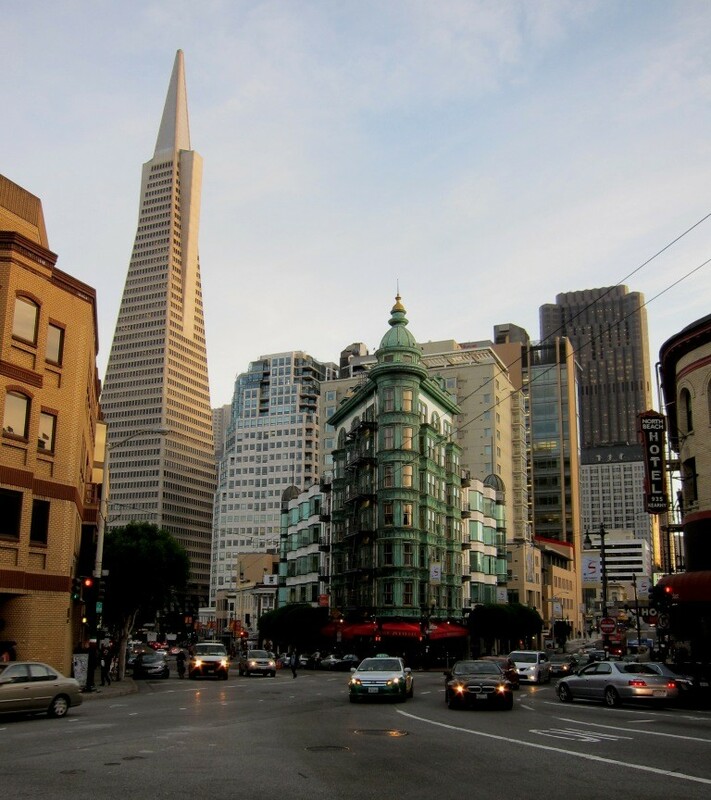 My personal favourite was Columbus Tower, also known as the Sentinel Building (shown below, with the Transamerica Pyramid in the background), currently the home of Francis Ford Coppola’s American Zoetrope Studios. 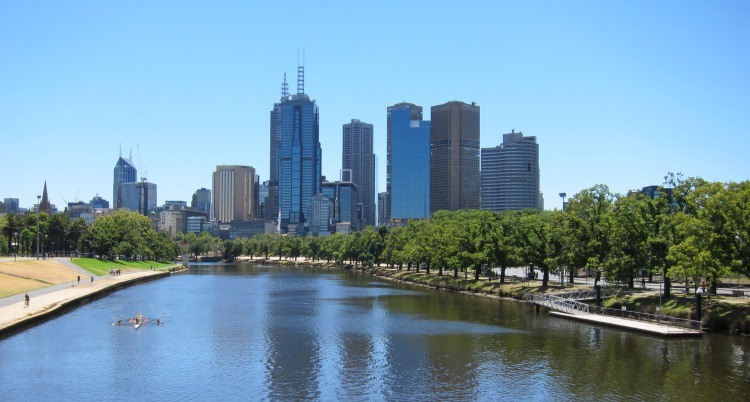 Though I would rather have stayed, it was time to go, and I made my way back to the airport, Melbourne-bound. It wasn’t really part of the original plan, but in the mad rush to plan something, Arlen and I ended up booking a trip to Cairns to go diving on the Great Barrier Reef. I didn’t make it up there last time I was in Australia, and it seemed like a shame to let the opportunity pass me by twice. I’m happy to say, it ended up being an awesome choice. All in all, I think it was one of the best tourist experiences I’ve ever had, and really the only thing I can think of in terms of wildlife viewing that compares to being on safari in Africa. Cairns (basically unpronounceable by me, but something like “Caans”) is one of Australia’s great northern outposts. 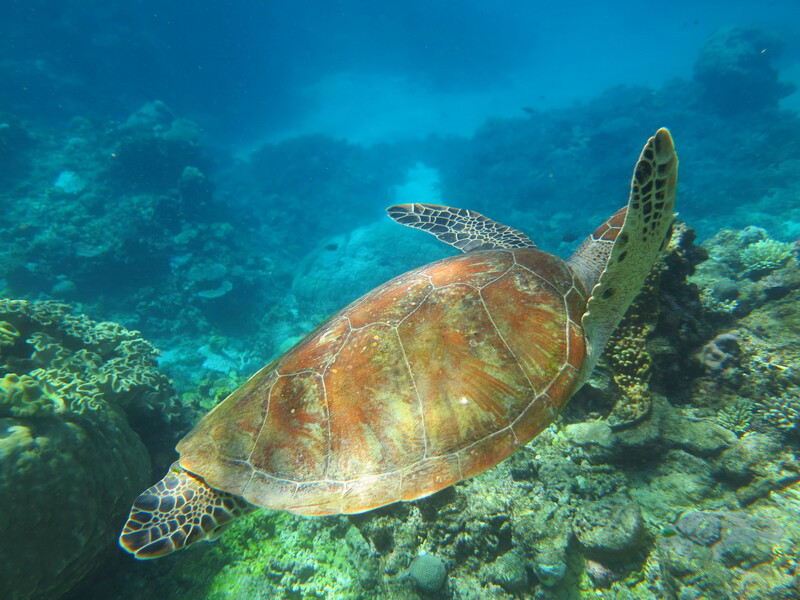 Originally a mining town, Cairns is now all about tourism, primarily because it makes an excellent launching point for trips to the reef. On the day we arrived, the temperature was about 34 degrees, which isn’t all that bad, but the humidity was out of control. Just walking across town to the dive shop was about all we could manage until the sun went down. Fortunately, our plan was to set out early the next morning on a 3 day live-aboard dive trip. Once we got out of port, the weather was perfect. We actually got incredibly lucky with the timing. Queensland recently got hammered with cyclones. If we’d chosen a different departure point, we might have had to cancel. If we’d been a week earlier, the water would have been totally murky. As it was, I couldn’t imagine the water being any clearer, with something like 20m visibility. 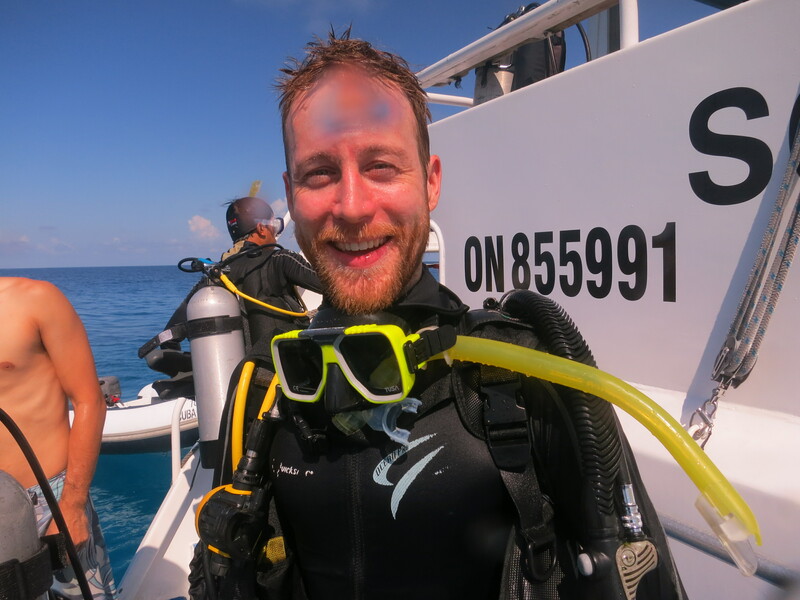 I’d only gone scuba diving once before in my life, in Mexico, and that didn’t exactly involve any real training, so I decided I would do it right this time. The typical certification course through PADI takes 5 days. Fortunately, I was able to do the classroom and pool portions in Toronto before leaving Canada, and was therefore able to jump right into the training dives from the first day on the boat. We ended up booking with a company called Pro Dive, and they were truly professional from top to bottom. There were 30 divers on the boat, about half of whom were already certified (including a group of four who’d been referred from another company, whose boat had crashed into the reef the day before they were supposed to set out). There were also six crew members, including the captain, a dive master, two instructors, and Donnie, the Scottish cook (an oxymoron, I know). The boat easily accommodated all of us with two outer decks, a spacious mess area, and cabins below. The trip involved 9 dives over the three days, including a night dive, plus two more for those already certified. Running an operation on that scale requires some serious organization, and the crew was all over it. They transitioned seamlessly from teaching to prepping to diving to cleaning up. Every time we came in from the water, Donnie had a hearty meal prepared for us, and he even managed to bake something like two cakes per day. The diving itself was absolutely amazing. 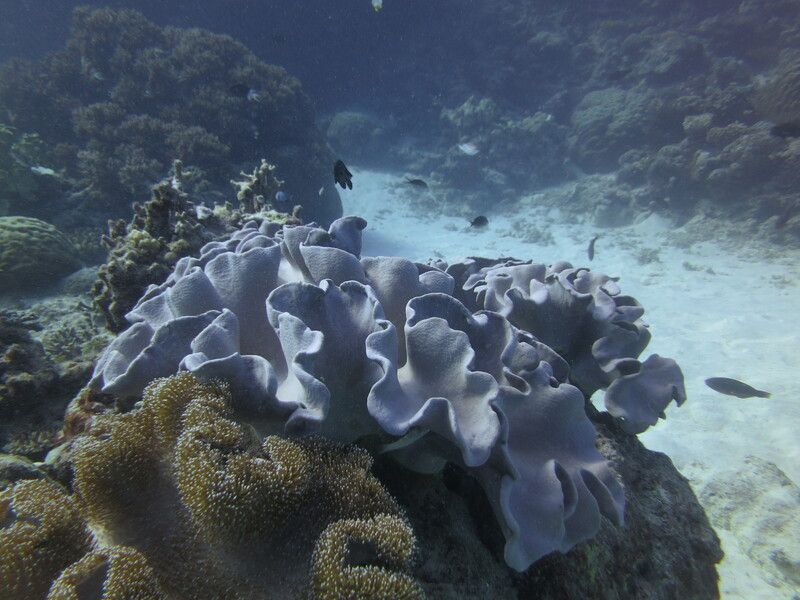 I didn’t really know what to expect, but the combination of the coral and the aquatic life was simply mind blowing. I guess I was mostly imagining scores of tropical fish, but what I hadn’t counted on was how personal the whole thing would feel. 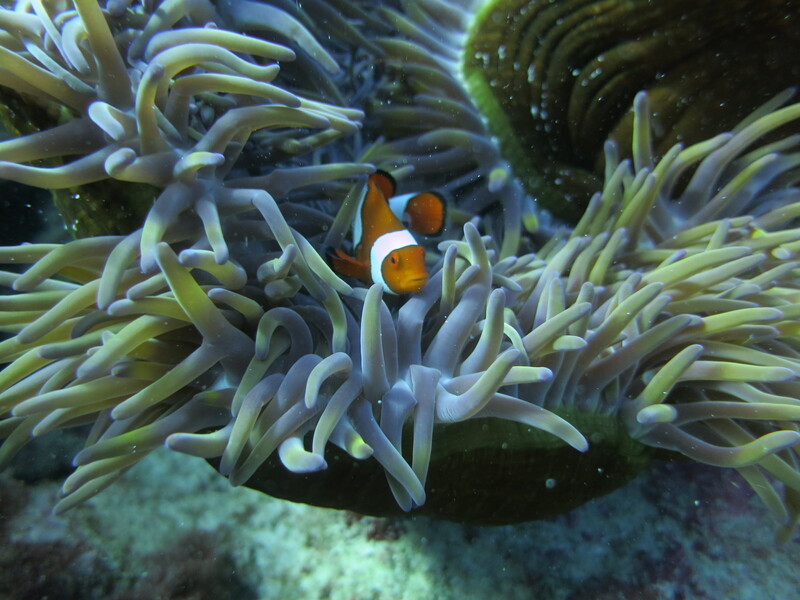 It was certainly cool swimming with the reef sharks, rays, and turtles, but the best parts were things like the little Nemos, which just hang out in their anemone, always to be found in the same place. The night dive was the only one which felt a little out of control. Someone had trouble equalizing on the way down, and for a while it wasn’t totally clear what was happening, but we eventually got it sorted out. We each had a flashlight to explore the space around us, but on the way back to the boat, we shut them all off, leaving only the light of the glowsticks on our tanks. 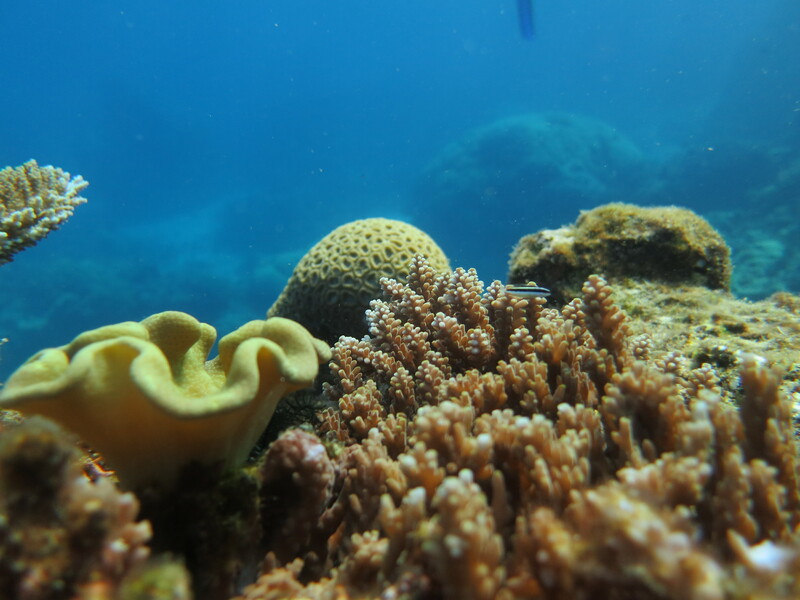 Unfortunately I didn’t have a camera for the night dive, but here’s a sampling of photos from the last day. For those who don’t know, the Kumbh Mela is a mass Hindu pilgrimage held once every three years at at a rotating set of four cities in India. 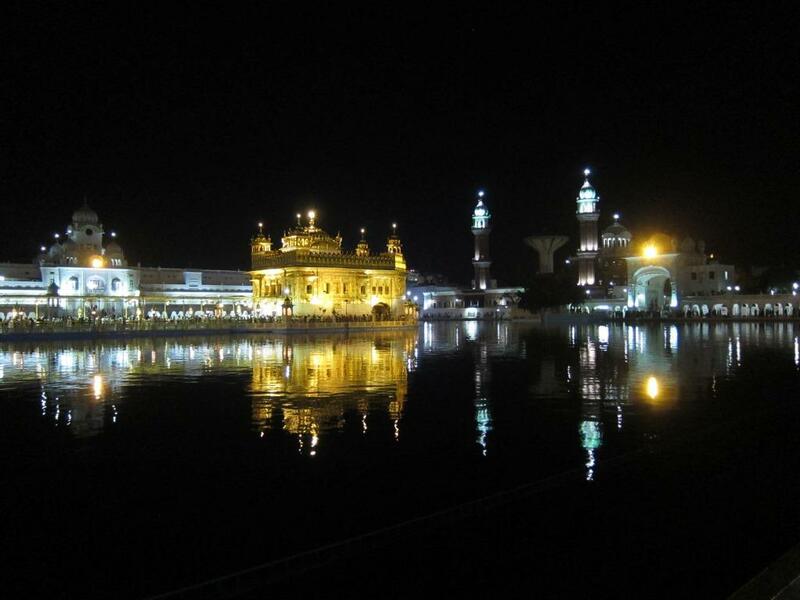 It is generally considered to be the largest human gathering in the world, with numbers growing each year, and (questionable) estimates ranging upwards of 70 million pilgrims visiting over the course of a month. 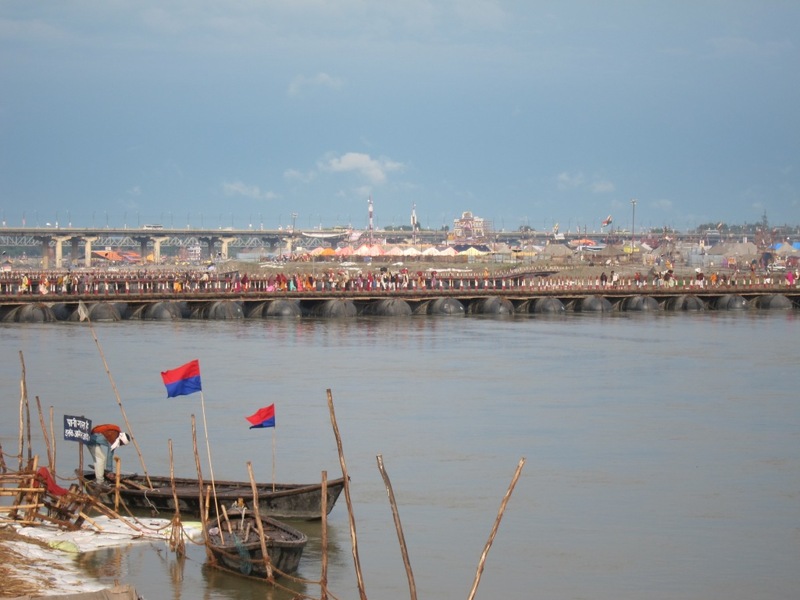 This year was a Purna Kumbh Mela, held once every 12 years at Prayag, also known as Allahabad, a particularly auspicious site for ritual bathing, because it contains the Sangam – the confluence of the Ganges and Yamuna rivers (as well as a third river, according to some believers). 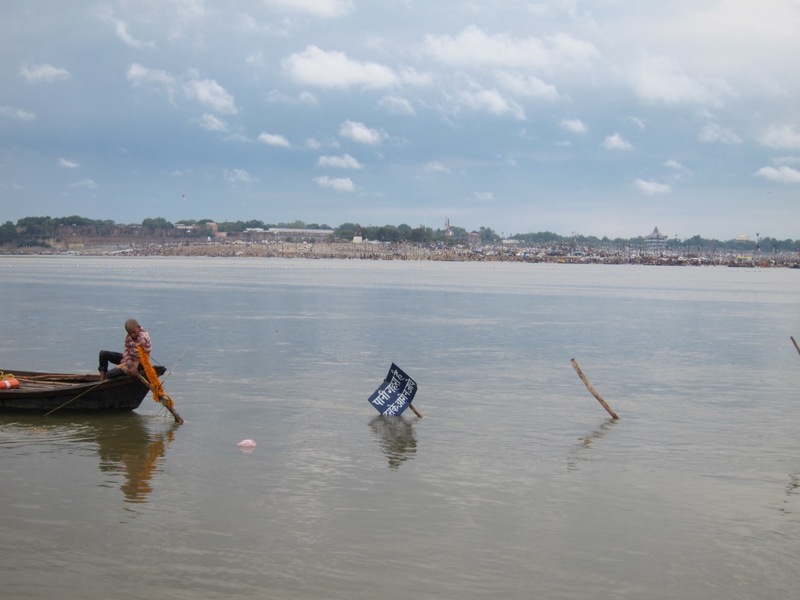 I only became aware of the Kumbh last year, and although I didn’t exactly plan this trip around it, it did seem like fortuitous timing. 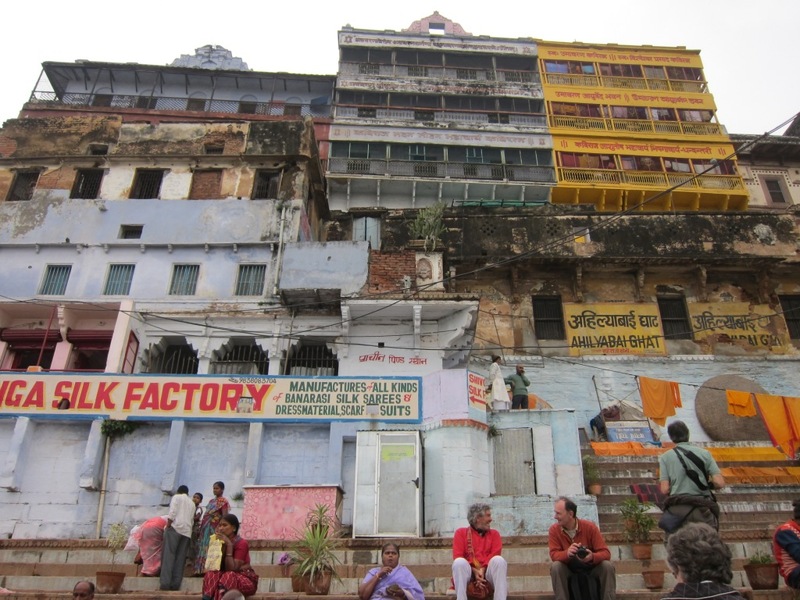 Adam and Aislinn and I had discussed the possibility of doing a day trip there from Varanasi, and for a variety of reasons, it came down to a choice of going on their last day in India or not. 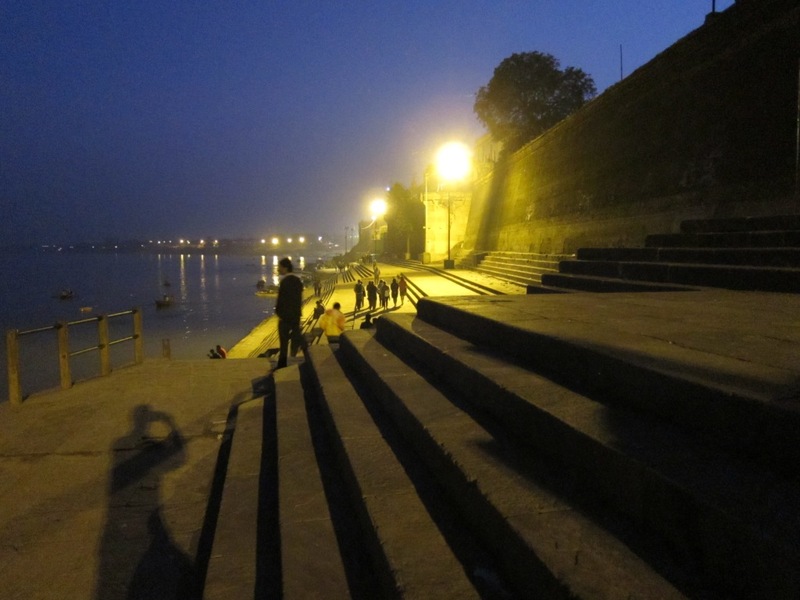 Allahabad is only 123 km from Varanasi, but the normal travel time is three hours. 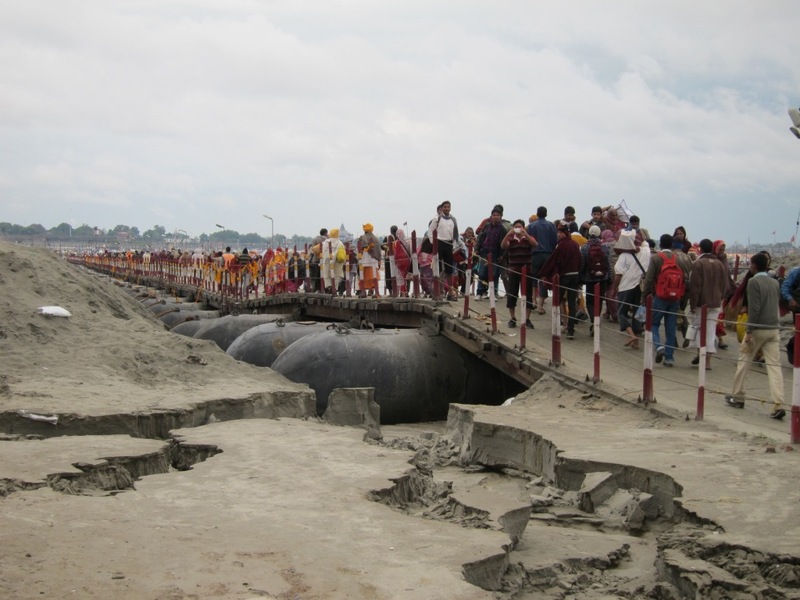 Because of the Kumbh, however, we were told to it might take as long as 4 hours to get there and 8 hours to get back on that particular day. There was so much uncertainty, and none of us could quite decide, so in the end, at Adam’s suggestion, we made our decision with a coin-toss. Since leaving Varanasi I’ve run into several people who went to the Kumbh and stayed for a week, and they have some pretty insane stories about things they saw, especially concerning the Sadhus, a group of wandering monks known for their extreme asceticism, dreadlocks, and in some cases going about completely naked. 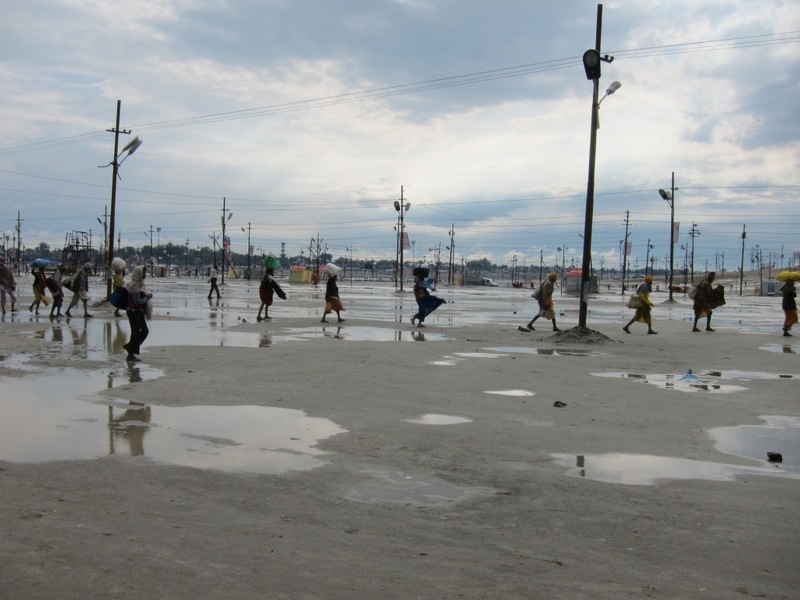 Because of our limited time, I don’t think we really got the full Kumbh experience, but we did go, and it was a pretty awe-inspiring sight. Imagine if you can, a temporary tent city set up to handle 10 million people. It’s hard to describe (and even harder to photograph) the sheer scale of such an deployment, but that is basically what we found at Allahabad. Amazingly, it was remarkably well organized (at least the parts we saw), and felt like some combination of a military operation and a massive refugee camp. We hired a car (with a fantastic driver who sadly spoke no English), and he got us right into the centre of things in good time. 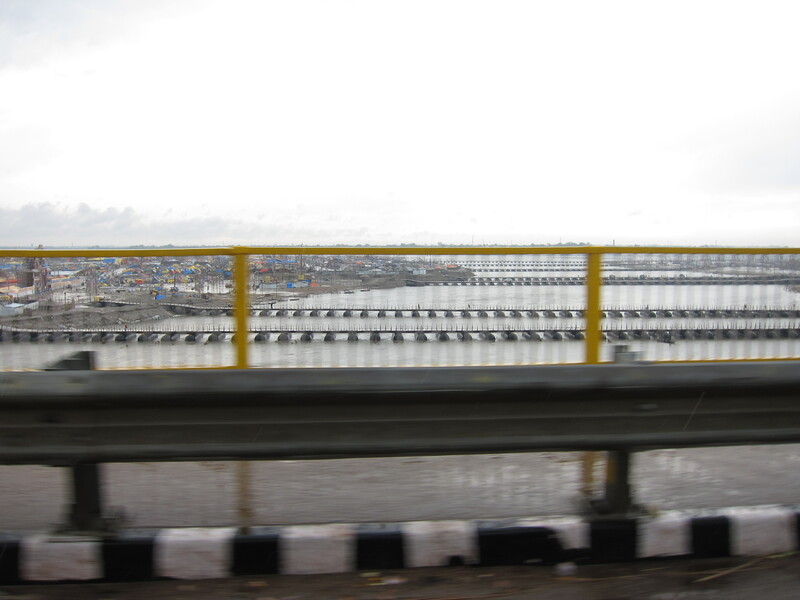 As we approached, we crossed a huge permanent bridge, where I took the following photograph. In it, you can see the dozens of temporary bridges that had been built to facilitate people and vehicles crossing from one side to the other. 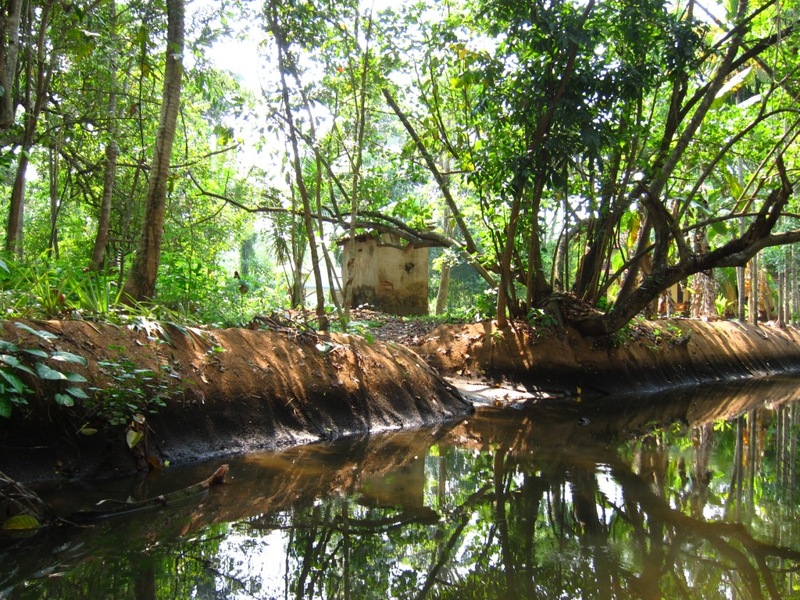 The following photograph is taken from the far side, after we crossed the foot bridge, looking back across the water at Sangum. I’m not really sure what the kid in the photograph is doing, but the sign apparently says that the water here is too deep. The trip home ended up being far shorter than expected (less than four hours), but the storm was fully raging the whole time, and I saw some of the best lighting in my life in the midst of the Indian countryside. 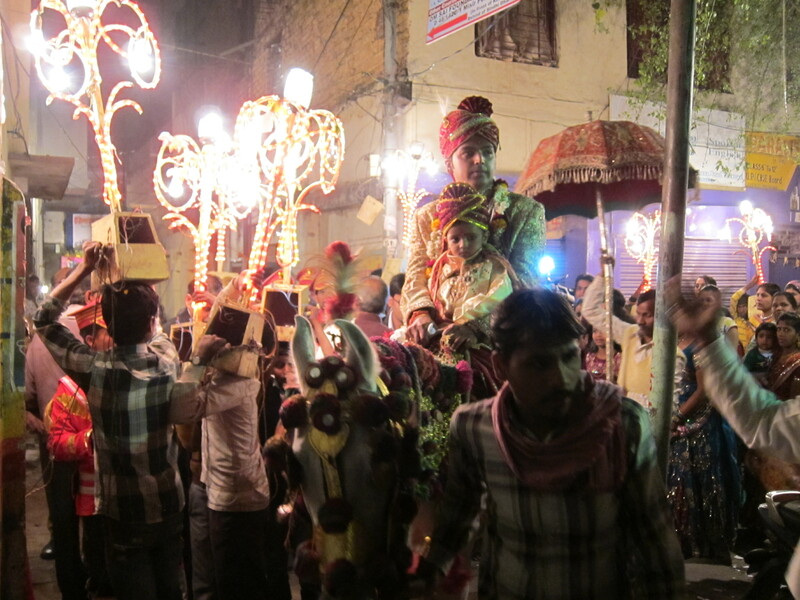 The rain, however, didn’t stop the kids in Varanasi from the usual all night partying. We hadn’t really eaten anything all day, but as we approached the city, I began to feel quite nauseated. 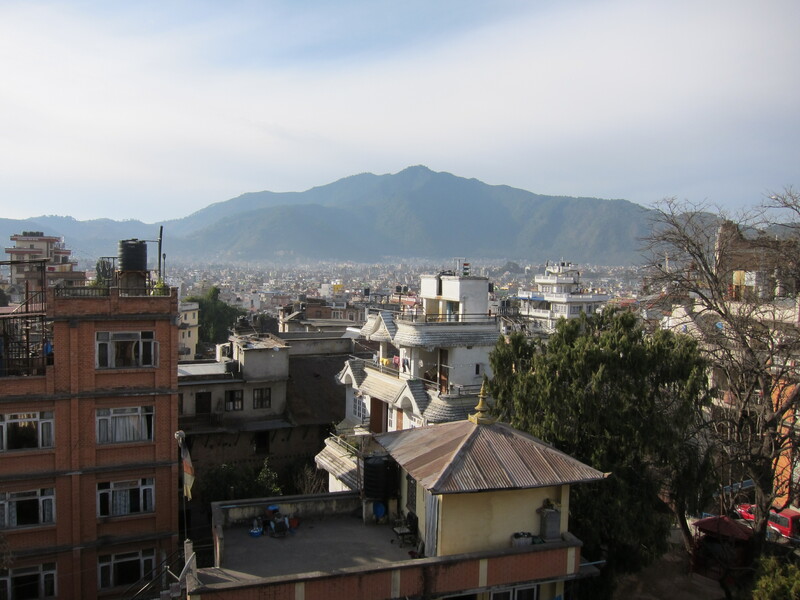 We were getting very close to our guesthouse, but whether from dehydration, exhaustion, or the day’s experience, I had no choice but to roll down the window and throw up – just a light chuck. 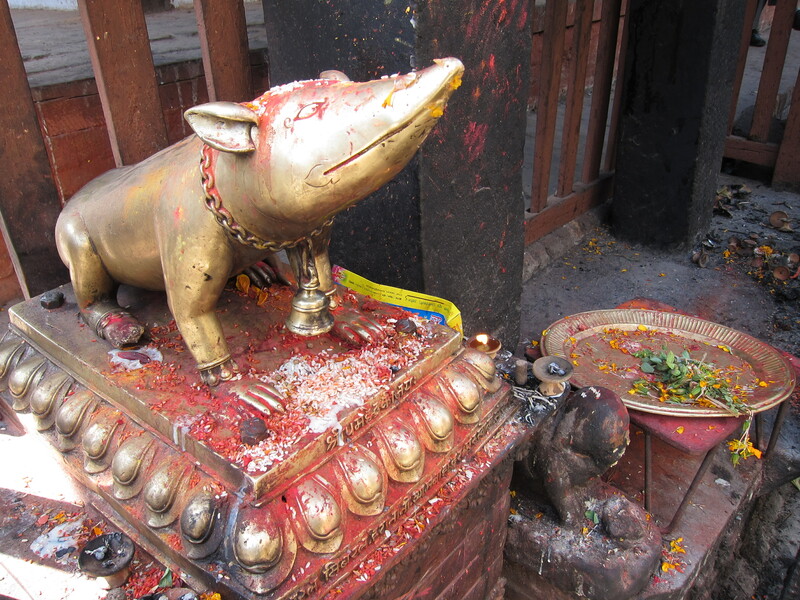 I was naturally worried that I had already come down with the dreaded Delhi-belly, but by the next morning I was feeling fine, and was able to wish my friends well on their onward journey into Nepal. 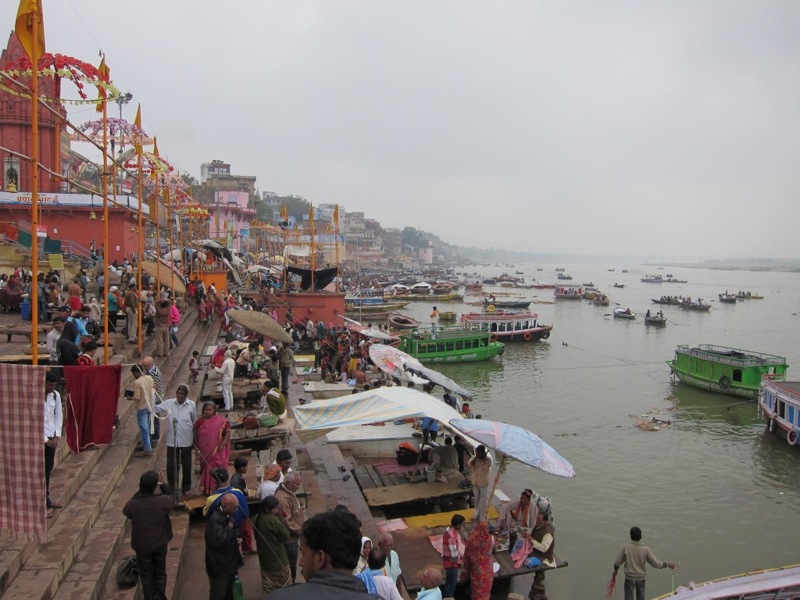 For more photos of the Kumbh, (and hopefully more stories to come), check out their blog too! 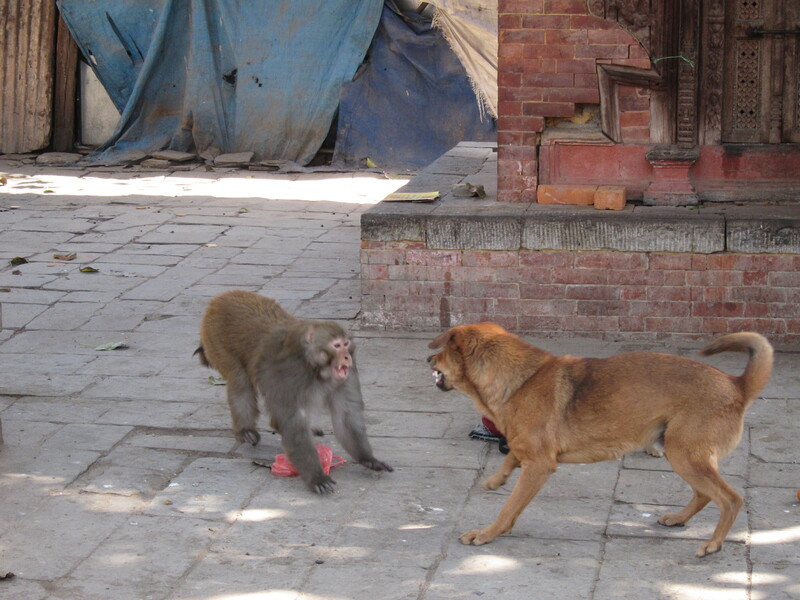 After Varanasi, I came to Bodhgaya, and I’ve been lingering here for nearly a week, far longer than I had intended. 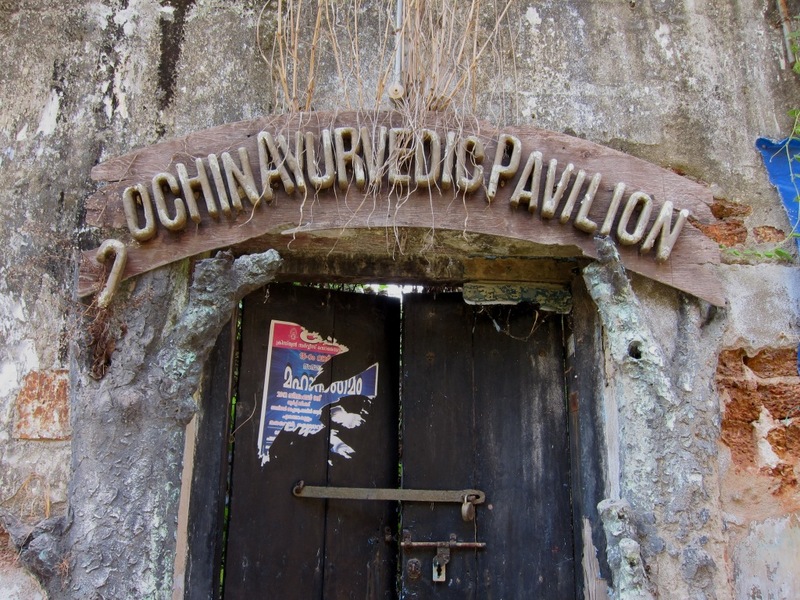 My reason for coming here was that it is where the Buddha supposedly attained enlightenment, but it also turned out to be a great place to relax, get organized, and plan my next steps. 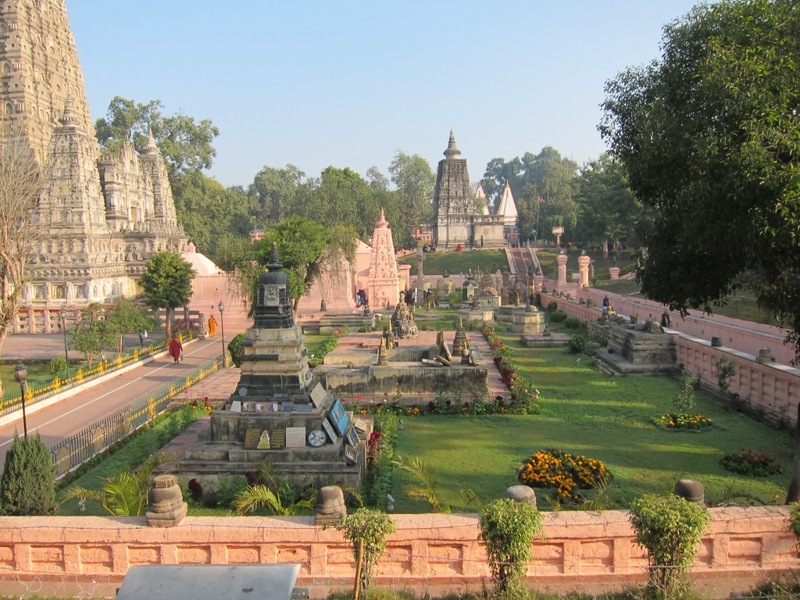 As the most important pilgrimage sight in Buddhism, Bodhgaya is a fascinating place to observe the practices of various incarnations of Buddhism from around the world. 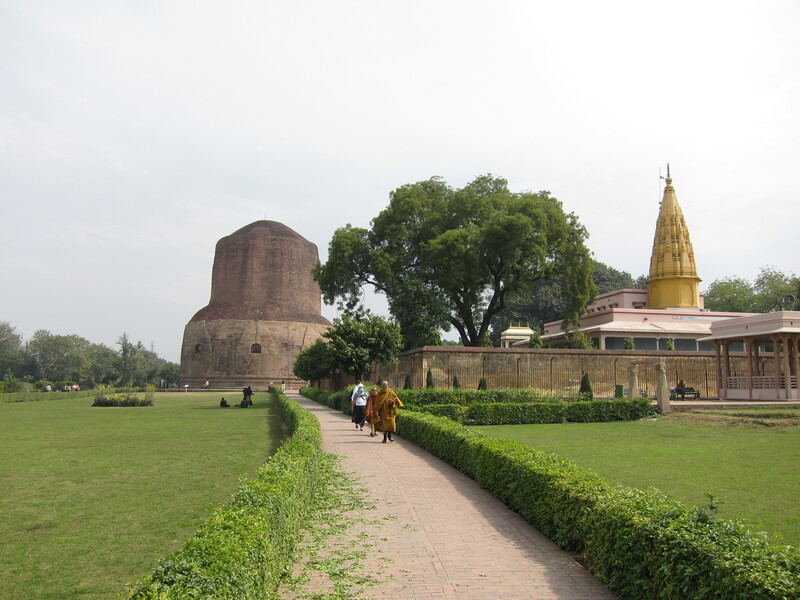 The centre of town is dominated by the Mahabodhi temple, built around the spot where it is said that the Buddha sat under a Bodhi tree and was enlightened in the fifth or sixth century BCE. A temple was built here a few hundred years later by Ashoka, a powerful ruler who did the most to promote Buddhism in India. The temple has been rebuilt many times over the years, but it was one of the few sites to survive the Muslim invasion of the eleventh century in any form. 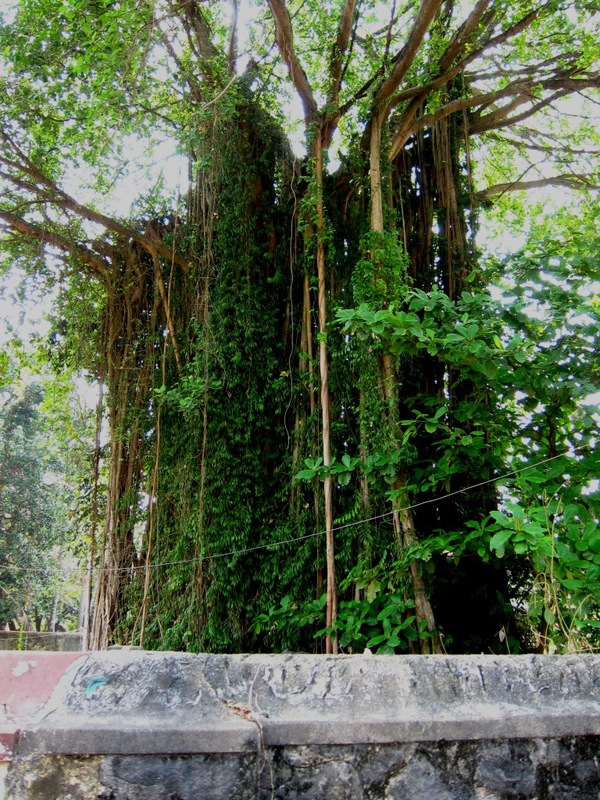 A Bodhi tree still grows there, supposedly grown from a cutting of a tree in Sri Lanka which in turn was transplanted from the original tree. The temple grounds are busy from dawn until dusk, and an absolute highlight of this place is to see Buddhists from all over the world worshipping in the temple grounds. A group of Tibetan monks keeps a constant vigil, alternating between chanting and drumming. Some large tour groups in identical white uniforms gather in song. Many monks clad in ochre or maroon simple walk the perimeter, while others engage in ritual prostrations, in some cases doing both at the same time. 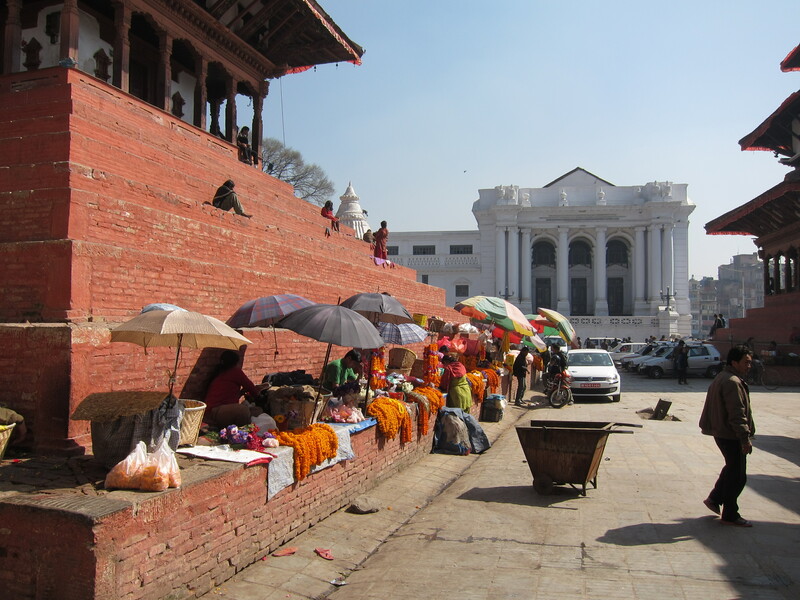 The rest of the city is dominated by temples built by other countries. Each shows its own unique style. The Japanese one is simple and restained. The Bhutanese is ornate, with extensive carvings on the walls. 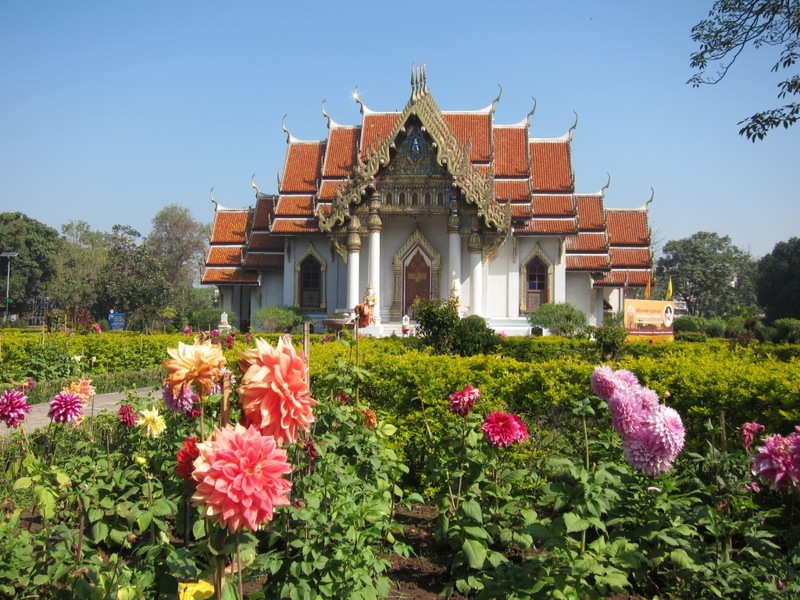 The Thai is perhaps the nicest, with a golden roof and beautifully maintained grounds. My other reason for liking this place so much is a fantastic guest house I’m staying at, called Mohammad’s House. It’s quite basic, but very clean and well-run, and every night from the roof I can watch a the sunset, as it turns into a perfect red disk against a backgound of blue and green. Although it’s just on the edge of town, the guest house is essentially in the midst of a village. Farther out of town in the rice fields, it’s difficult to escape from the children begging for chocolate or money, but here the people seem to ignore the tourists, just as they do the monks who wander through. There are many families living in a fairly simple dwellings but overall it seems quite prosperous. The houses are mostly made from painted, plastered brick, most families have metal cookware and beautifully colourful clothes, and there lots of animals wandering around – ducks, pigs, chickens, goats, and dogs. The alleyways are mostly full of women and children (there are a lot of children!) During the day, a major activity is making fuel out of dung, which involves combining it with a stabilizer (sawdust, perhaps? ), forming it into patties, and letting them dry in the sun, either on the ground or stuck against a wall. In the evenings the women prepare meals in front of their homes, cooking over wood or dung fires. The kids like to play cricket, hackey-sack, and with the ever popular hoop and stick. I’m not really sure where all the men are, but presumably many are working in town. Earlier, when staring at the ruins of a ancient Buddhist Stupa made of brick, I was silently lamenting the fact that no one builds such elegant, grandiose architecture anymore. 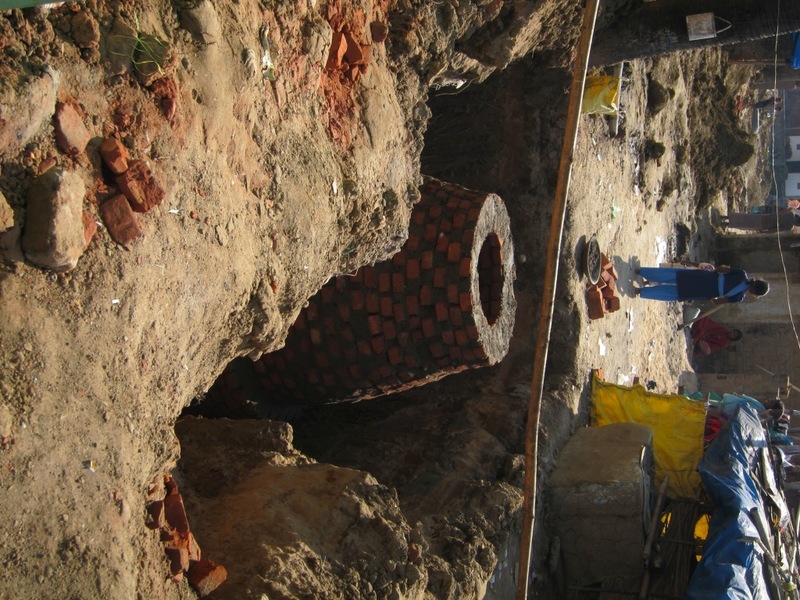 Watching these sewers being built, it was obvious that this is by no means from a lack of knowledge or ability! Buddhism, of course, more or less died out in India a ling time ago, but I have been interested in both Buddhism and meditation for some time now. I first learned about Zen through the likes of Robert Pirsig and Douglas Hofstadter, and it always seemed like a belief system that was relatively compatible with a modern, scientific worldview. The longer I spend here, however, and the more I read, the more I realize that the reality is much more complex. Buddhism has developed like a river in many directions in different places and arguably demonstrates as much diversity as, say, monotheism. It naturally needs to be understood in it’s historical context, as it developed out of earlier Vedic religions, most of which believed in Samsara, or the wandering-on, the endless cycle of birth, death, and rebirth. If anything, various forms of Buddhism seem to have become a great deal more complex over time, incorporating different rituals, relics, mythologies and philosophies in different places. After Bodhgaya, my intention had been to head straight to Calcutta, where I was sure I would be able to track down some excellent coffee. 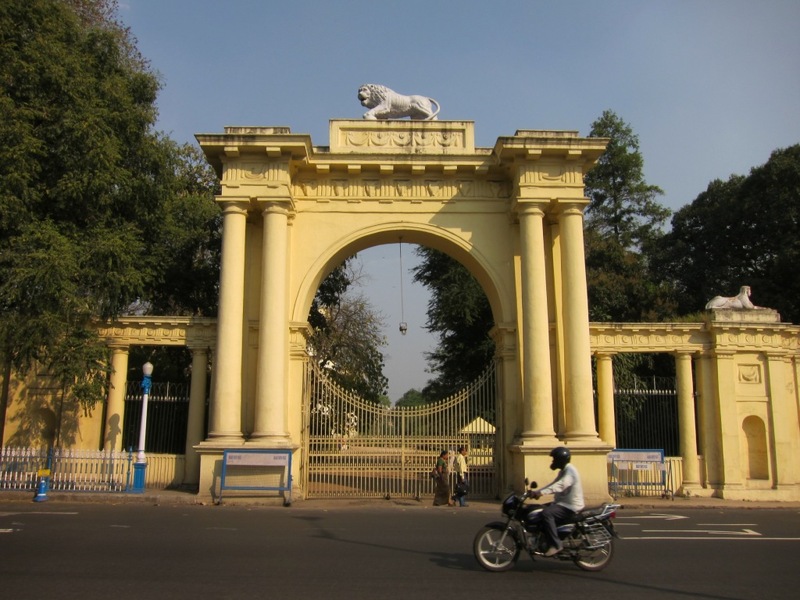 Someone convinced me, however, that I should first go North to the higher climes of West Bengal, and then come back down South to the old colonial capital. So, with slight reluctance, I plotted a course directly into the heart of tea territory. By this time, I was feeling like I really had the train system figured out. My first train experience, from Varanasi to Bodhgaya had not been so smooth, but in that case I had been planning on taking a bus which turned out not to exist. This time, however, I knew the names and numbers of the trains I wanted, I knew the schedules, and I had even acquired an Indian mobile phone – a necessity for buying train tickets online. Now, the train system in India is truly amazing. Employing 1.4 million people, and carrying 25 million passengers per day, there are tens of thousands of trains that cover the whole country, all of which seem to follow quite reliable schedules, even if they tend to run a bit later than the official timetables. For a remarkably small amount of money you can travel just about anywhere, with some journeys lasting upwards of 50 hours (not recommended). There are several classes, starting with Sleeper – fairly basic, but with an assigned seat that turns into a bunk. Above that there is first, second, and third class AC, which are basically the same as Sleeper, but with air conditioning and increasing levels of privacy and comfort. There is also AC chair, which is just a reserved chair in an AC carriage. Because train travel is so important to daily life, however, these classes tend to get booked up several days in advance. If you just show up at the station on the day you want to travel, you’re only choice will be Unreserved, which always seems to be available, possibly because they don’t actually limit the number of tickets they sell for that class. From everything I’ve heard, Unreserved is something to be avoided at all costs. 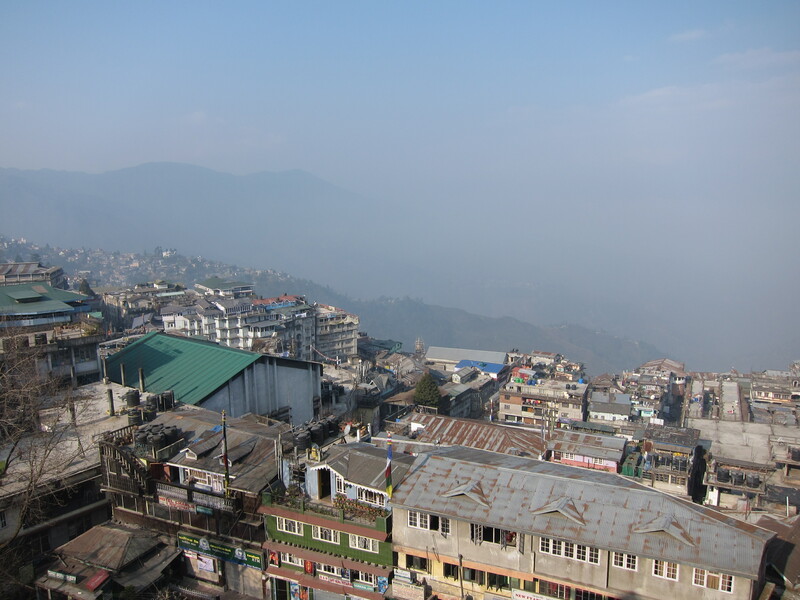 To get to Darjeeling, I had managed to put together a decent itinerary – AC chair to Patna, the capital of Bihar, then an overnight sleeper to Siliguri, where I would catch a shared jeep to Kurseong, just south of Darjeeling. The one sub-optimal part of the plan was a 9 hour stopover in Patna, with my overnight train departing just after midnight. Everything started out well. I travelled the 13 km to Gaya train station by auto rickshaw (a ubiquitous three wheeled vehicle that comfortably seats two, but is capable of transporting perhaps five times that number). My train was an hour late arriving, but it showed up on the right track, and it even somehow arrived in Patna on time. One of the best parts of train travel in India is that it affords an opportunity to meet and talk with a diverse cross section of people from India. Not everyone speaks English, (and as a first language it seems quite rare), but most people speak a little, and I’ve found that if I just go about my business, it doesn’t take long for someone to strike up a conversation with me. On this particular journey, I met two people involved in rural development in Bihar (the state which contains Bodhgaya). One had just finished a Masters and was looking for his first job, and the other was an older man who worked on projects along the lines of micro-credit – trying to connect farmers with banks and encourage savings. From them, I learned that not only is Bihar the poorest state in India, it also has the highest population density. These, in turn, were attributed to a lack of natural resources, a poor climate (droughts in one part, floods in another), and a lack of education. 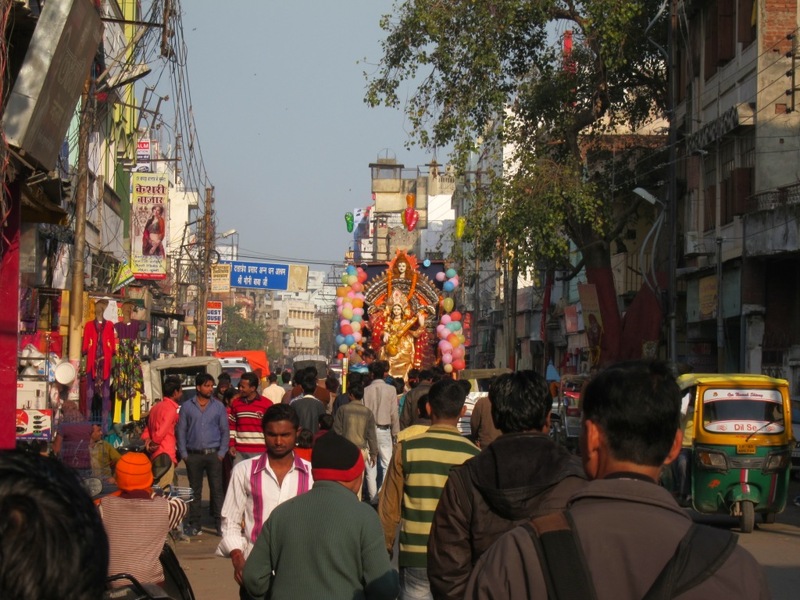 As a result, many people from Bihar are forced to move to the big cities in India in order to look for work, and apparently they face occasional backlashes, akin to the situation of illegal immigrants in the US. While I was digesting all of this, my conversation partner left to catch his departing train, and I decided to use my new mobile phone to check the status of my own. The result which came back – train cancelled – surely had to be a mistake. My ticket said confirmed! Checking again produced the same result, and I began to quietly panic. It was about 11:00 pm at this point, and I didn’t like the prospect of trying to find a hotel in Patna. Someone at the Enquiries desk was able to confirm that the train had been cancelled, but couldn’t offer much more help than that. To make a long story short, it turned out that there was an earlier train to Siliguri, which happened to have one seat left, in first AC nonetheless! I happily forked over the cash and boarded with only a few moments to spare. None of this would have been possible, however, had a kindly stranger not happened along at just the right moment and taken me through the whole process step by step. It never ceases to amaze me how kind some people can be in helping perfect strangers through a crisis, and it really makes me feel like returning the favour whenever I can. 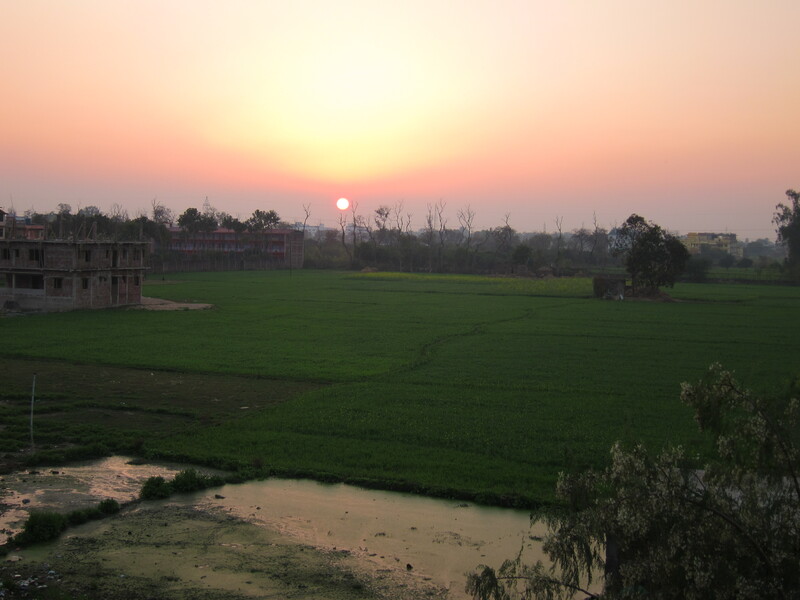 I slept well at night and during the day the countryside of Bihar rolled past the windows, an endless plain of rice fields. Aside from the occasional urban area, I don’t think I saw an inch of land that wasn’t cultivated. From Siliguri I caught a shared jeep to Kurseong as planned (although due to some hard-ball negotiating, I think I ended up hiring a ride from a Chinese tourist with a private car and driver), and arrived at my destination after a journey of about 30 hours. Finally, just to round out the various types of transportation involved in the trip, two days later I took the “Toy Train” up the hill to Darjeeling. A remnant of the early rail network, this train runs with an engine and two cars on a rails that are only about two feet apart. More of a tourist attraction than a transportation service, it took 3 hours to cover the distance of 32km, criss-crossing the main road and stopping traffic the whole way. Despite being generally ridiculous, that train trip is none the less part of the Indian rail network, complete with the same ticketing system and residual British seriousness. My arrival in Darjeeling was one of the more stressful moments of the trip so far. It was just turning dark as the train pulled into the station, and although I didn’t have far to go, the hilltop topography made the map difficult to interpret. Just as I got things figured out, I saw up ahead a group of at least forty people carrying torches (literally burning sticks! ), shouting and blocking traffic. Given that they were headed in the same direction that I was, I had little choice but to follow, giving them a wide berth. As I later learned, this is a nightly occurrence in Darjeeling, a protest march by Gorkhas which occurs like clockwork, as regular as the train’s arrival. From my room the next night, however, I could see that the real number of people was easily in the hundreds. Neither Darjeeling nor Kurseong were spectacular, although both afforded the chance to do some hiking in the hills, a cool and welcome contrast to the heat down South. 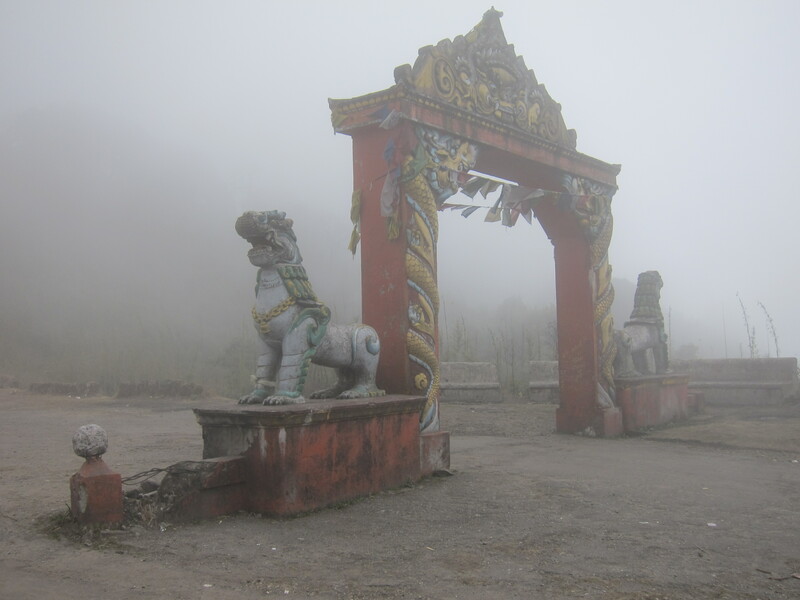 In Darjeeling, I spent a day hiking up Tiger Hill, a trip I enjoyed far more for the walk up into the cloud forest than for the view from the top. Sadly, like so many hill tops, this one has been replaced with a concrete tourist bunker, complete with cell phone towers. Apparently at dawn, and at other times of the year, you can jostle with other tourists to get a glimpse of Everest poking through the clouds. I didn’t see any mountains in the distance, but I had the place to myself, and a was happy to spend an hour a bit farther down the hill, watching the clouds float up one side of the mountain and roll down the other. Kurseong, was more pleasant over all, being a bit smaller and quieter. 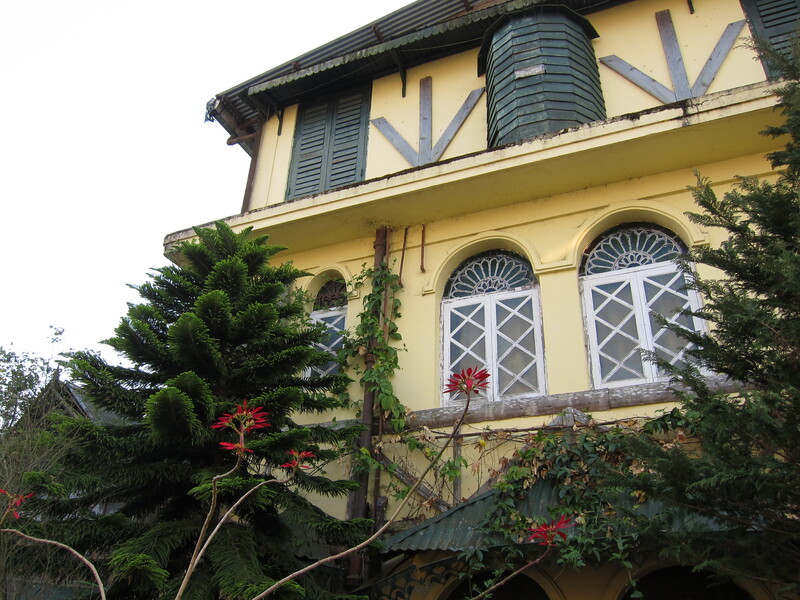 It also gave me the chance to stay in a decaying old colonial mansion, the one time home of Percy John Cochrane, the former Magistrate of Kurseong. (I later found his grave in the town cemetery). I was a bit hesitant when I arrived, concerned that I might be the only guest, but the place really came to life in the evenings, and also happened to have a restaurant serving the best Indian food I’ve had since my arrival. They even employ an in-house tea barista (for lack of a better term), who made the most incredible spiced concoctions, and who has got me seriously exploring this whole world of tea in Darjeeling. But no, coffee and Calcutta await! 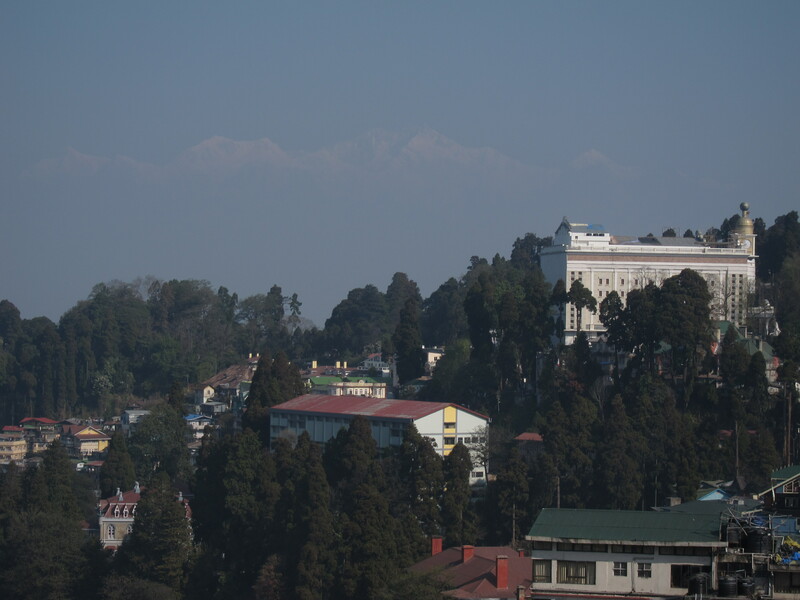 Addendum: The skies finally cleared a bit on my last day in Darjeeling, and I caught a glimpse of Kangchenjunga, the world’s third-highest mountain in the distance. This place must be truly spectacular on a clear day! 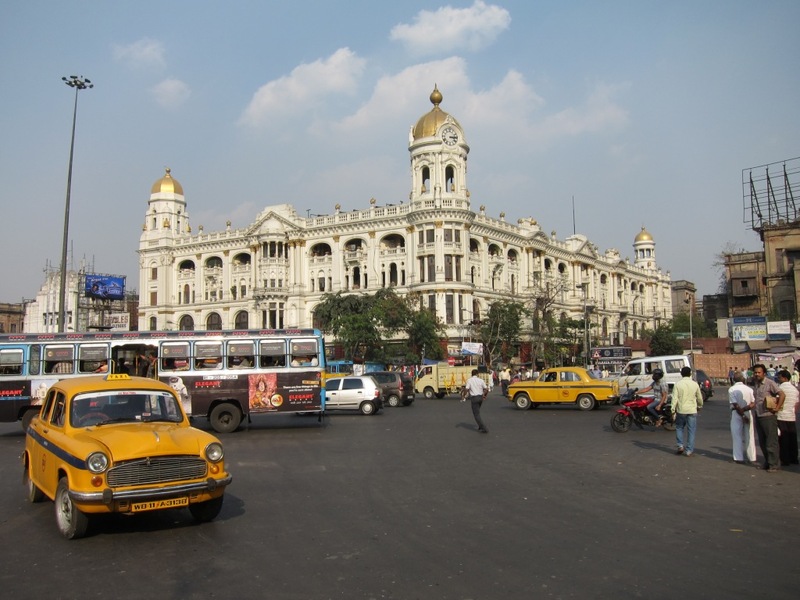 So finally I have come to Calcutta – former capital of British India, site of notorious rebellions, the third largest city in India, with 15 million people, and home to the world’s longest-serving democratically elected Communist government (until they were ousted two years ago). As far as big Indian cities go, Calcutta has a reputation for being the safest and most laid back, and to some extent I can see why. But it’s still a rather exhausting place, especially with daytime temperatures rising above 30 degrees. 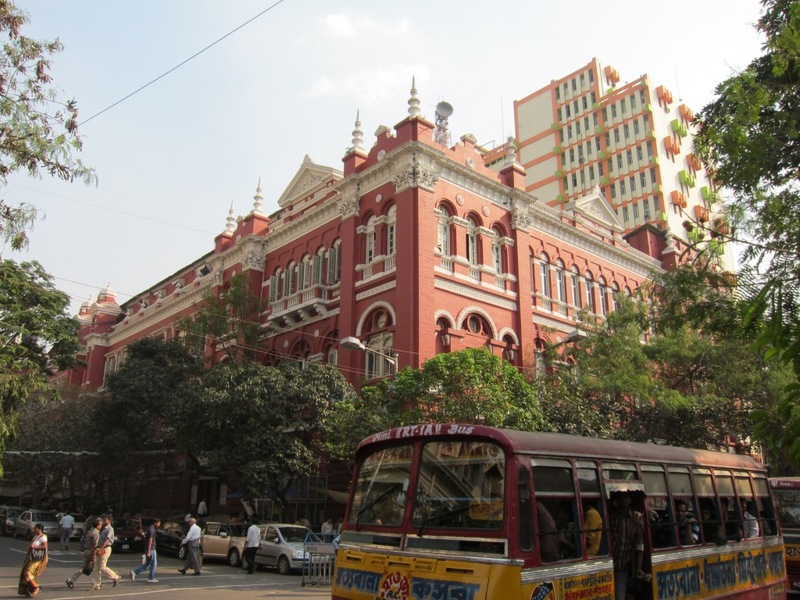 First, I should explain about the name: since 2001, the official name of this city has been “Kolkata”, which is apparently a more phonetically accurate spelling of Calcutta. I debated about which to use for the title of this blog, but I liked the visual alliteration of the later. I now feel well justified since coming here, as the Times of India, printed in “Kolkata”, comes with a tabloid supplement called the “Calcutta Times”. 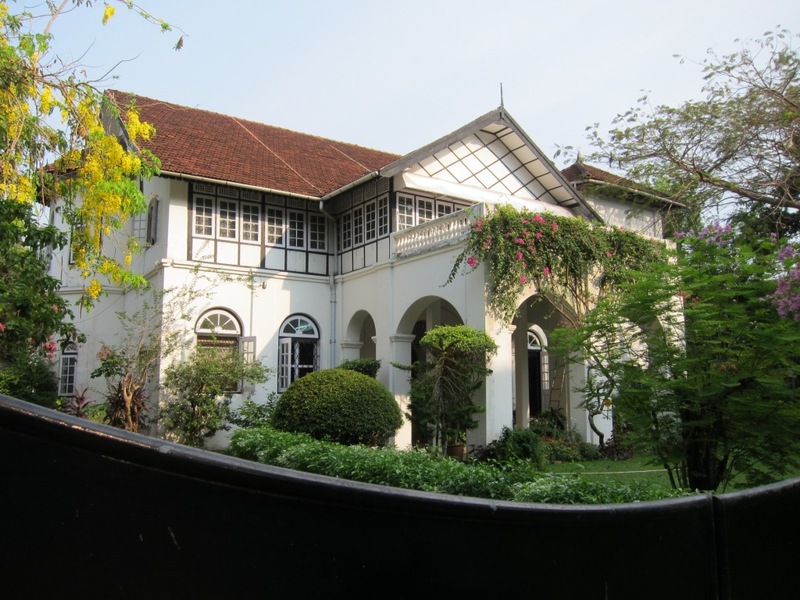 At some point since achieving independence, many streets here have also been renamed; as a result, the US Consulate is now humourously located on Ho Chi Minh street. I arrived here via another overnight train, this time in Sleeper. We pulled in about an hour late, but the train brought me right into the heart of the city at Sealdah station. As usual, I chose to walk to where I was staying, a possible miscalculation, as I had underestimated the sheer size of this place. 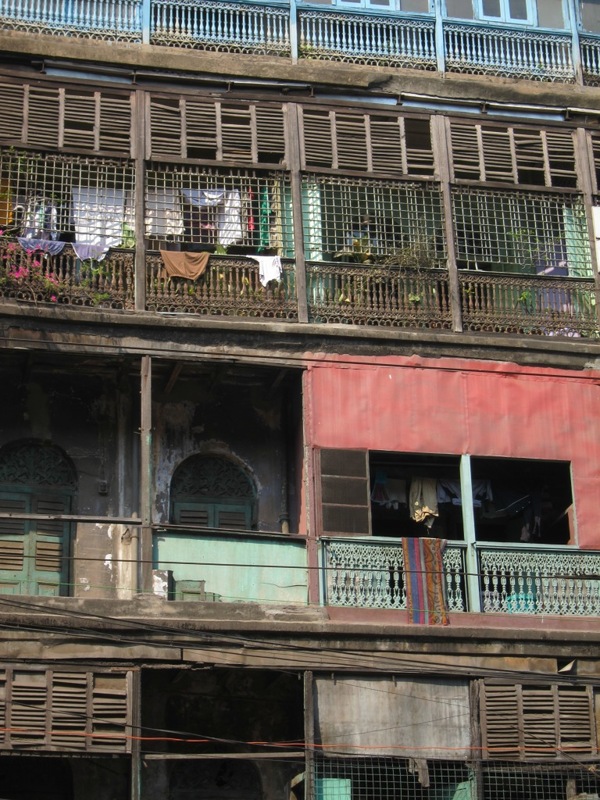 Although it has nowhere near the bewildering craziness of Varanasi, Calcutta scales everything up a thousand-fold, including the level of inequality and in-your-face poverty. It’s taken me a while to get into the rhythm here, and I’ve finally decided it’s because there are actually two distinct cities which overlap in the same physical space. On the one hand there is the upper/middle class city with shopping malls, coffee shops (more on that in a minute), restaurants, bars, taxi cabs and movie theaters. At the same time there is a second city of people who are basically living on the street, with little interaction between the two. From beggars to hand-drawn rickshaw pullers, there is a huge number of people living in very obvious poverty. 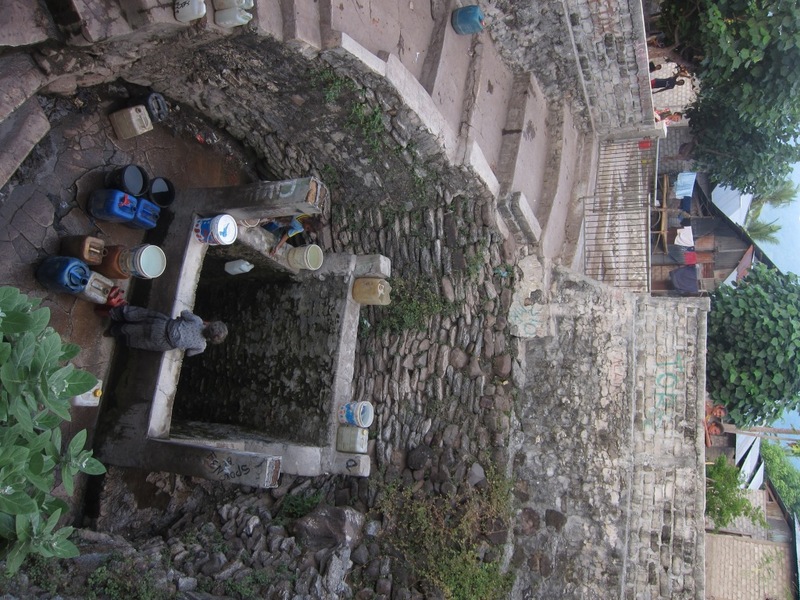 Hand-pumped water spouts are widely distributed throughout he city, and it is quite common to see people bathing on the sidewalk. All the major streets are lined with a seemingly infinite supply of a handful of basic services – shoe-shiners, tea sellers, food vendors, and the occasional curbside barber. I’ve walked through whole districts where everyone was repairing motors by hand-winding copper wire. The most memorable example I’ve seen is a group of people painting an iron fence black, by hand (i.e. without paint-brushes). Architecturally, the city feels like a cross between London and Kampala (or another third-world capital). Like many ex-colonial cities, Calcutta is dominated by somewhat dated monumental architecture, but the scale at which this city was envisioned is nearly incomprehensible, almost as if they were actually trying to create a second London or Paris. There is a distinct Victorian feel, and there are some quaint human-scale British flourishes, like old-fashioned mail boxes. Mostly though, this place is an ageing Modernist Utopian vision. 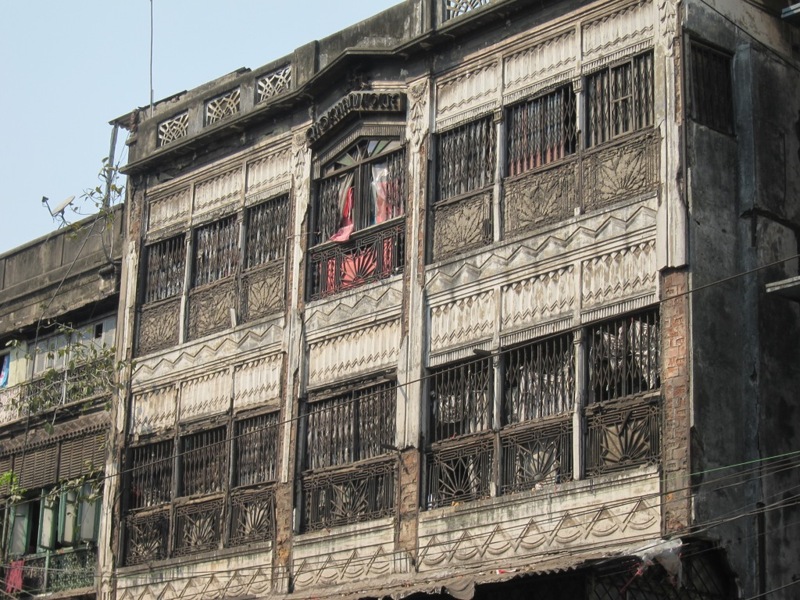 Giant stone buildings that once housed insurance companies line massive boulevards six lanes wide, with railways running along the banks of the Hooghly river. Vast parklands stand mostly vacant, and huge traffic circles bring all of these worlds together in a great spiraling sprawl. 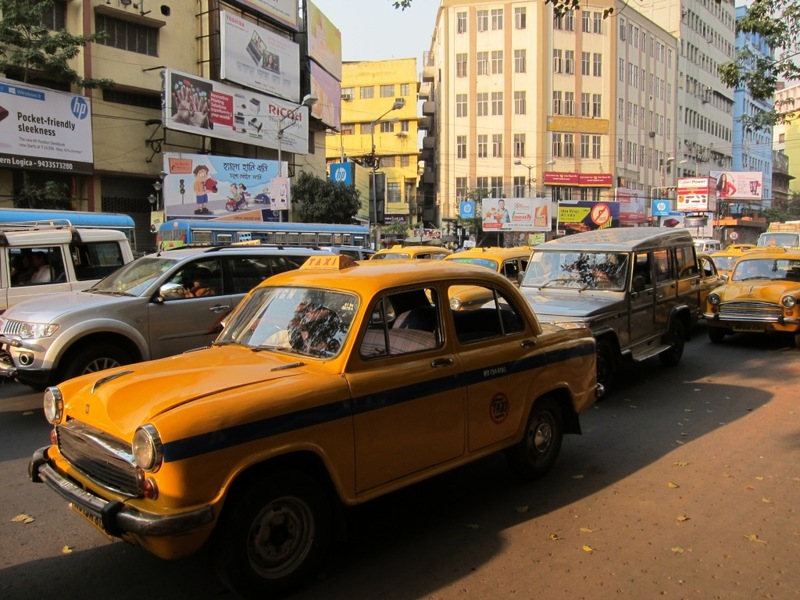 Unlike everywhere else I’ve been in India, in Calcutta, cars rule. In particular, the roads are dominated by a huge fleet of identical yellow taxi cabs that look something like old Bentleys. Apparently the actual make is the Hindustan Ambassador, “the king of Indian roads”. 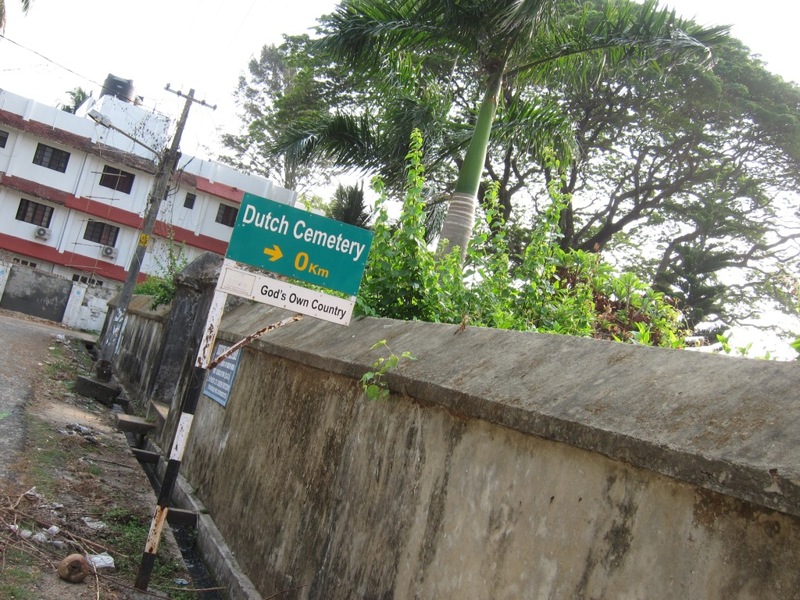 At the same time, however, this place can be rather unfriendly to pedestrians. The boulevards, businesses, and busy streets, make a high-speed Manhattan pace seem appropriate, but the heat, broken-up cobble-stone sidewalks, and slow-moving crowds force you to slow down. Police officers and lights ensure that the traffic takes turns at intersections, but cars which are turning apparently have priority over pedestrians, which can make crossing the road rather hazardous. And a couple of times I’ve been caught in the mazes of this urban planning nightmare, with only one endless path to follow between the fences, freeways, and monuments. (The most famous monument here is a memorial dedicated to Queen Victoria, which is, admittedly, quite lovely). Sadly, not much of the city is so well-preserved, with some parts of the city in a state of almost perpetual decay (due in part, I’m told, to a system of rent controls that has removed any incentive to conduct repairs). 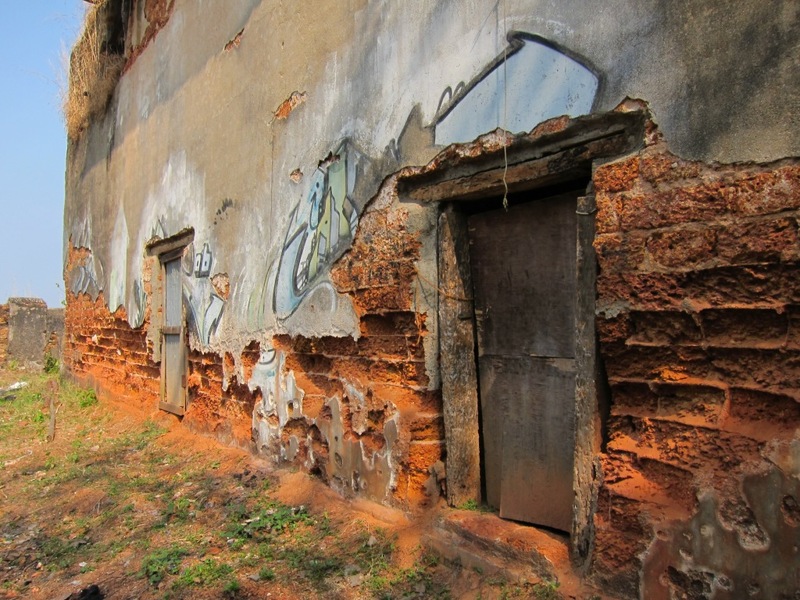 Admittedly, however, the crumbling facades can make for some rather photogenic buildings. Overall, however, the best experience I had in Calcutta was a cooking class with a Bengali woman in her home, organized by a small tour company run by two Australians. By necessity, it was a bit like a cooking-show, with much of the preparation done in advance, but it was a fantastic five-course meal (pakoras, chicken, fish, green-papaya curry, and a sweet tomato chutney) and I learned a lot. Things are already starting to blur together a bit in my mind, but it turns out a big part of the flavor comes from Mustard seed oil, which I don’t recall ever encountering in Canada (though I’m sure it’s out there). The best part, of course, was the chance to discuss everything besides food, including politics, religion, and family life. It turns out that my host has a daughter studying immunology in the US, who even spent some time at the University of Manitoba! Now, I know what you all want to know. How was the coffee??? Well, I’m not quite sure how to say this, but it turns out that I may have come to the wrong part of the country. In retrospect, it should have been obvious. The British aren’t exactly known as coffee connoisseurs. 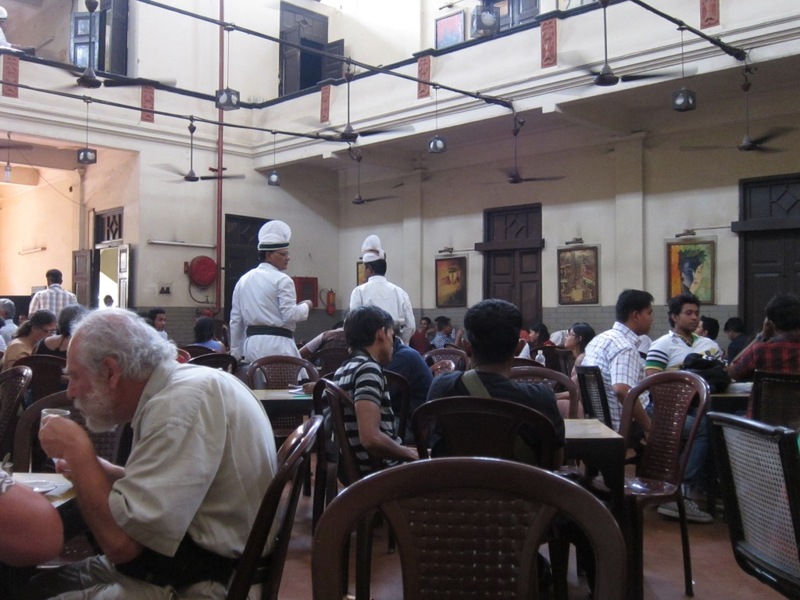 I just assumed, with Calcutta being the cultural and intellectual capital of India, that surely here would be coffee! In fact, there were a few options. The wealthy Calcutta naturally has a few chain coffee shops, such as Cafe Coffee Day and Barista Lavazza, but these are basically Starbucks knock-offs, primarily serving large milk drinks, and not exactly what I had in mind. There is also one place, called Flurry’s, which despite sounding like an ice-cream shop, is actually a fantastic European-style coffee shop and confectionery with origins dating back to the 1920s, and fabulous art-deco interior. It, however, was very upmarket, costing almost as much as Canada for a comparable beverage. Moreover, it is unfortunately located at what has become the most touristy intersection of the city, right across from Music World, McDonalds, and KFC. 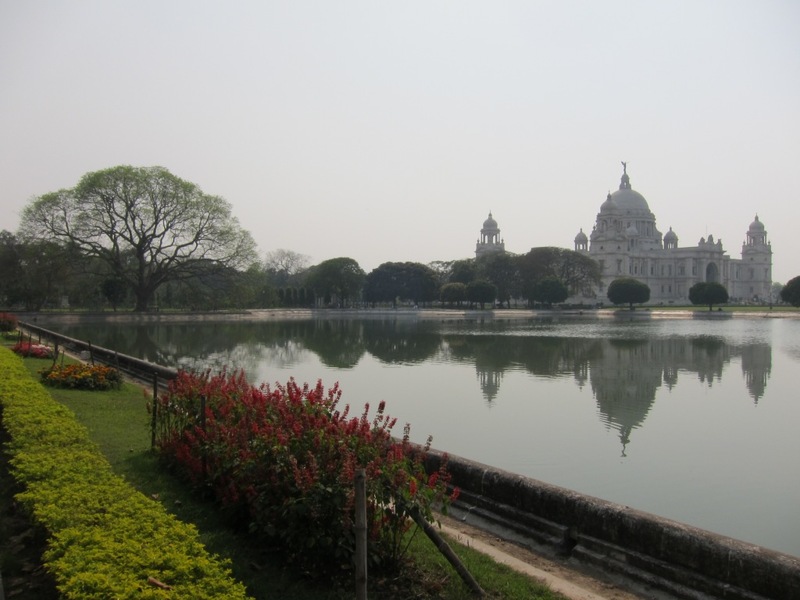 All things considered, I can’t really say that I found what I was looking for in Calcutta. Fortunately, I was able to learn during the cooking class that the right way to get the best coffee in India, is to go to the source, down to Kerala, where it’s grown. Everyone tells me that the South is already heating up, but checking the weather forecast, I see some 38 degree weather headed towards me, so I’m inclined to escape the city before it gets too hot, and take my chances in the South. 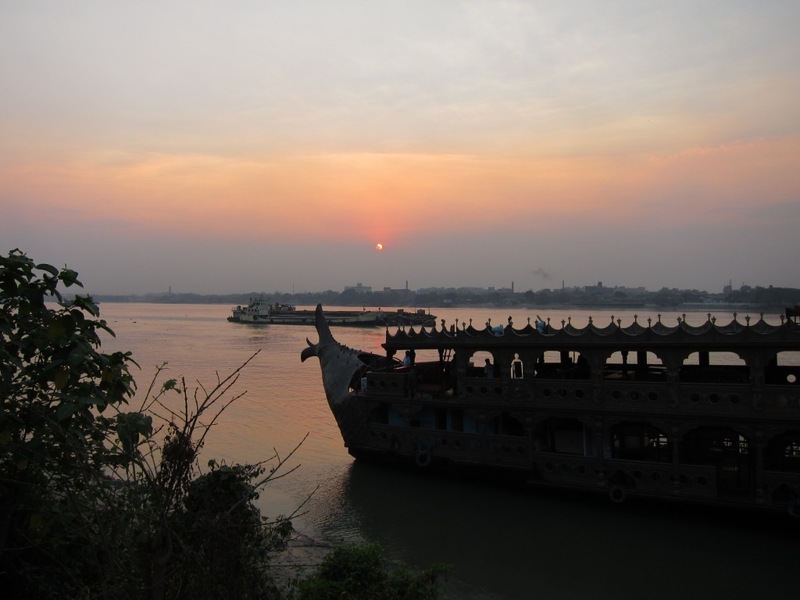 So, with that, I say adieu to Calcutta, off to see what I can find in the former colonies of the Portuguese. I’d like to be able to say that I came to Varkala because I wanted to live deliberately, to front only the essential facts of life, and thus not, when I came to die, discover that I had not lived. In truth, however, I mostly just wanted to go to the beach. I didn’t intend to spend so much time here, and to be honest, I’m a bit embarrassed at having stayed for a whole week in such a touristy spot, but some things came up that required a few days of consecutive computer work, and, having found a decent internet cafe, this seemed like as good a place as any to be stuck for a short time. Besides, I told myself, tourism is a big part of the Indian economy; in some ways this place is just as authentic as anywhere else. Unfortunately, the people selling Bob Marley blankets, bongo drums, and plastic auto-rickshaw toys made it hard for me to accept my own argument. 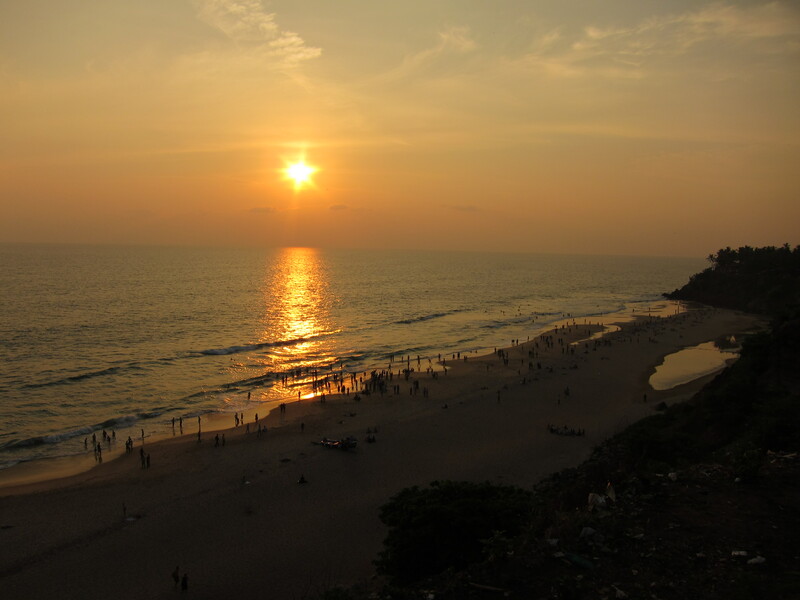 Varkala beach is a beautiful spot a few kilometers away from Varkala town. The beach is crescent-shaped, pitched below a crumbling cliff, along which are arrayed a packed strip of resorts, restaurants, guest houses and souvenir stalls, with a couple of steep stairways leading down to the beach. Although the area has some religious significance (the other name for the beach is Papanasam, which translates into something like “washes away sins”), and there is a fair bit of domestic tourism, Varkala Beach is the only place I’ve been to in India so far where Europeans outnumbered locals. Although the credibility of the sentiment is belied by the artificial nature of such a place, beaches always serve for me as a reminder of how little is required to enjoy life. The absence of more pressing concerns allow us to slow down and take our time. Exposure to the sun, sand and wind reminds us how well-isolated we normally are from the elements. And the unceasing waves of the ocean provide an endlessly fascinating phenomenon upon which to dwell. Though any amount of time at a beach will undoubtedly seem either too long or too short to some, a little time spent appreciating it provides vast rewards for the soul. 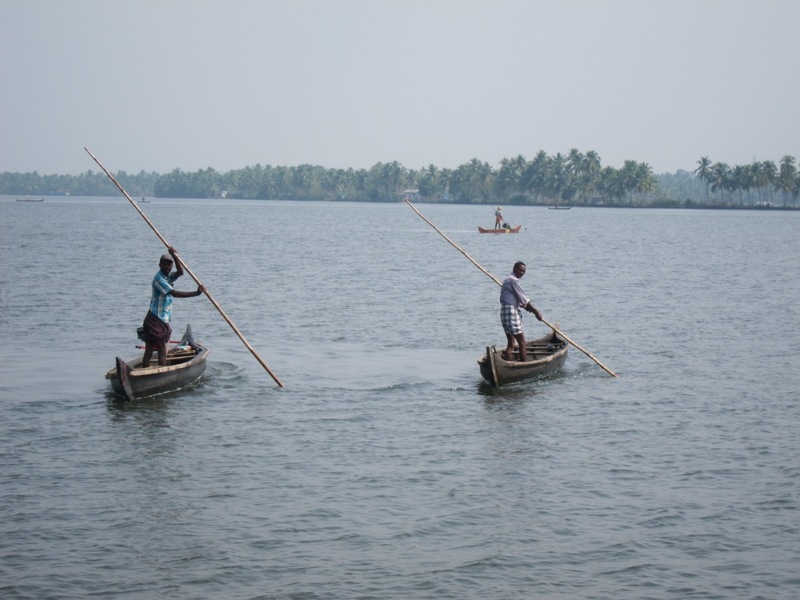 Beaches aside, Kerala as a state is yet another interesting face of India. 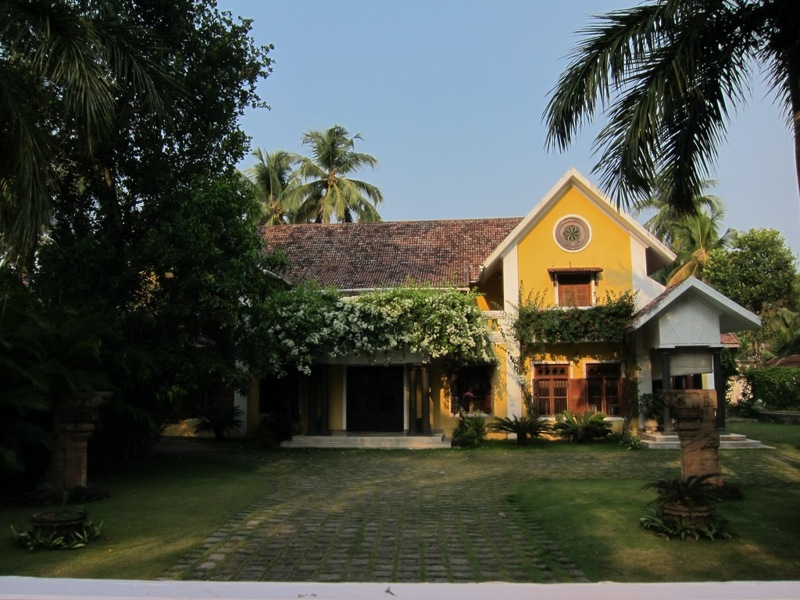 Located on the Western side of the Southern tip of India, the hot, tropical climate and lush greenery feels miles away from the mountainous Northern provinces. 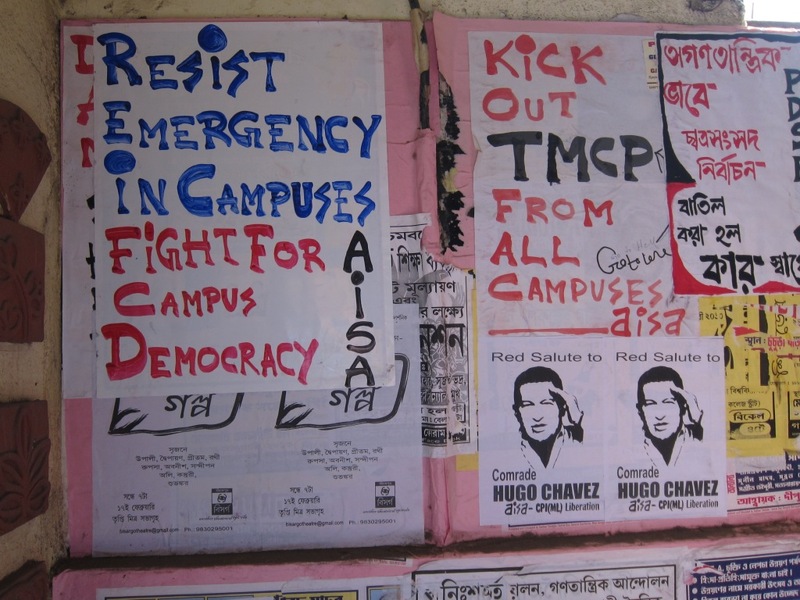 Famous for having the first democratically elected communist government in the world, it also has the highest literacy rate and life expectancy in India. Unfortunately, labour costs have also risen in tandem. Although economic growth seems steady, the government is also racking up a sizable debt, and unemployment is high. 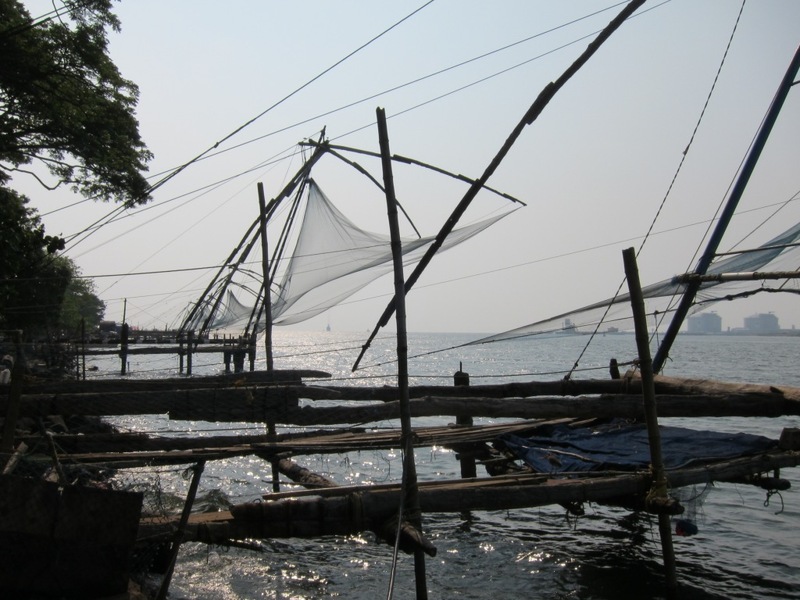 An important pillar of the economy is remittances, with many Keralans working in the Persian Gulf as maids, nurses, labourers, and engineers. 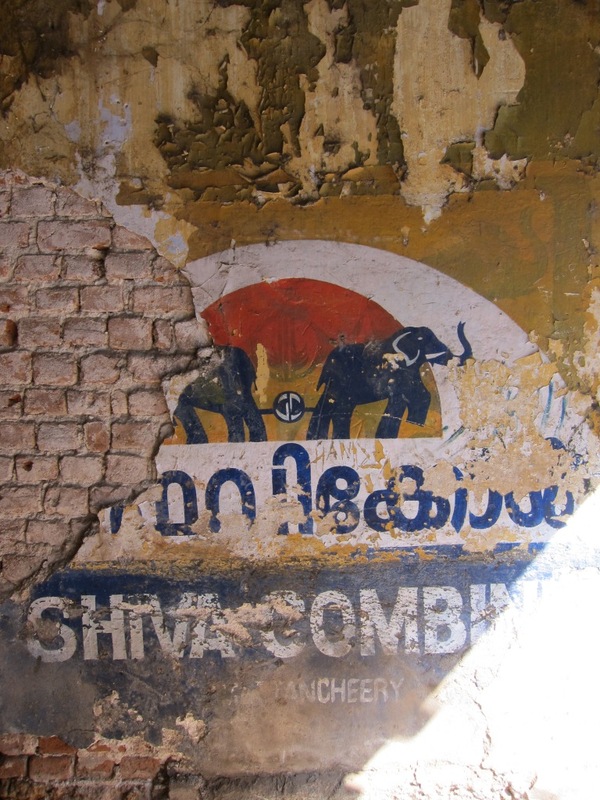 Alcohol consumption is also higher here than anywhere else in India, and according to the BBC, a remarkable 40% of the state’s revenues are derived from alcohol (taxes, liquor licenses, and a state-controlled distribution monopoly). 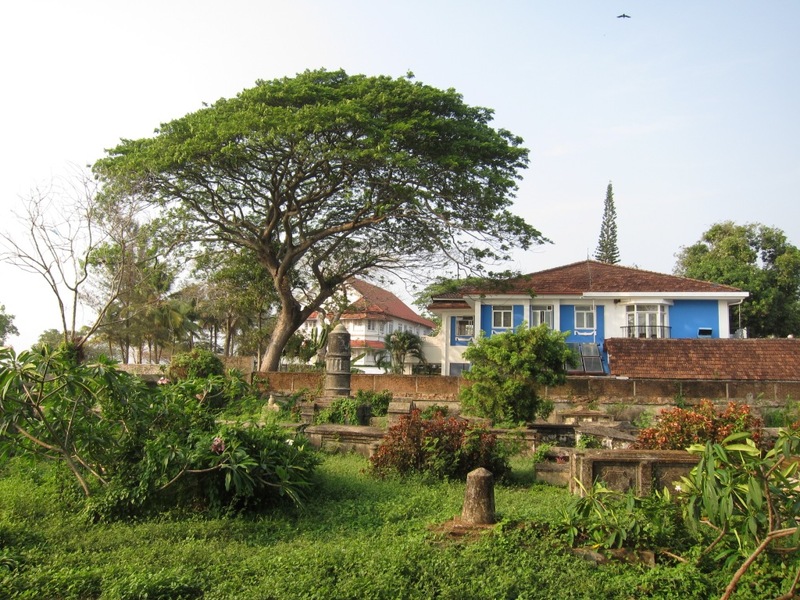 I arrived here via the capital city Trivandrum (formally known as Thiruvananthapuram), where I also spent a couple of nights. 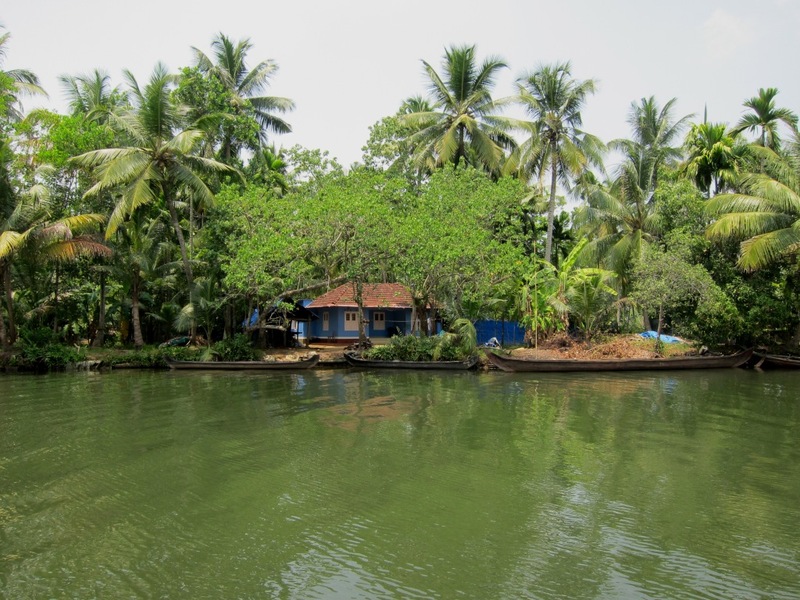 I immediately felt like I had come to the right place, as the plane descended from the hills, passing over jungle and tree cover stretching all the way to the water’s edge. The main street of Trivandrum was much like the other mid-size Indian cities I had passed through, but the surrounding alleyways had a very different feel, with eclectic architecture built up in what felt like moderately wealthy suburbs. I happened to be in Trivandrum on my birthday, and I was lucky enough to track down Sanker’s Coffee & Tea, which sells these products in bulk. I picked up a small bag of freshly ground Keralan coffee, mostly just to enjoy the smell of it, but also to make cups of cowboy coffee as necessary. 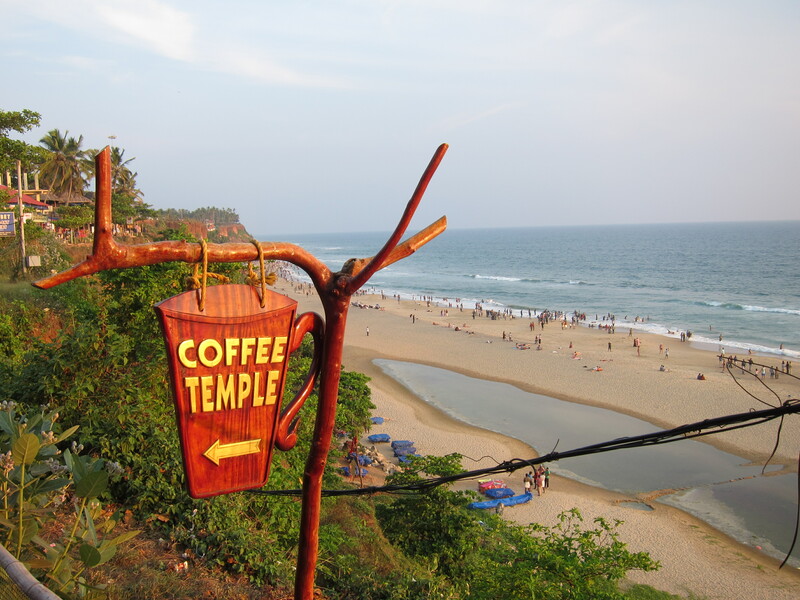 In Varkala, the options were both more numerous and less diverse. It’s hard to complain when the cost of everything is so low, but relatively speaking the food in Varkala was both over-priced and not very good, as visitors really have nowhere else to go. This place basically represents the antithesis of the philosophy that a business should do one thing, but do it well. Every restaurant here offered essentially the same “multi-cuisine” menu, featuring Indian, Tibetan, Chinese, pasta, pizzas, sandwhiches, and so on. It’s also a classic case of easily-copied innovation. 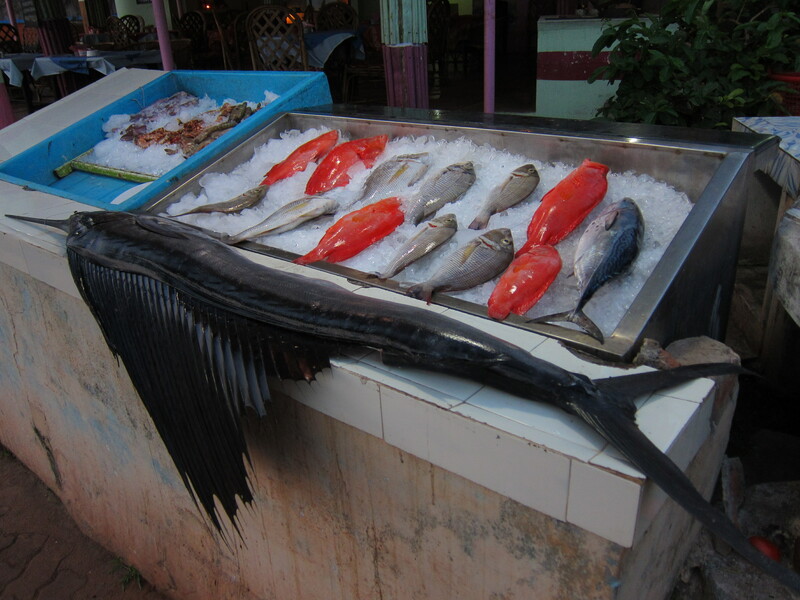 Every night at dinner time, virtually every restaurant puts out a selection of freshly caught fish and seafood, from which customers can select. The supply, however, always seemed to drastically exceed the demand. Drinks, on the other hand, reflected the state’s problems with alcohol. Not many restaurants here had alcohol on the menu, but most of them served it. I expect this is partly a matter of avoiding license fees, although it may also be that licenses are hard to obtain. In any event, it turns out that it’s way more fun to order a beer when the waiter brings it wrapped in a newspaper, pours half of it for you into a nondescript mug, and then hides the rest of the bottle under your table. On another occasion, the beer I ordered came to the table having been decanted into a teapot! 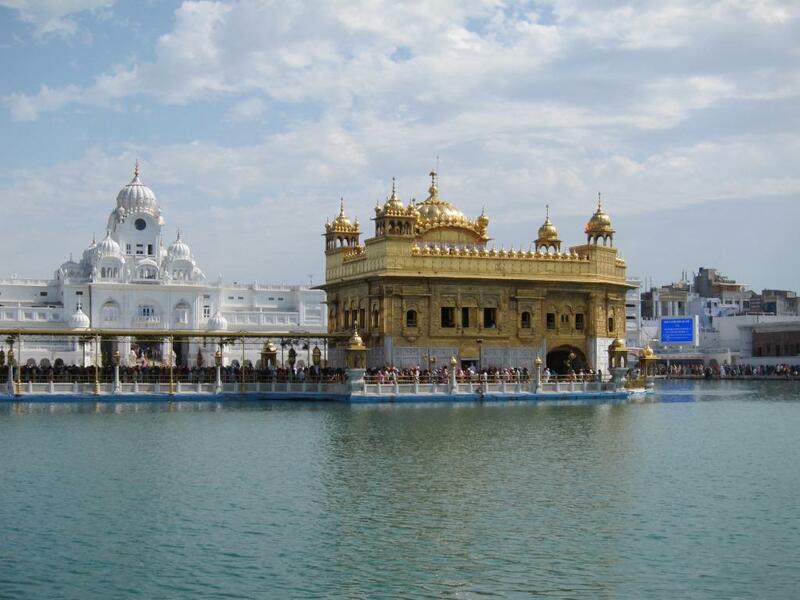 Suffice it to say, I worshiped here every morning – sometime a twice a day! It was somewhat tough to leave, but having concluded my work, I had no further excuse to linger, and I decided to head farther up the coast to Kochi, a place with more history and culture, but (hopefully) equally good coffee. 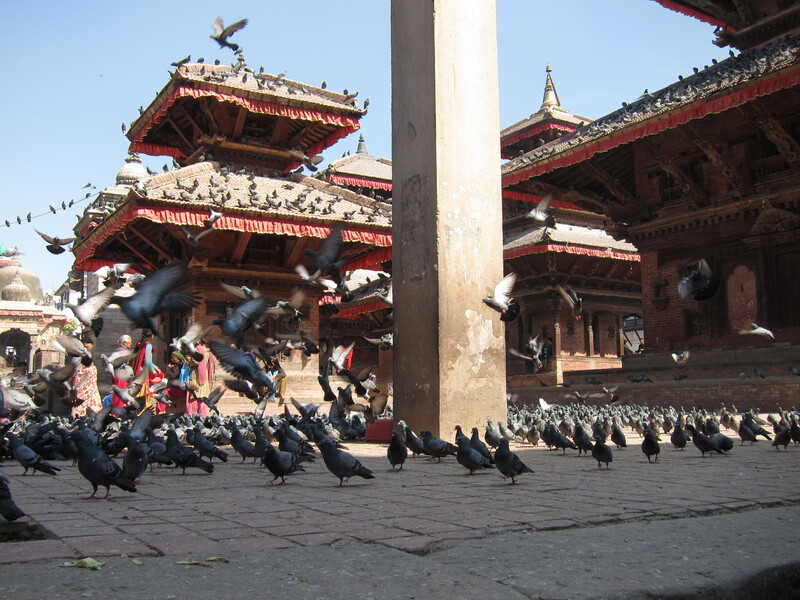 Returning to Kathmandu after six weeks in India felt, shockingly, like a breath of fresh air. What had previously seemed like chaos now seemed like relative calm. What had seemed like a gaudy tourist quarter was now a cozy enclave of convenience. 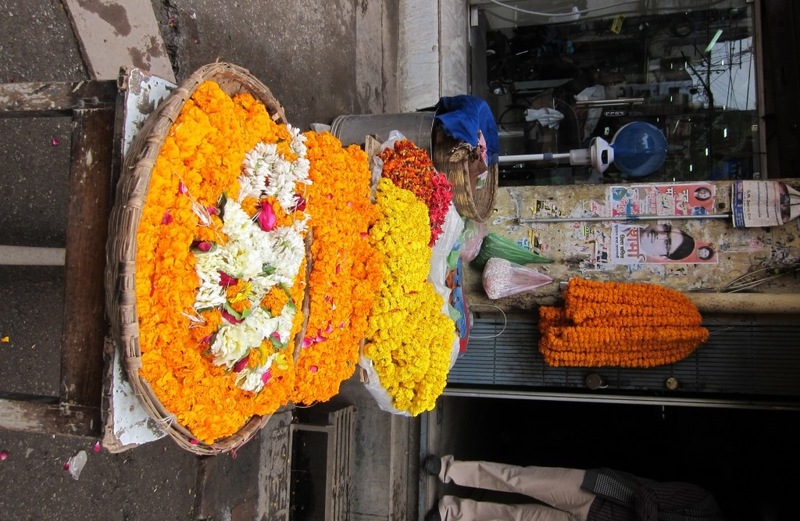 Most of all, despite the pollution, traffic, and touts, things just felt easy in comparison to the confusion, hassle, and tension often found in India. Although Kathmandu ended up being a great place to spend a few days getting organized, my main purpose in coming to Nepal was to go hiking in the Himalayas. As soon as I had my permits in order and felt ready to go, I hopped on a bus to Besisahar, the gateway to the Annapurnas. 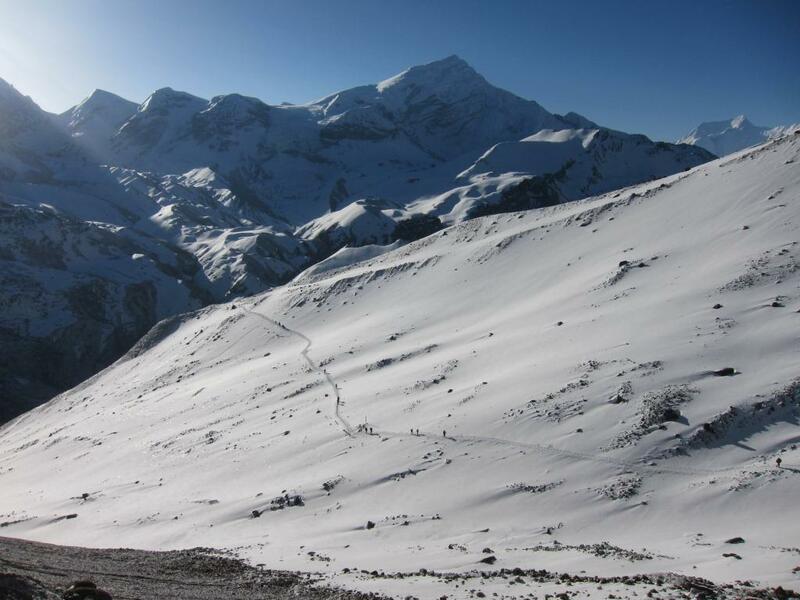 The Annapurna mountain range is a section of the Himalayas which includes 14 peaks over 7,000 m, most notably Annapurna I, which at 8,091 m (26,545 ft), was the first peak over 8,000 m to be successfully climbed. (“Successfully” must be interpreted somewhat generously, however, given the amputations suffered by the leader of the 1950 expedition, Maurice Herzog). 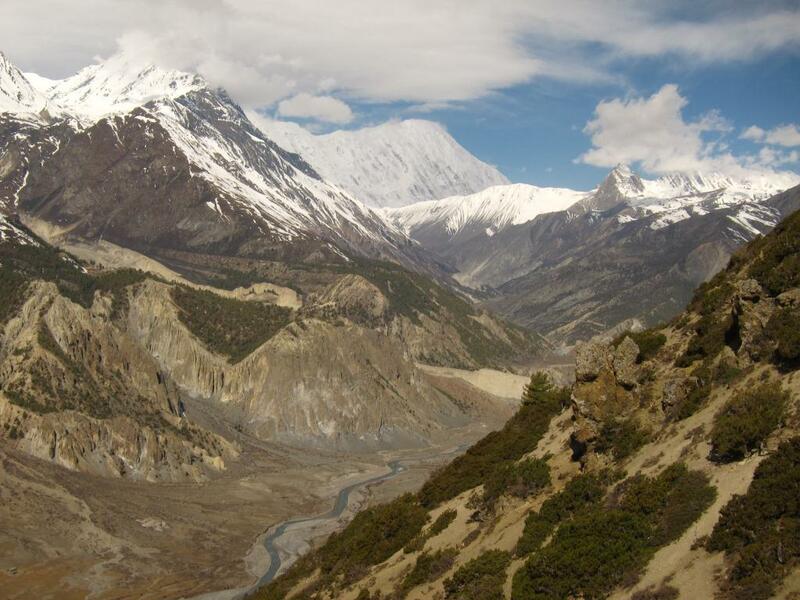 The Annapurna Circuit (AC), on the other hand, is one of the world’s great hikes, and along with Mt. Everest, one of the premier tourist attractions in Nepal. 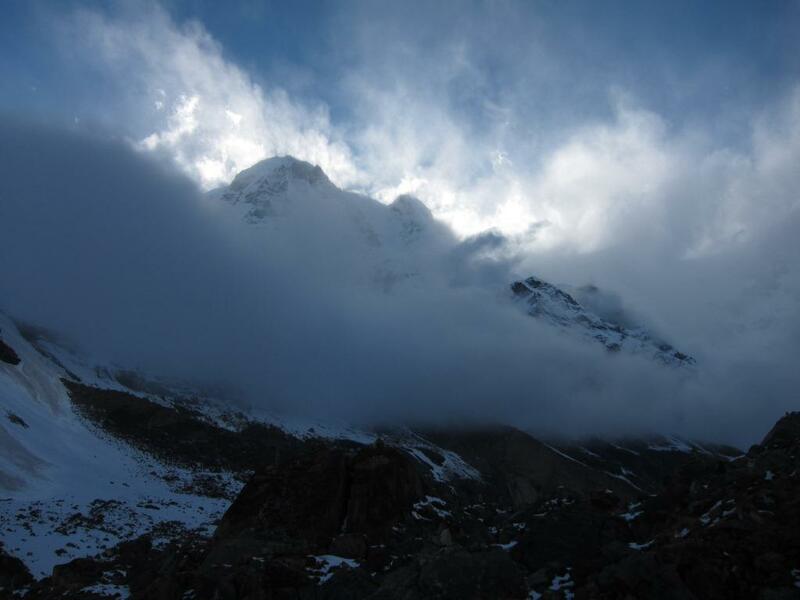 Beginning to the Southeast of the Annapurna range, it makes an almost complete counter-clockwise circuit around the mountains, ending up to the Southwest. Although it demands no climbing ability, the AC does involve crossing a mountain pass over 5,000 m, and requires you to carry everything you might need in the case of extreme cold, wet, and windy weather (assuming you are travelling without a porter). 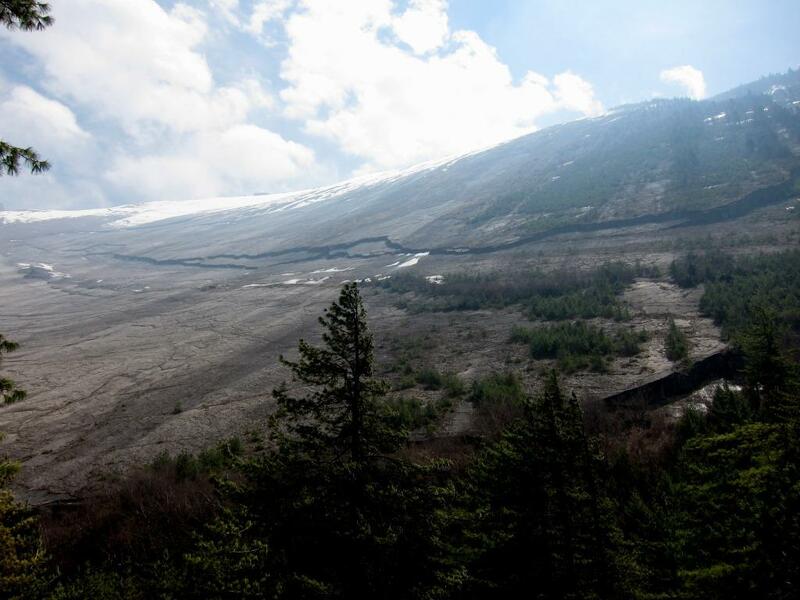 First opened to tourists in 1977, the AC quickly became famous as “teahouse trekking”, where one could walk all day and easily find a bed and a hot meal in a village teahouse. In other words, it’s the perfect hike for someone like me, who loves a challenging trek, but also enjoys a few luxuries at the end of the day, such as a bed, a hot shower, and perhaps a beer or a slice of apple pie. 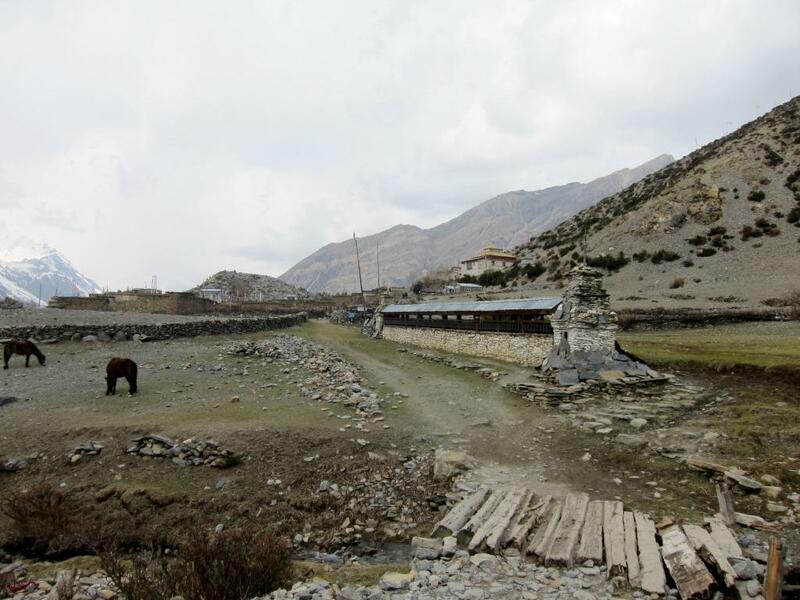 A great deal has obviously changed over the past 25 years, and today the AC is possibly more interesting as an ongoing “Integrated Conservation and Development Project” than for the remnants of traditional Nepali culture to be found along the way. 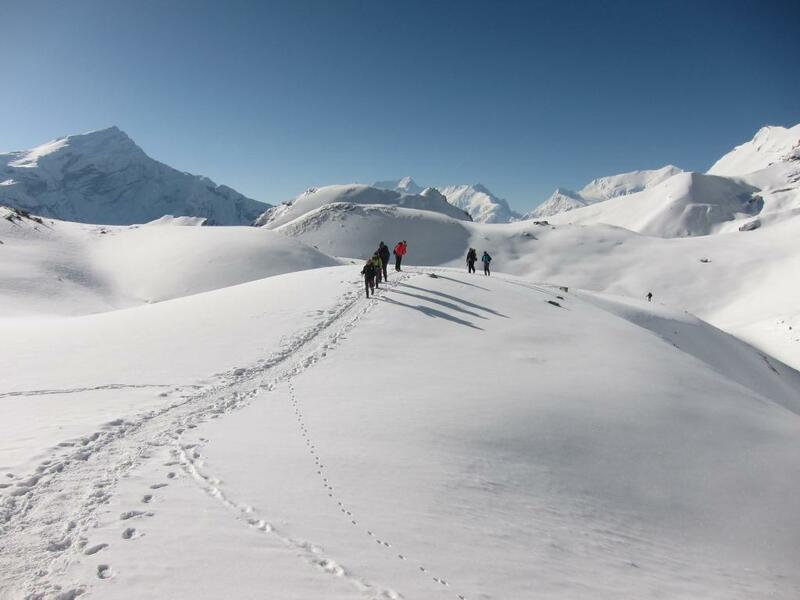 Nevertheless, the AC still offers an unparalleled opportunity to spend an extended period of time on the trail, to hike independently in the Himalayas, and experience the diversity of cultures in the valleys distributed around the base of the mountains. 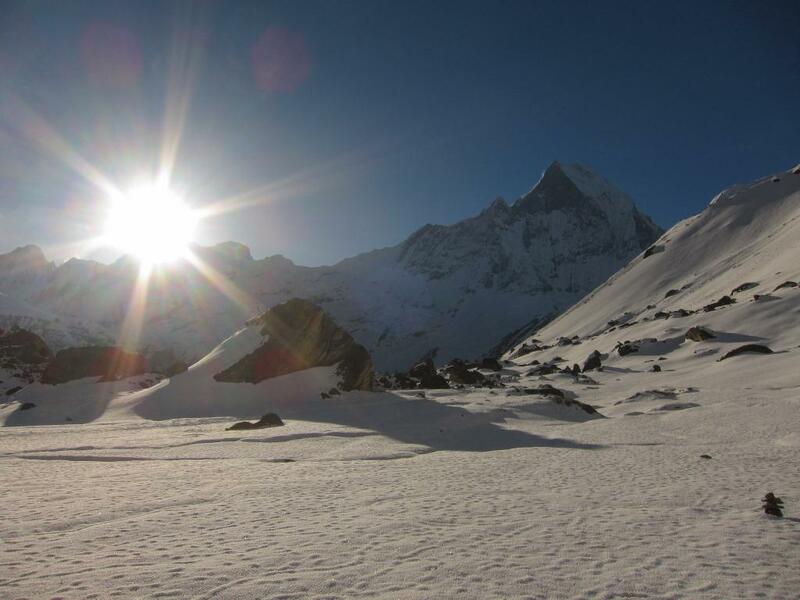 The other popular hike in the vicinity is the Annapurna Base Camp trek (ABC). 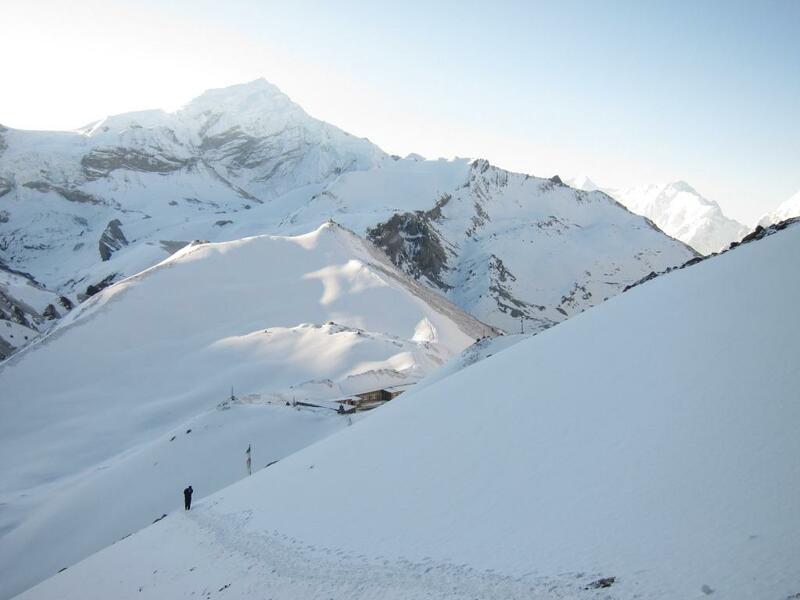 In less time it takes you straight North into the Annapurna Sanctuary, an incredible cauldron of snow and ice right in the heart of the Annapurna mountains. I ended up combining the two treks into one, for an epic hike of close to 300 km over 22 days. I had three reservations about hiking the AC. First, the altitude. 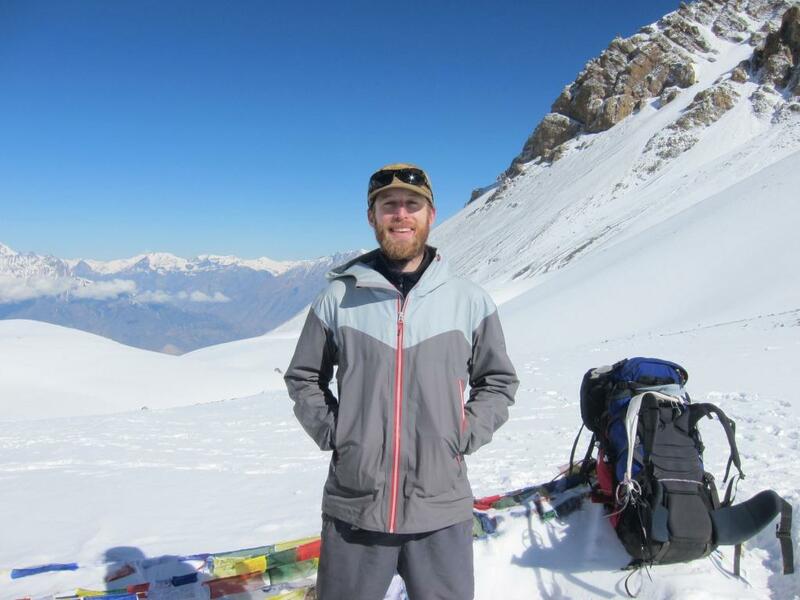 I had previously experienced some problems with altitude sickness above 4,000 m (cf. Peru, 2001), and this hike would involve going above 5,400 m. Second, the crowds. The AC is deservedly popular, and I was worried that it might be too crowded for my liking. Finally, the roads. 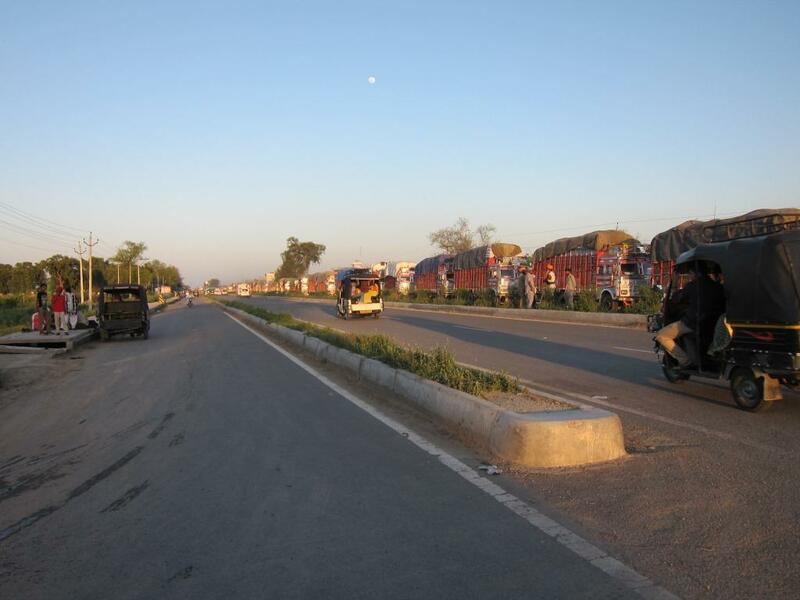 Nepal has been engaged in extensive road building to establish motorized transport connections between the various villages along the AC. 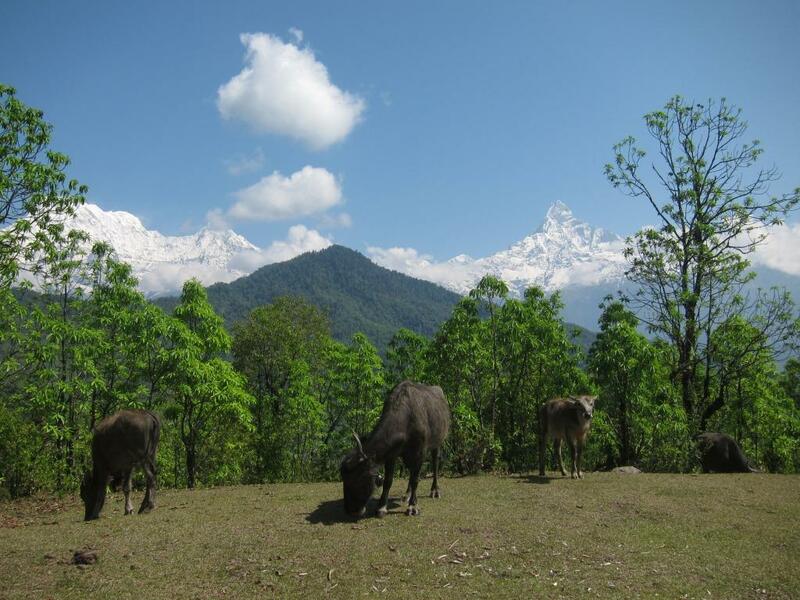 Although this may bring benefits to some of the people who live in the Annapurna conservation area, there were rumors that the roads had destroyed much of the trail, and the opportunity to experience local Nepali culture along with it. I am happy to report that I was pleasantly surprised on all three counts. 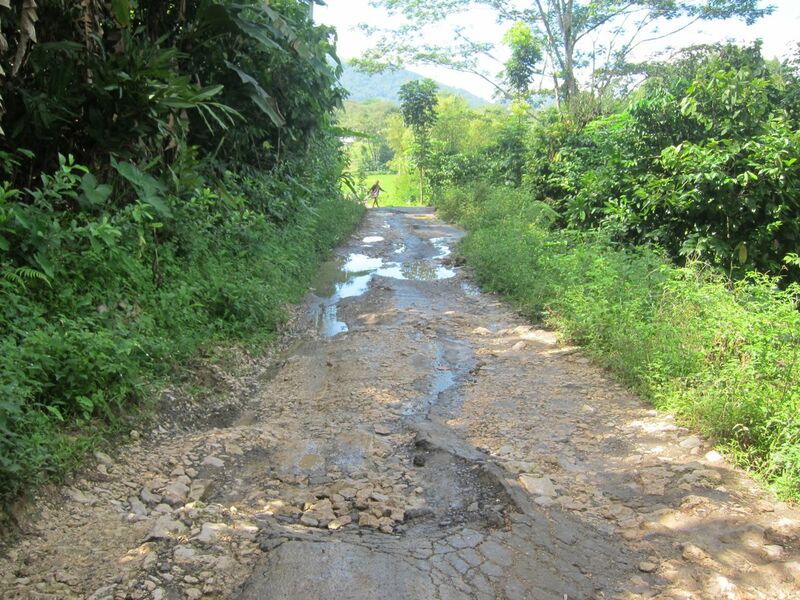 Extensive road building has indeed taken place (and continues), but the trail-making is even more dynamic, and the AC still offers a first rate trekking opportunity. 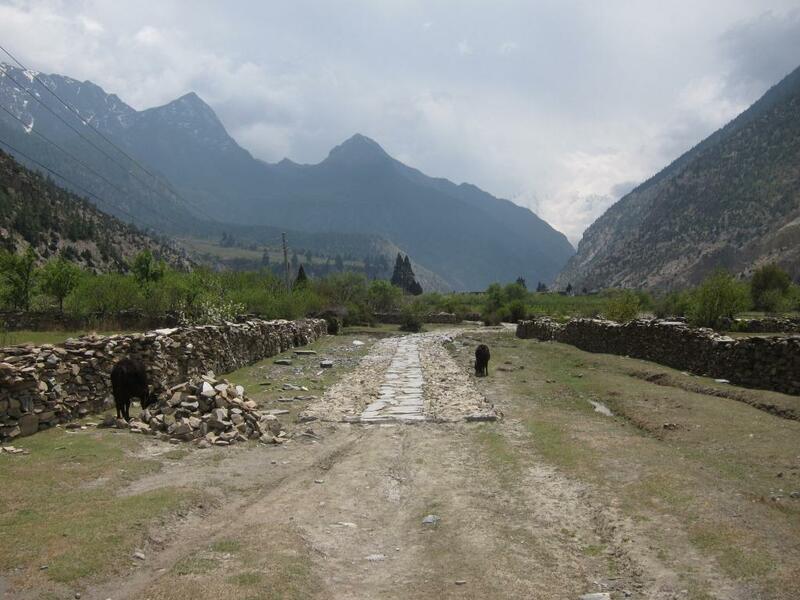 Although it requires a bit more of an exploratory spirit, one can avoid the road almost entirely, and there are fantastic opportunities to get away from the main trail to visit more isolated villages, with the same incredible scenery. As for the crowds, I was shocked by how few people there were. High season is in the fall (October and November), when you are more likely to get those picture-perfect days, with snow-capped mountains against a deep-blue sky, but April is the second season, and I was expecting the trail to be inundated with people. Things did get quite crowded at the bottlenecks, such as Throng La pass and the Sanctuary, and there were a significant number of tour-groups, especially on ABC, but overall the trail was surprisingly empty, and there were even a few days when I saw just one or two other tourists. Partly this is an effect of the roads. More and more people now do a shortened version of the AC, travelling by jeep to skip the first part, and then escaping by bus or plane as soon as they have made it over the pass. To me this misses the whole point of the hike. The AC is wonderful because it allows you to spend so long on the trail, hiking as far as you please each day and being sure of finding wonderful hospitality wherever you feel like stopping. Moreover, a quick trip over the pass without the necessary acclimatization is quite dangerous. Altitude sickness is a serious concern, and many people don’t take it seriously enough. As for myself, I had almost sworn off going above 4,000 m, but I decided to give it one more try. This time, however, I would do it right, giving myself enough time to properly acclimatize. The AC is perfectly set up for this, as it takes you up fairly gradually, allowing you to comfortably ascend roughly 500 m per day (the recommended rate, in terms of the altitude at which you sleep), and includes some great side trails, allowing you to take even more time once you get above 3,500 m.
“Annapurna” apparently means “full of food”, and indeed, there was a surprisingly large selection available on the trail, including pizza, pasta, momos, and so on. The true staple of the AC, however, is the traditional Nepali dish, Dal Bhat. Available everywhere, and eaten by many Nepalis every night, the dish consists of lentil soup (dal) and rice (bhat), served with a potato and vegetable curry, a papdum, and if you’re lucky, a pickle (a nice, spicy pickle really makes the meal!). More importantly, it typically comes with bottomless refills (although I was occasionally denied thirds), so it’s the best way to fill up after a long day of hiking. The best part about it was that there was a surprising amount if variability in the meal, especially in the dal and the curry, even though the essential structure remained the same. I’m pretty sure I had it for dinner every night, except the day I came over Throng La pass, when I opted to change things up with a yak sizzler. I’m hoping to eventually write up a day-by-day account of my hike, mostly as a resource for future hikers, but in the meantime, here is a summary account. Unfortunately, like everyone else, I was forced to make some hard choices about what to bring and what to leave behind. Sadly, in an effort to keep the weight of my bag down, my audio recorder didn’t make the cut, so you’ll just have to use your imagination with respect to the sound. This was the start of the trail for me, the first of many Temple of Doom-style bridges (most of which were all metal, but some of which were made of wood, with metal cables), leaving a dusty bus parking lot in Besisahar. I knew that many people were planning to skip the first day, and travel by bus to Bhulbhule, but after 6 hours in a cramped bus from Kathmandu, I was happy to rely on my feet. It took me a while to find the actual (current) start of the AC, but once I did, I was off to the races, following a well marked trail, emblazoned with the red and white Annapurna Circuit trail markers. Much to my surprise, I didn’t encounter any other hikers on the first day, and I honestly started wondering where all the people were. I ended up spending the first night in the small village of Ngadi Bazaar, having accidentally passed through Bhulbhule without even realizing it. My accommodation the first night was quite simple, just a concrete-floored room with corrugated iron walls and roof, but it was right next to the river, and I had it all to myself. 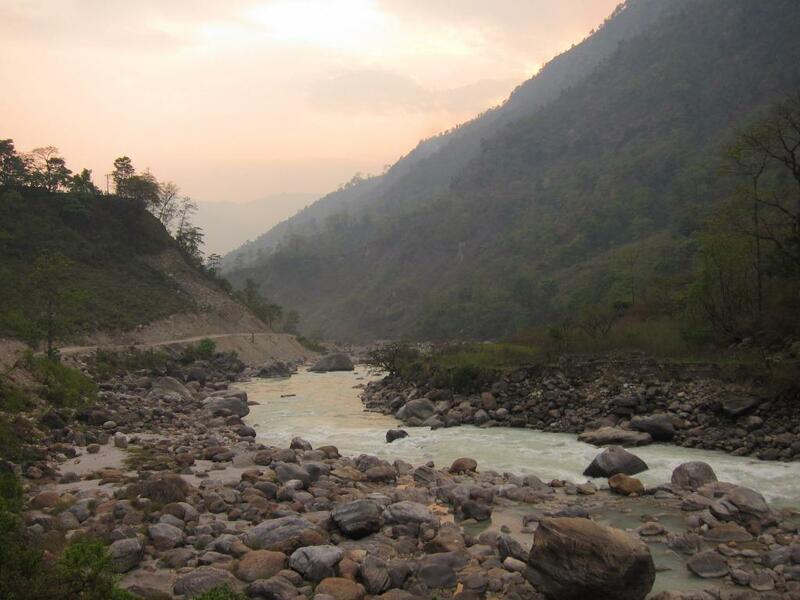 On the Eastern side of the mountains, the trail follows the Marsyangdi river upstream towards its source, gradually gaining altitude, and crossing back and forth across the river as necessary (not so good for those with a fear of heights). I finally connected with a some fellow-hikers on the second day, the first of many groups I met that had formed spontaneously on the bus from Kathmandu. Personally, I liked to get an early start, hiking by myself for most of the day (and occasionally passing a few people), secure in the knowledge that newly-met friends would be coming up behind me, with whom I could spend my evenings. 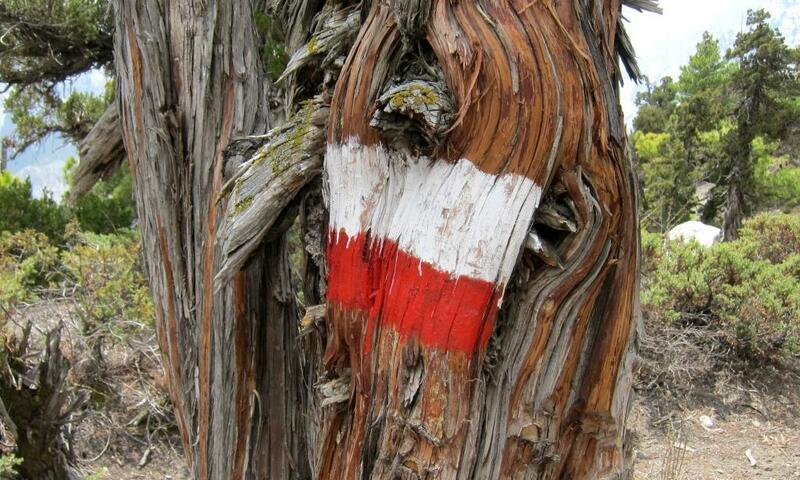 There was great variety in the people hiking the trail, with the oldest person I met being 74 years old. On the third night, I ended up staying at “Hotel Super View” in the small town of Koto. 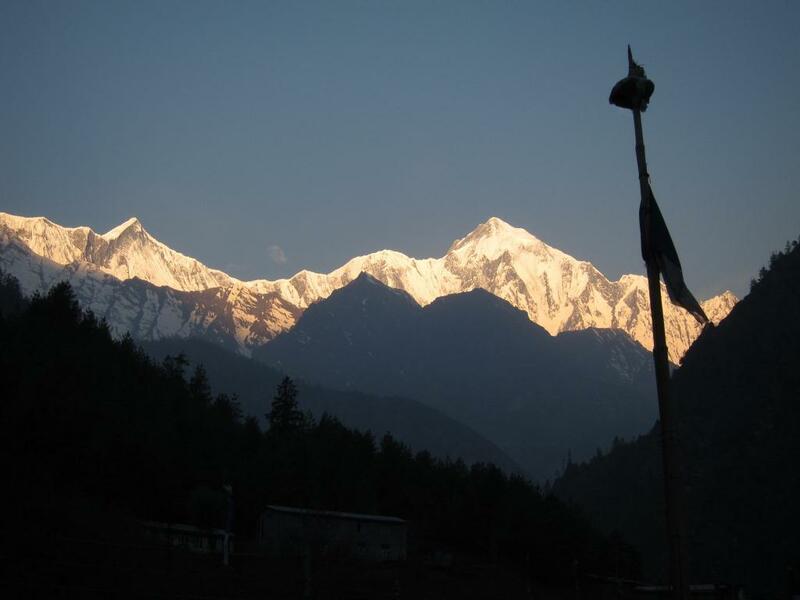 True to its name, on the morning of the fourth day, I awoke to my first unclouded glimpse of the Himalayas, including Annapurna II, still partially shaded by other mountains to the East. The fourth day also included one of the most impressive features on the trail, an enormous glacially-sculpted rock wall known as Paungda Danda. 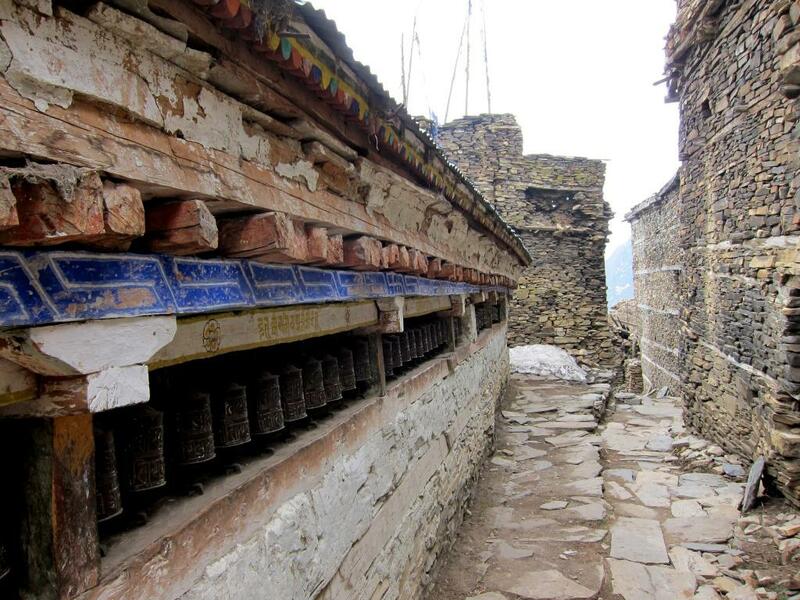 The settlements on the Eastern side are predominantly Buddhist, and the trail passes through many traditional stone villages, replete with typical Buddhist architecture and iconography, including small Stupas (reliquaries), Gompas (monastaries), and prayer-wheel walls. 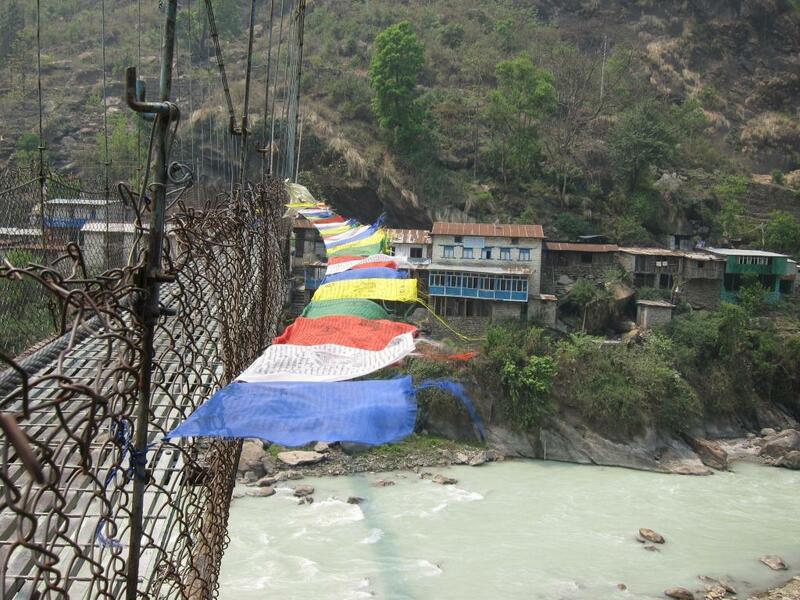 Some of the best examples were to be found in and around the towns of Upper Pisang, Ghyaru, and Ngawal. 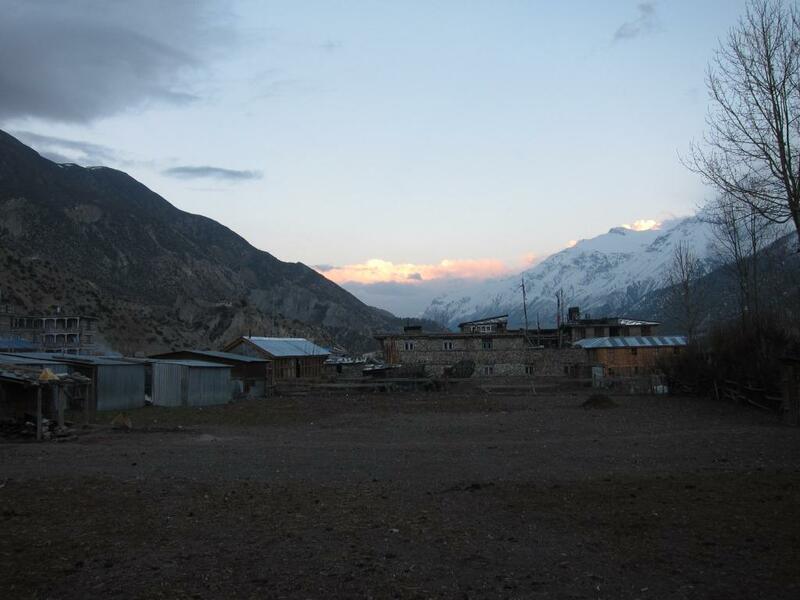 By the time people reached Manang, a strong sense of community had begun to develop. 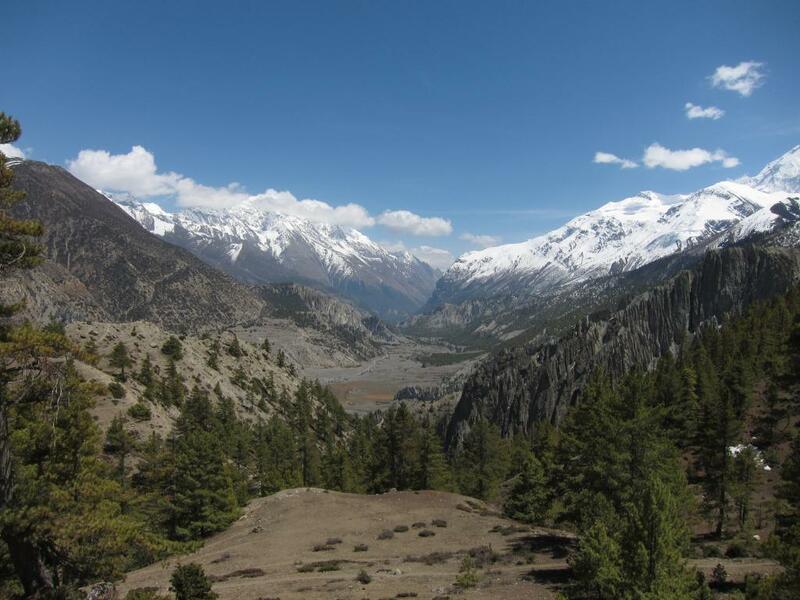 At 3,500 m, Manang is itself surrounded by spectacular views, and high enough for the air to be getting quite cold. In general, the coldest time of day was at the end of a day’s walk, once you had arrived at your unheated hotel. Although I was lucky enough to get a warm shower on most days of trip, the afternoons and evenings spent in the high altitude lodges were admittedly chilly, and I made good use of both my down sleeping bag, and all the layers I was carrying. One notable side trail from Manang is to Tilicho Lake, which I’ll describe in more detail in the day-by-day account, but suffice it to say that it was a fascinating section of trail, but also by far the most dangerous, and it was one day that I was happy to be hiking with a group. 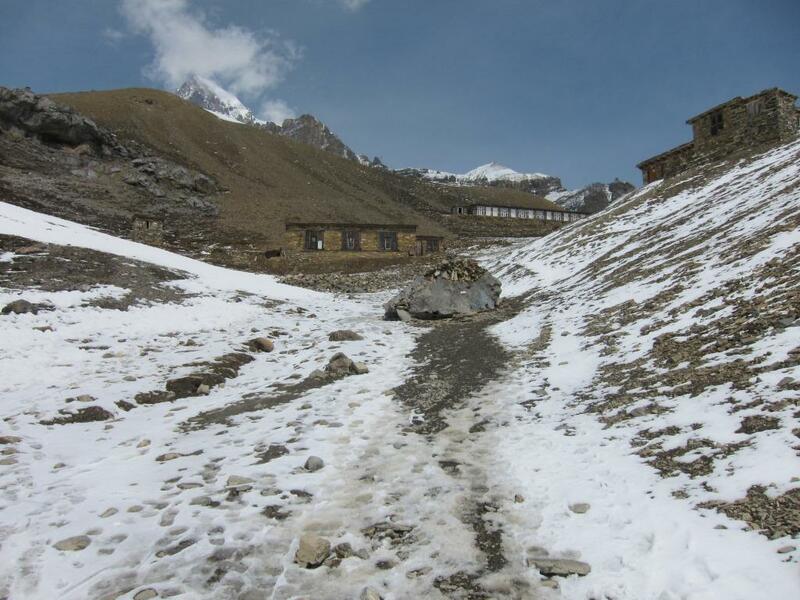 From Manang, the trail gradually climbs up another 1,500 m to High Camp, which, at nearly 5,000 m, is the last place to stop before crossing Throng La pass. 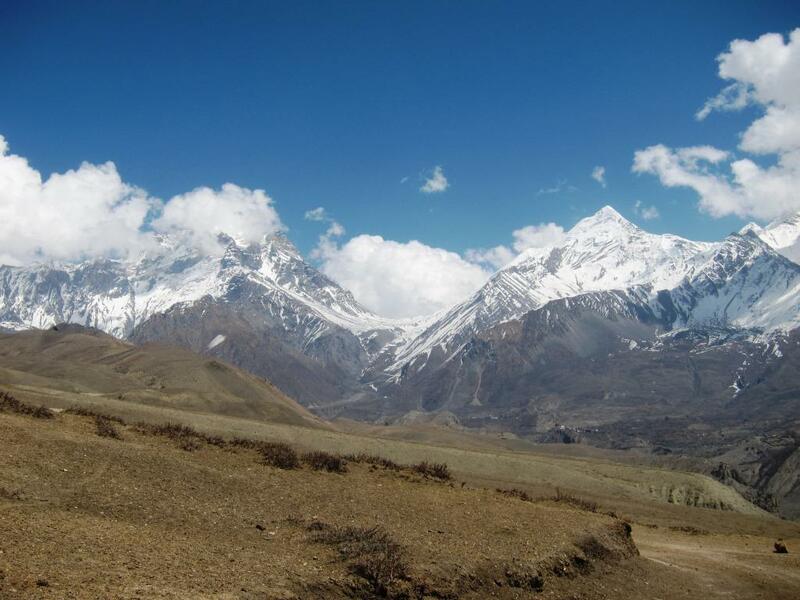 Another option is to stay in Throng Phedi, which at 4,500 m is potentially an easier choice in terms of acclimatization, but makes for a much longer hike the next day. I met at least one person who was on the trail for 11 hours making the crossing. High Camp was not an unpleasant place, although it was undeniably cold, and all the running water was all pretty well frozen. 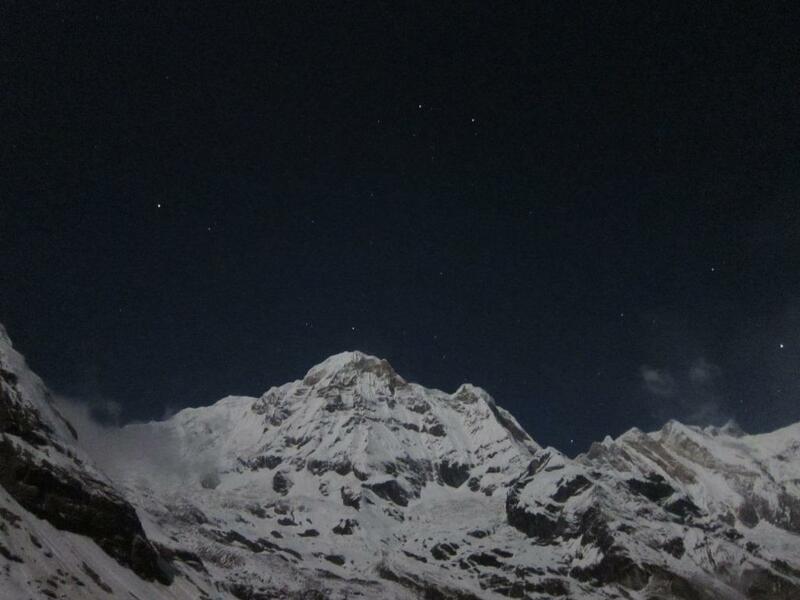 On the night I stayed there, High Camp was full, with a few people forced to sleep in the dining hall. By 4:00 pm that afternoon, as everyone huddled in the unheated, glass-windowed space, trying to stay warm, snow began to fall, and there was much concern over the possibility of crossing the pass the next day. With great fortune, however, we awoke to an incredibly bright, clear morning sky. The day spent crossing Throng La pass felt the most like real mountaineering. From High Camp it was about 500 m uphill to the high point of the pass at 5,416 m (17,769 ft), walking over well-packed snow the whole way. I had fairly early developed a reputation as a fast walker, (sometimes deserved, sometimes not), but ultimately the altitude slows everyone down. Above 4,500 m or so, the lack of oxygen means that every step becomes a challenge, and there’s nothing to do but fall into a rhythm and keep on going. For me, I found the right pace was something like one step every second, and one breath (in and out) every two steps. 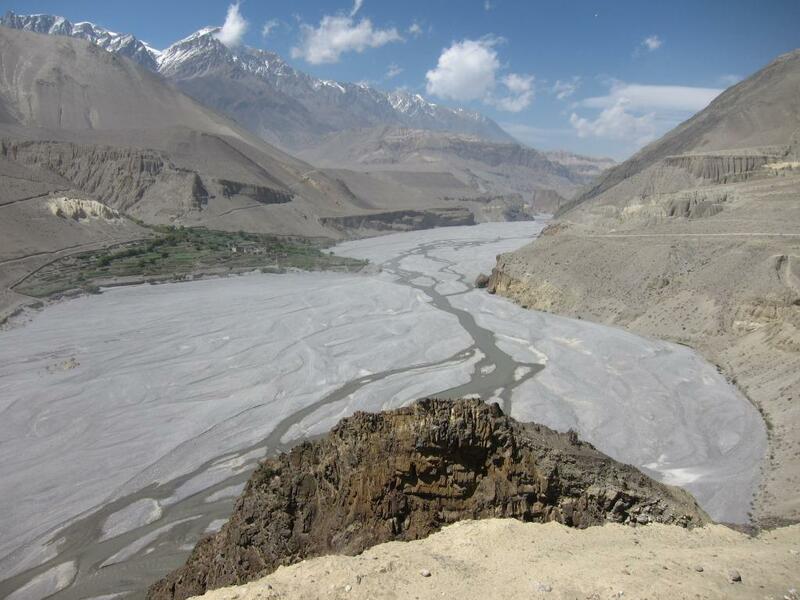 From Kagbeni, a road follows the Kali Gandaki river South to Jomsom and beyond. 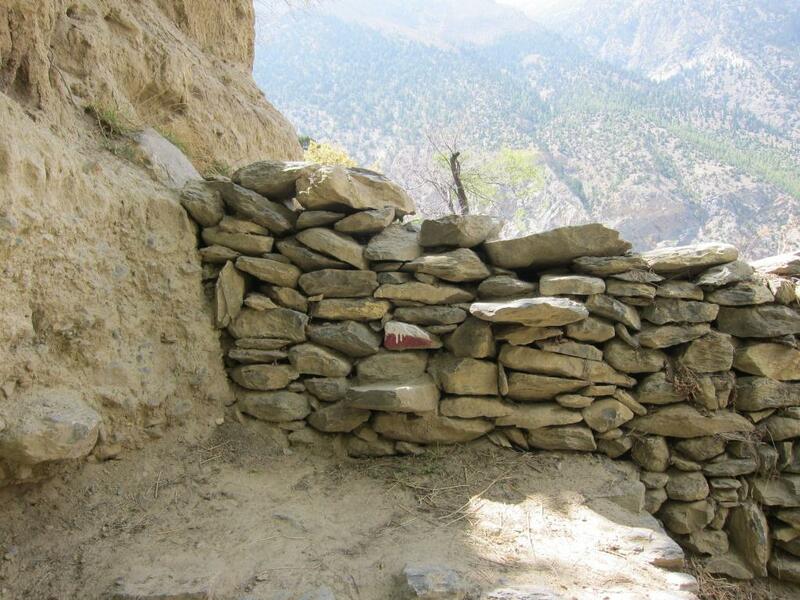 The road has essentially been built over the original Annapurna trail on the West side of river, but happily, a new trail has been reestablished on the opposite bank. 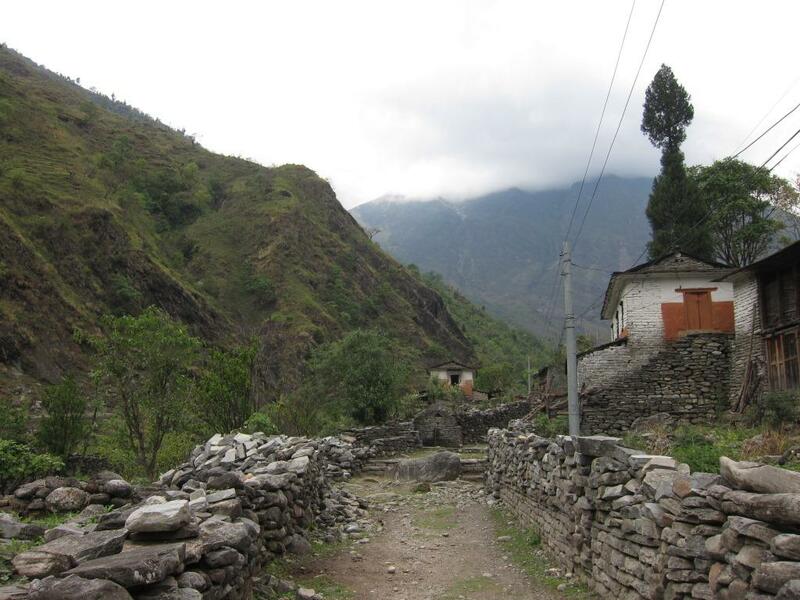 Because so many tourists end their trek here, it suddenly felt like the first day again, with a virtually deserted trail passing through little-visited towns. The Western side of the mountains is much more lush and forested, and the next few days were pleasantly cool and cloudy. There was also one very cool Indiana Jones moment on the Western side, where the trail seemed to dead-end at a rock wall emblazoned with the Annapurna flag, with nowhere to go, left or right. Going over seemed like the only option, through highly unconventional for the trail. Sure enough, as I got a bit closer, it turned out that there were rocks sticking out of the wall, functioning as stairs, which could not be readily seen from head on. By the time I reached Ghorepani, near the South end of the Western side, I was hiking up into the clouds and ended up in the middle of a rainstorm that lasted for at least forty hours. Around this time, more than two weeks into the trek, I also felt like my body had consumed all of it’s fat reserves, and was moving onto other things, so I made a conscious effort to start eating more. As I hiked over a small pass named Deurali (just 3,090 m), the rain turned to snow, making very picturesque scenery all the more beautiful.The rhododendrons were in full bloom, and as the snow gathered at the base of the trees, the entire trail glowed with a pinkish light. 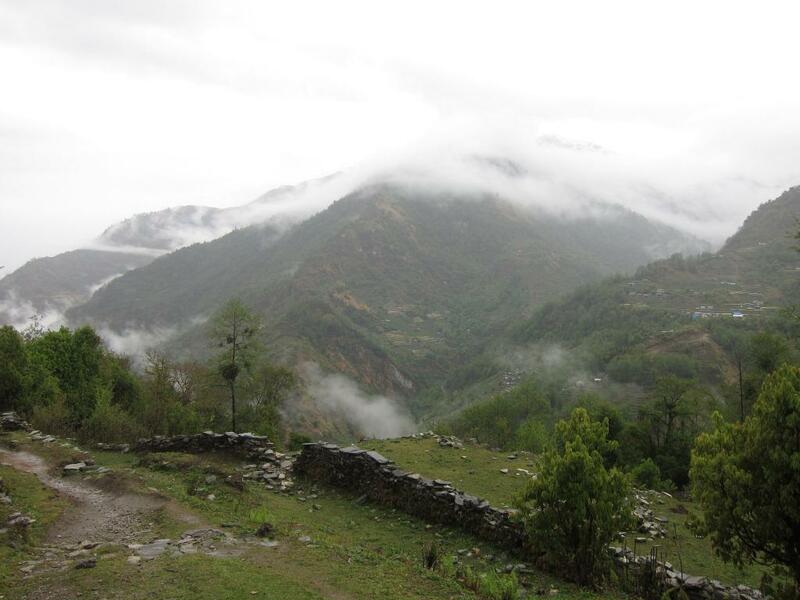 Once I was over Deurali pass, the weather improved, and I linked up with the ABC trail. 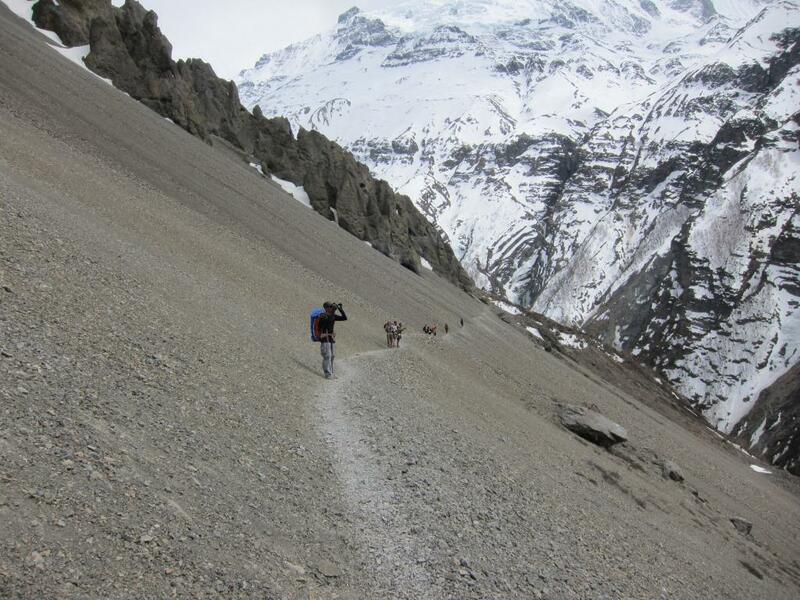 Overall, the Annapurna Circuit was superior to the ABC trek in almost every way. Although it is undeniably more scenic in parts, the ABC is overloaded with tour groups, involves a lot of going up and down well-manicured rock stairs, and offers fewer opportunities for side trips and independent exploration. Moreover, the cultural aspect is almost completely absent, as many of the “villages” you pass through are little more than concentrations of hotels. It felt to me a bit like a broken escalator designed to get tourists into the mountains as fast as possible. 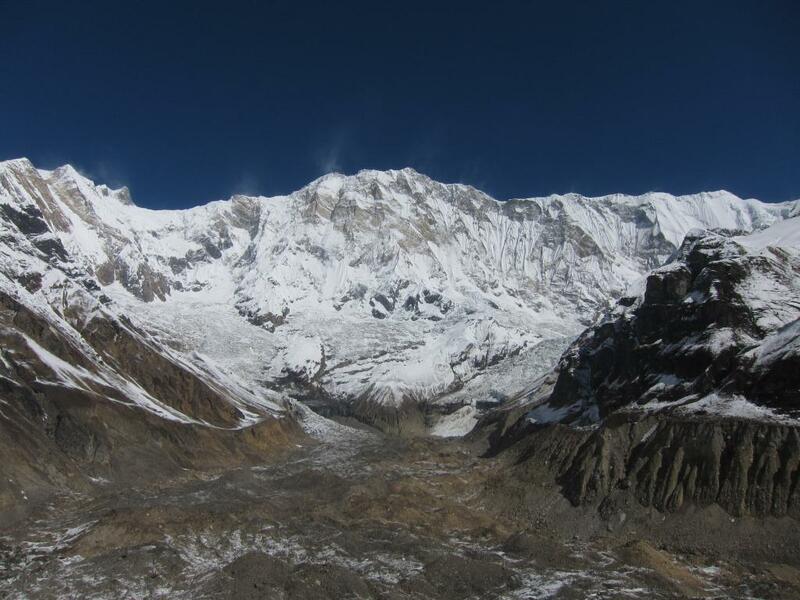 I must admit, however, that the Annapurna Sanctuary itself is possibly the most beautiful place I’ve ever been to, and dwarfs anything on the AC in terms of sheer natural beauty. It was awfully hard to leave the Sanctuary, but I had been so fortunate with the weather, it seemed best not to pressed my luck, and I began the journey back home again along the same trail I had come up. As if they hadn’t already demonstrated their full power and glory, on my last night on the trail, the mountains treated me to a truly awesome sound and light show, in the form of enormous rolling thunder storms. Initially directly over head, with great bolts of lighting striking nearby, I spent hours in the dark, watching as the storms moved further down the valley, eventually becoming distant flashes in an otherwise lightless sky. Finally, on the very last day, I got some fantastic panoramic views of the mountains from which I’d come, and it occurred to me that my end point (Phedi) would be an excellent place from which to begin the hike. Coming down from the mountains was a somewhat melancholy journey. Now that I’m back in civilization, life on the trail, which had begun to seem so normal, quickly begins to feel strange and remote. The last couple of days in particular, were very hot and humid, and I was reminded of Herzog’s own retreat from the mountains, happy to have all my fingers and toes intact. As if to hammer the point home, a porter ran past me while I was taking a rest, carrying a tourist on his back, a seemingly unnecessary, if unsurprising, exertion on a trail routinely frequented by donkeys. Overall, the best thing I did along the trail was to take moments now and then to stop, breathe, and attend to the gradually changing scenery, the smell of the earth and the air, and the sounds of the wildlife and the wind. This has been a long post, but I thought I’d end with a Buddhist poem that I encountered along the way. Like a torrent down a steep mountain. Travelling from Kathmandu to Jakarta felt something like being transported into the future. The difference was most evident during a brief stopover in the Bangkok airport, with its 21 automated baggage carousels and enormous halls made of seemingly weightless metal and glass. 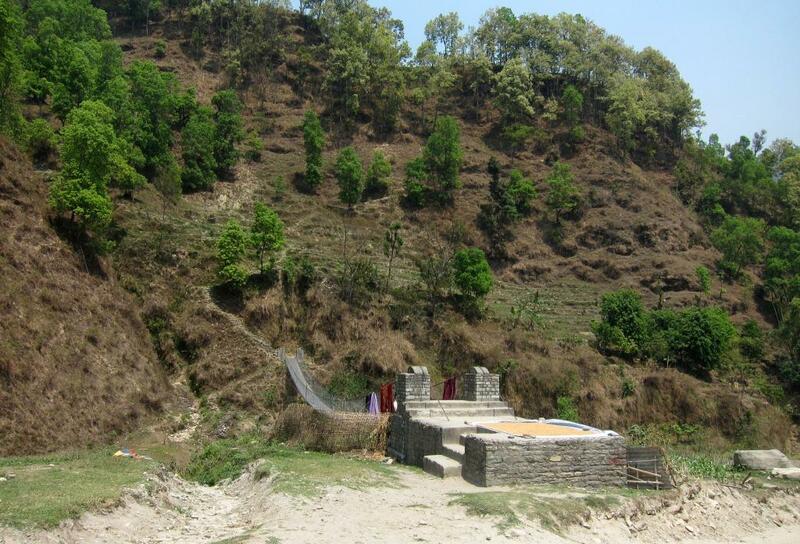 After spending so much time in the stone villages of rural Nepal, the process of extracting the raw materials required for this building and transforming them into their final form seemed to defy imagination. The airport in Jakarta doesn’t compare to the one in Bangkok, but at least in the arrivals area, it still seemed incredibly bright and modern compared to what I was expecting. I was last in Indonesia almost exactly ten years ago. At that time the immigration area was just a large open room. I distinctly remember being the only Western tourist in line, as well as being about a head taller than everyone else, and therefore able to see directly into the eyes of the immigration officers from the back of the room. This time, much to my surprise, the process was as simple as buying a visa on arrival and getting a sticker and stamp. I collected my bags and exited the terminal without incident. Other things have not changed as much, however. 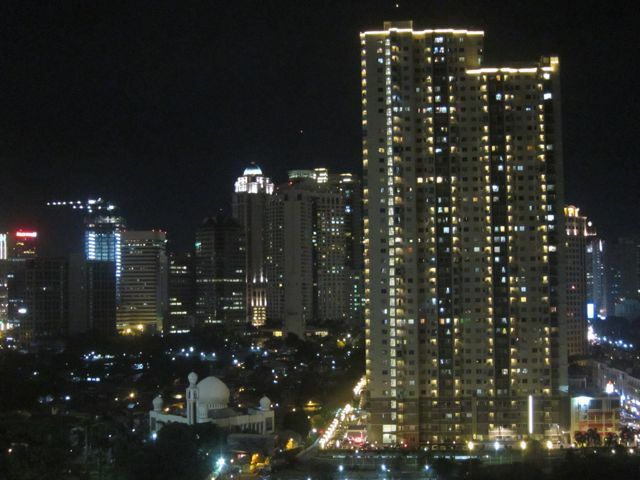 Jakarta is still a vast, sprawling metropolis with huge boulevards and no sidewalks. The traffic is still impossibly congested, with motorcycles filling every available space between the cars, and I still somehow managed to get scammed by an airport taxi, despite having very clear directions on how to avoid it! This time, I had come to Indonesia primarily to visit my friends Nick and Sharmila, who have been living in Jakarta for the past year. The plan was to spend a few days in the city and then head off to do some scuba diving, with me continuing on independently when they had to return to work. Looking out over the city from their balcony on the 17th floor (actually more like the 14th given all the unlucky and therefore absent floor numbers in the building), I was immediately reminded of the dystopian future of Blade Runner. (Photos will have to wait until later, unfortunately). The air was thick with haze and smog. Giant, gleaming skyscrapers had been built in clusters throughout the downtown area. At night the lights from these buildings appeared as floating neon castles in the sky, with the murky air only partially obscuring the people living in shanty towns on the ground below. At that moment, it would not have surprised me to see a glowing airship flying between the buildings. On my first night in town, we went to an art opening by a photographer friend of Nick and Sharmila’s. The artworks echoed the feeling of the city – fascinating portraits of endemic plant species captured through the distorting lens of a soap bubble, and then printed on plastic sheets and lit from behind. It was a fun chance to get a glimpse of the contemporary art scene in Indonesia, and mingle with the hipsters in from Yogyakarta. On the second day, we attended a Kentucky Derby party hosted by one of Nick’s colleagues. Although the results had been announced in the morning papers, it was still a dramatic race. Best of all, the host did an unbelievable job of bringing Kentucky to Jakarta, with Hot Browns, Mint Juleps, and several types of bourbon on offer. The party was mostly attended by people in the American expat community, and it was fascinating to learn about some of the peculiarities of life in the capital, where hired help is the norm, everything is a taxi ride away, and a trip to the airport can take anywhere from twenty minutes to four hours, depending on traffic. On my third day, I launched a brief sortie against the Indonesian bureaucracy, in an attempt to extend my visa. A website I found laid out all the steps required and made the whole thing seem quite simple. 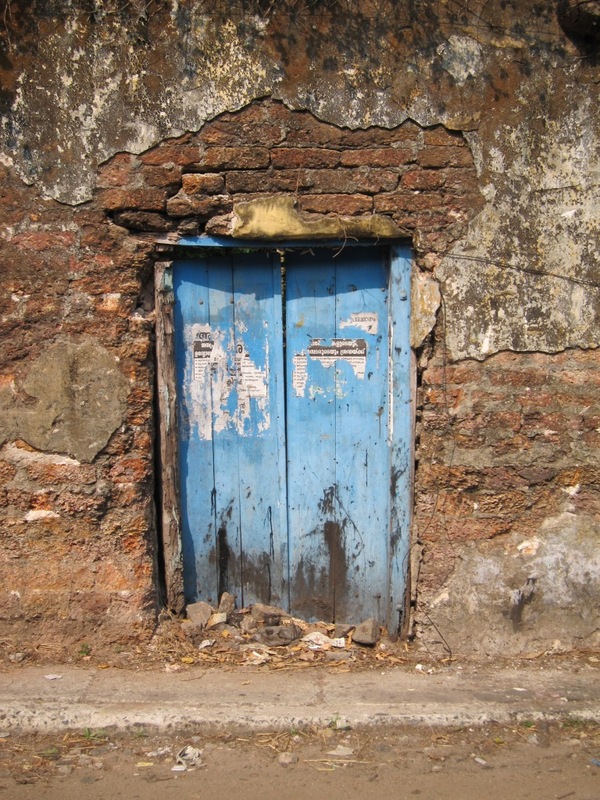 With Sharmila’s help, I did manage to find what seemed to be the proper office. However, the facade of the building looked nothing like the picture on the website, the signs were all in Indonesian, and the waiting area was filled with people who hadn’t seen the line move in an hour. Moreover, the necessary form (to be obtained from a photocopy shed out back) seemed to have run out for the day. Preferring a cautious retreat to a costly defeat, we withdrew to fight another day. 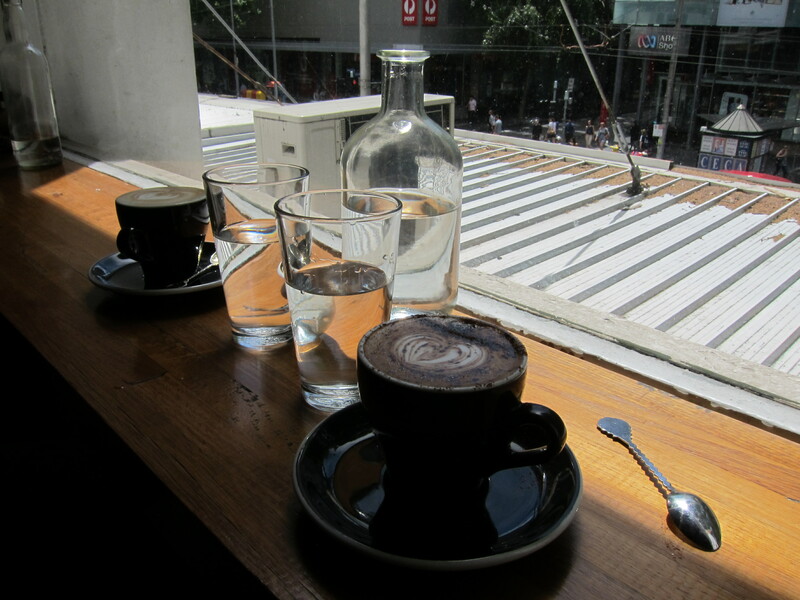 On the other hand, I am pleased to say that in Jakarta, I finally found the coffee I have been looking for. Purchased on the island of Flores as green beans and home roasted by Nick in his own cast iron pot in the oven, the freshly ground coffee delivered a superlative punch with subtle and interesting flavours. In fact, one of the delights of my time in Jakarta was eating an entirely homemade breakfast, with the bread, jam, and peanut butter all made from scratch! 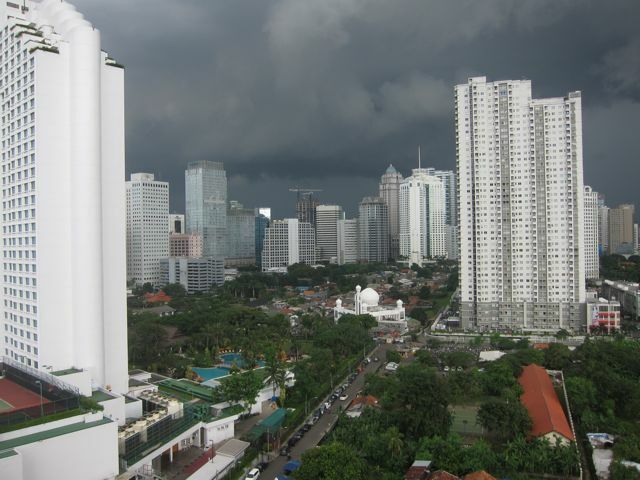 On our last night before flying out to Nusa Tengarra, we sat on Nick and Sharmila’s balcony, watching the skies turn from white to grey to black to yellow, as tropical storms rolled through the city. My friends assured me that beautiful mountains lay just beyond the clouds, but that one could only glimpse them perhaps one day per year. Finishing our drinks, we called it a night, with alarms set for three o’clock the next morning to wake us for a ride to the airport. 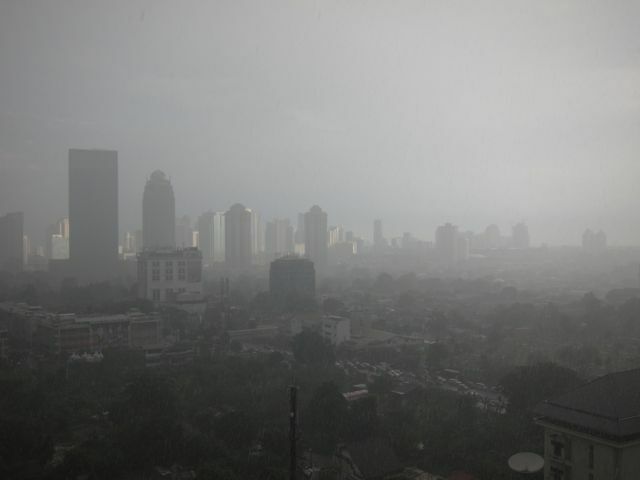 Update: I’ve added a few photos – Jakarta during the day, at night, and during a storm. 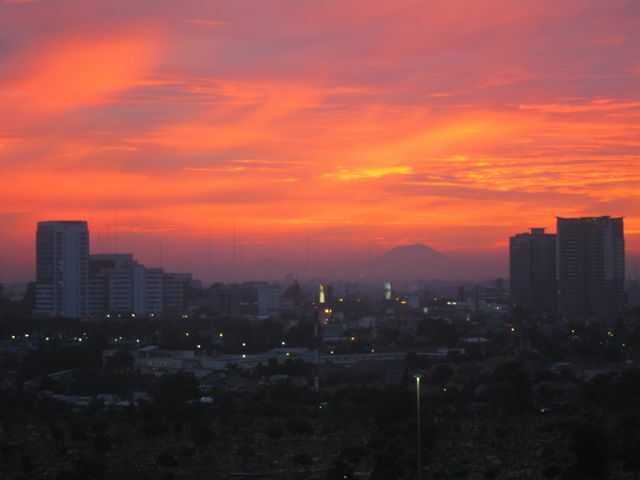 Finally, on my very last night in town I was able to catch a glimpse of the distant mountains during sunset. 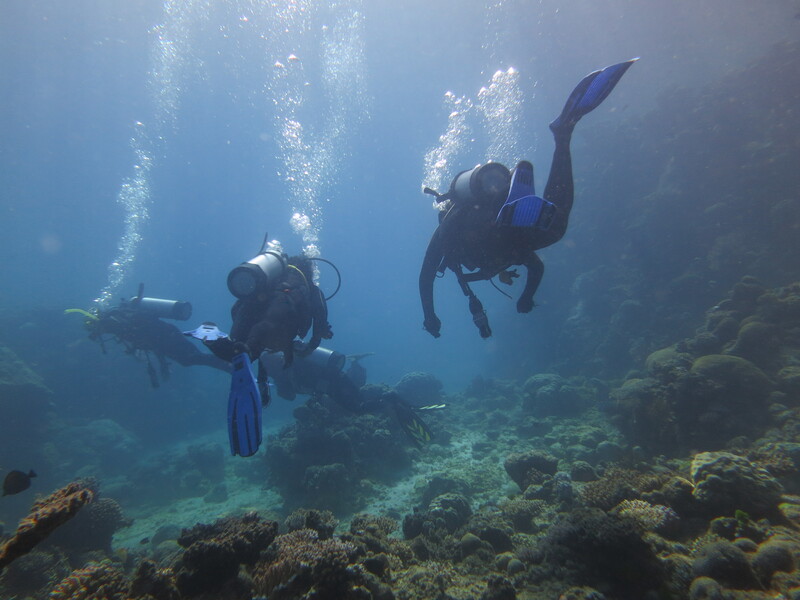 For my first week in Indonesia, my friends Nick and Sharmila had organized a scuba trip to Alor, a truly world-class diving destination. 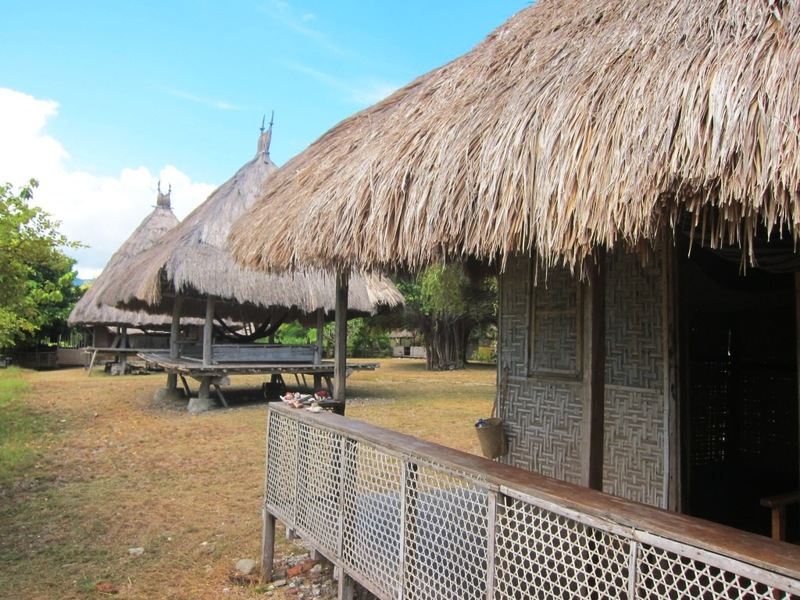 The three of us ended up staying at a fantastically rustic little French resort on Kepa, a tiny scrap of land off the coast of Alor, the last in a long chain of small islands running East from Bali. The trip from Jakarta involved three planes, two cars, and one boat, and took roughly eleven hours door to door, but it was well worth it. Indeed, the remoteness of the location meant that there were very few other tourists around. Although there is a second resort in the area, we never saw another dive boat and basically had the oceans to ourselves. Nick and Sharmila lamentably had to return to Jakarta for work at the end of the week. I ended up staying a few extra days, and later realized that it had been the longest I’d stayed anywhere in the past three months. Alor itself was actually bigger than I expected, with one well-built road running from the airport to the main town of Kalabahi, and many small villages in the surrounding hills. 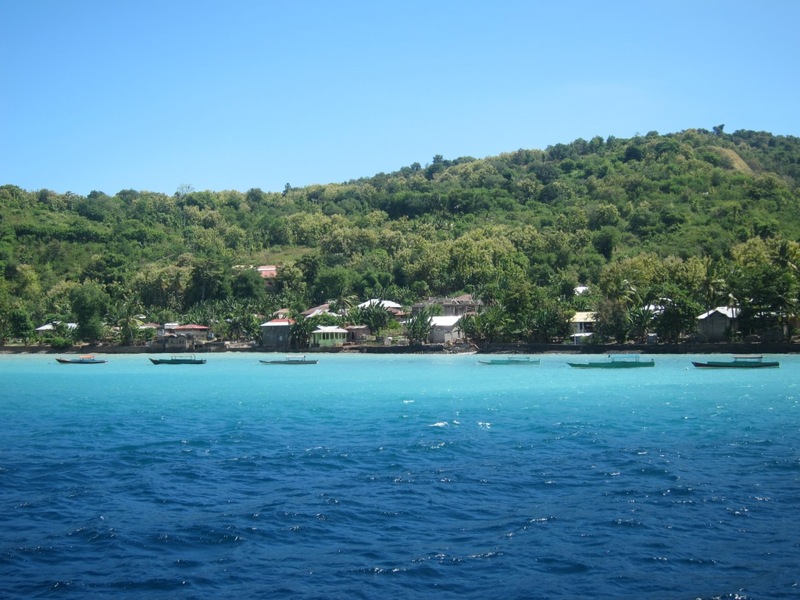 Kepa, on the other hand was, was the very picture of a tropical island paradise, practically deserted but for the place we were staying, with pristine beaches, crystal clear water, and fantastic coral reefs on all sides. With family-style meals and accommodation in cool traditional huts, it was the perfect place to spend a week diving, snorkeling, and lazing about. 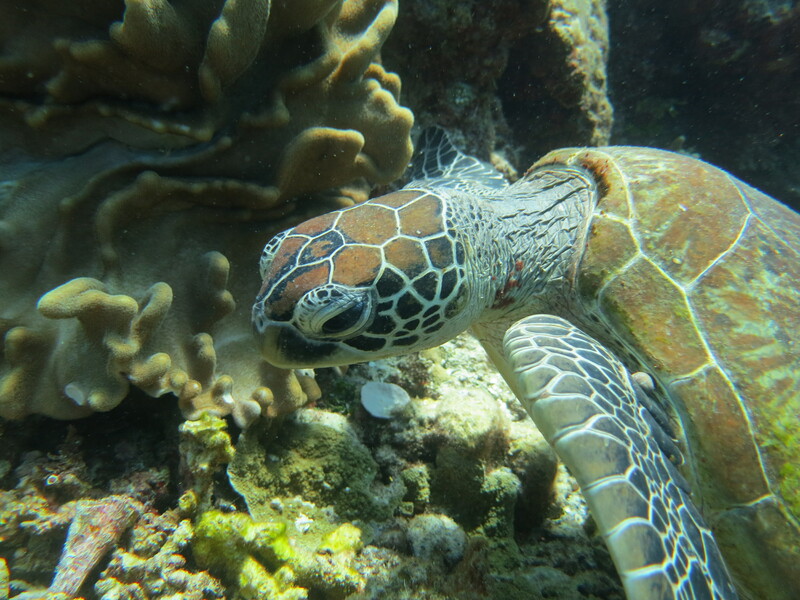 The scuba diving off of Alor was truly out of this world. I ended up doing ten dives while I was there, and all were fantastic. 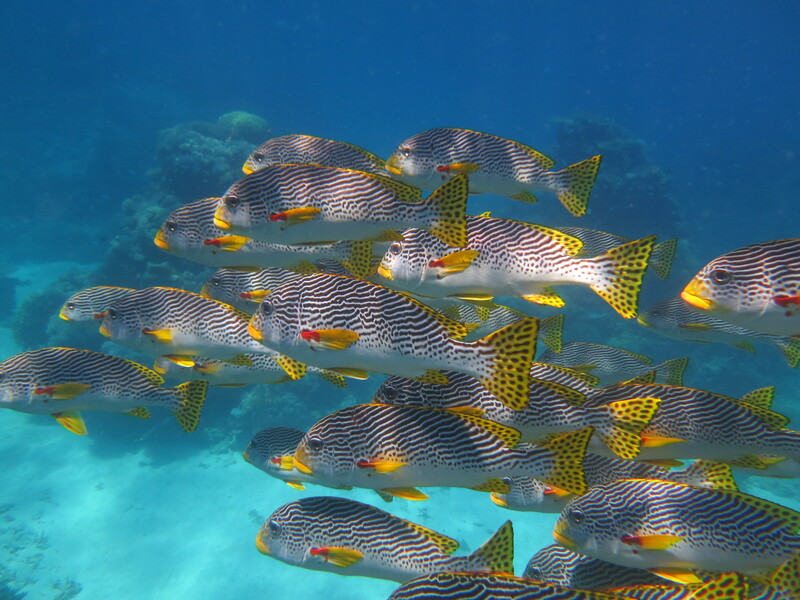 The most spectacular were giant underwater cliffs, dropping several hundred feet straight down, with huge schools of fish that would completely fill one’s field of vision. I unfortunately didn’t have an underwater camera with me this time, but you’ll have to take my word for it that I saw a sunfish, a seahorse, a jackfish the size of a person, and all manner of bizarre marine life. To me, everything was new and amazing – giant fields of coral of every imaginable colour, underwater plant life that looked to be taken straight out of a science fiction film, huge snake-like sea cucumbers with mouths beset by tentacles pulling food in at one end, and an endless variety of strange fish, some disguised as rocks, others changing colours before one’s eyes, and some looking as if they had grown ancient beards made from the surrounding plant life. It turned out, however, that almost everyone else at the resort was a very experienced diver, and most of them were primarily interested in the even more rare and bizarre things, such as nudibrachs – underwater sea slugs that have evolved to live without a shell and display a fantastic variety of patterns and colours. About half the dives were so-called “muck dives”, where the plant life and coral weren’t so dramatic, but where the weird stuff was more likely to be found. 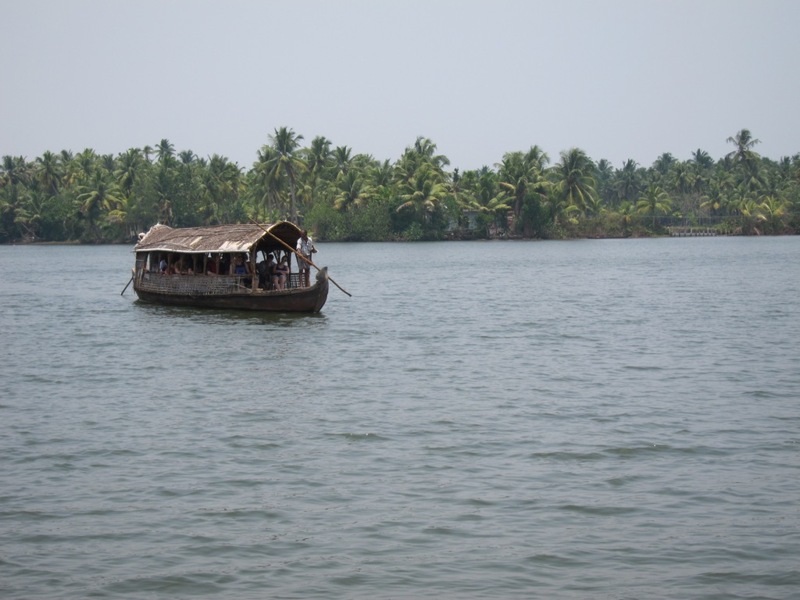 The area was also interesting for the people living on the many small islands in the region. Although many of the islands are quite close to each other, extremely strong currents flowing between them mean that they are relatively isolated. 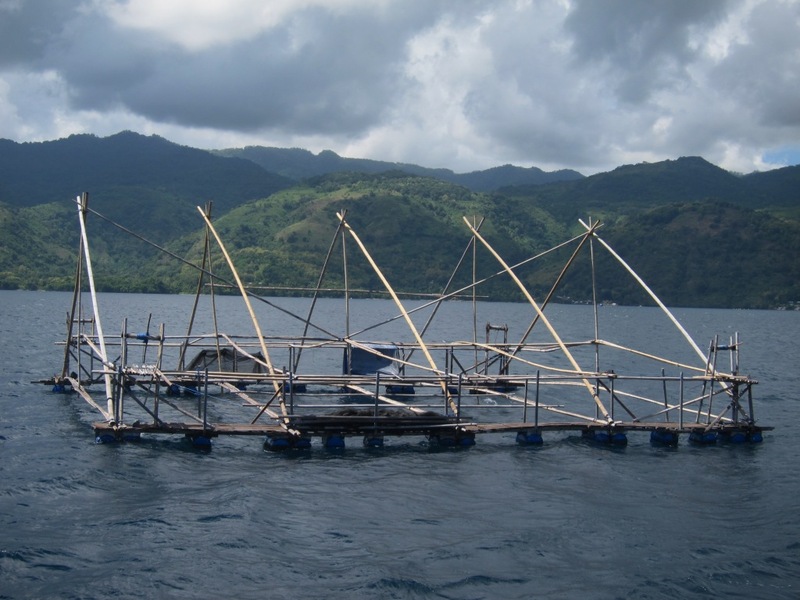 Touring around on the dive boat, we saw a cool mix of watercraft and fishing technology, including a pearl farm and the fishing platform pictured below. 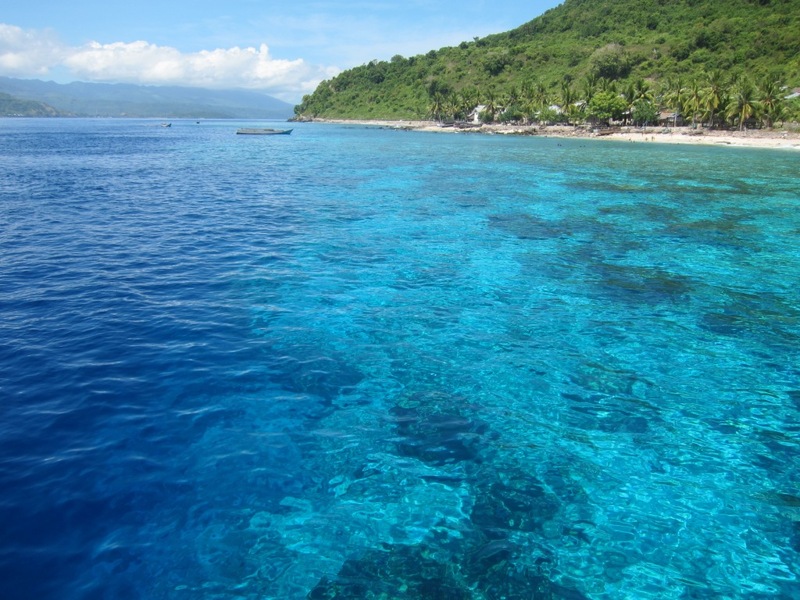 On one afternoon we hired a boat to visit a nearby island called Ternate, (the middle island in the photo below). 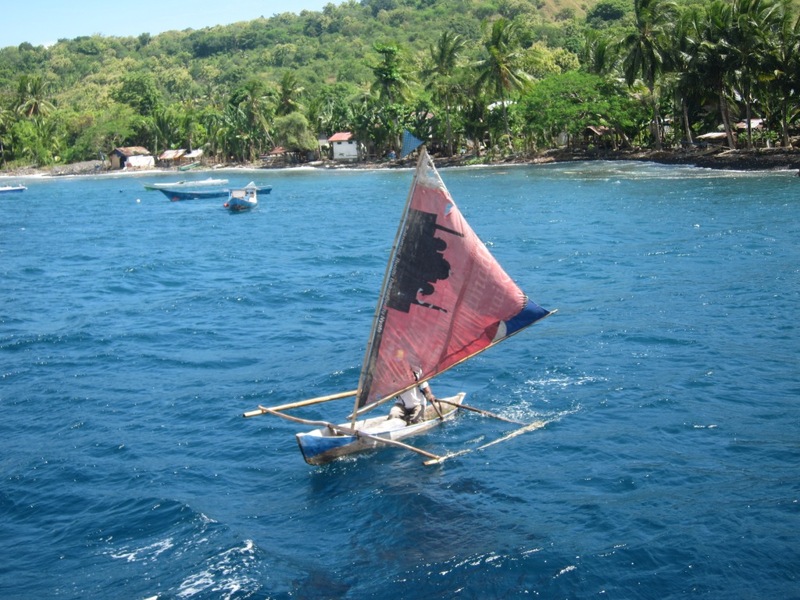 Ternate had just four villages on it, connected only by walking paths (or by sea). 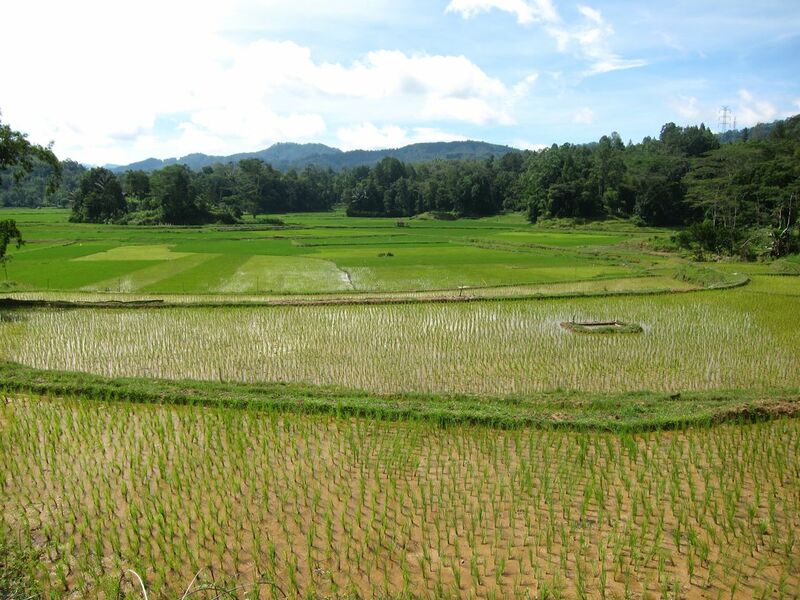 People living there subsisted on small-scale agriculture and fishing, and were able to gain some cash income by selling traditional hand-woven fabric known as ikat to intrepid travellers such as ourselves. 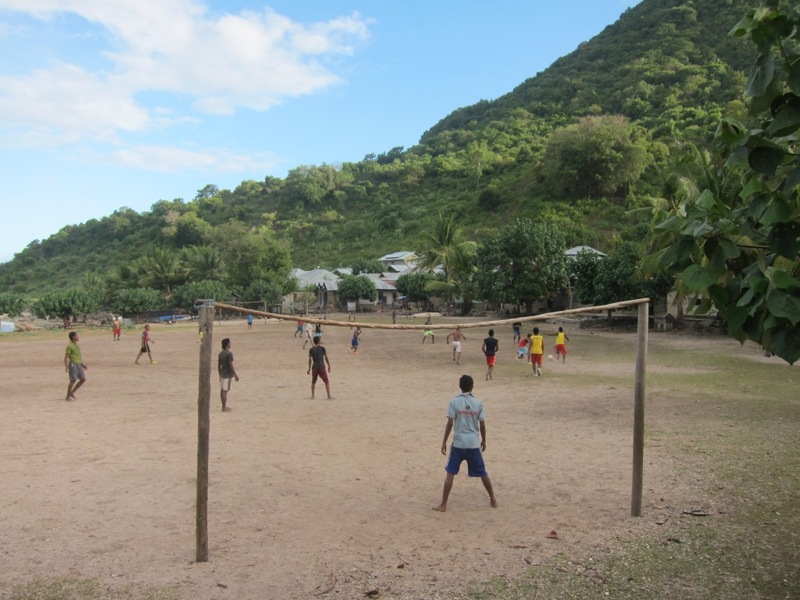 Despite being on such a small and isolated island, the village we went to nevertheless seemed to be quite prosperous, with a functioning well, a soccer field, two schools (primary and secondary), and a mosque. A few hundred people lived there, and almost all the traditional buildings had been replaced by newer cinder-block construction. We received a wonderfully warm welcome, and through Nick’s ability to speak Bahasa Indonesian, were able to learn a great deal about life in the village. By the end of my time on Kepa however, the world had moved on, and I found myself the last remaining guest on the island. Eventually mustering the ambition to rise from my hammock, I pulled myself away from paradise to seek out a new adventure elsewhere in Indonesia. As most of you probably know, I’ve now come to the end of my journey, having returned to Canada a few weeks ago. 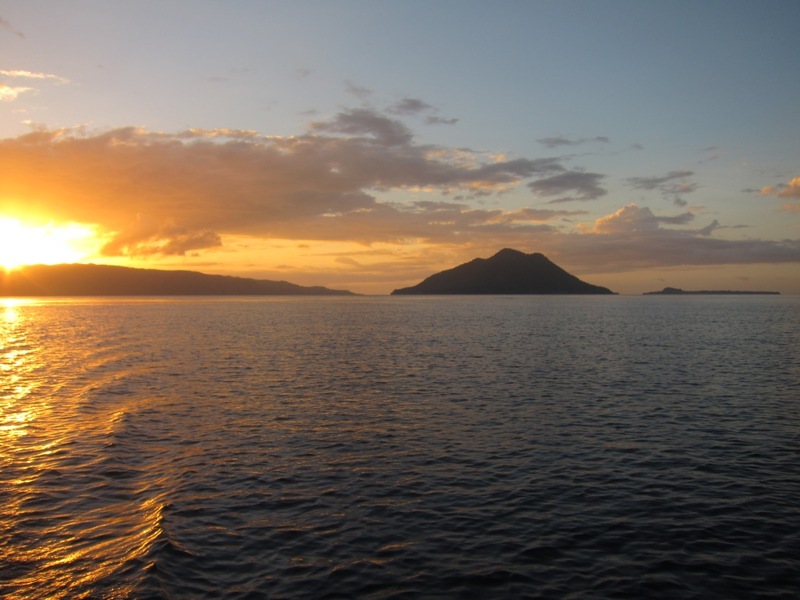 Many of you may have been wondering what happened to my blog updates after Alor. To some extent, I just ran out of steam. For me, the idea of blogging from the capitals of Europe somehow didn’t have the same pizzazz as punching out an update from a dusty internet cafe in the middle of nowhere. 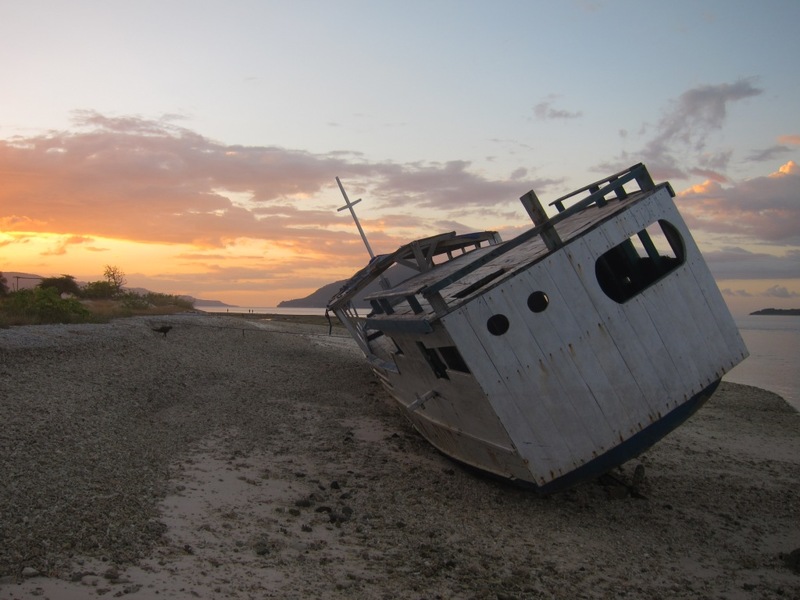 After leaving Alor, I found myself in Kupang, the capital of West Timor, and the regional transport hub for the Nusa Tenggara province of Indonesia. Only after I left did I begin to appreciate and even miss some parts of Kupang, particularly their incredible night-market, where delicious fresh fish could be purchased from a huge array of food stalls, and visitors from all over the region mingled in an outdoor eating area. At the time, however, it seemed hot, humid, and oppressive, and I wasn’t keen to stay there for long. Indonesia is one of the last countries in the world which offer almost unlimited possibilities for exploring relatively uncharted territory, but most of the out-of-the-way destinations involve long journeys using unreliable transportation. With only a limited amount of time left on my Indonesia visa and a slightly injured knee, (but an undiminished sense of adventure! 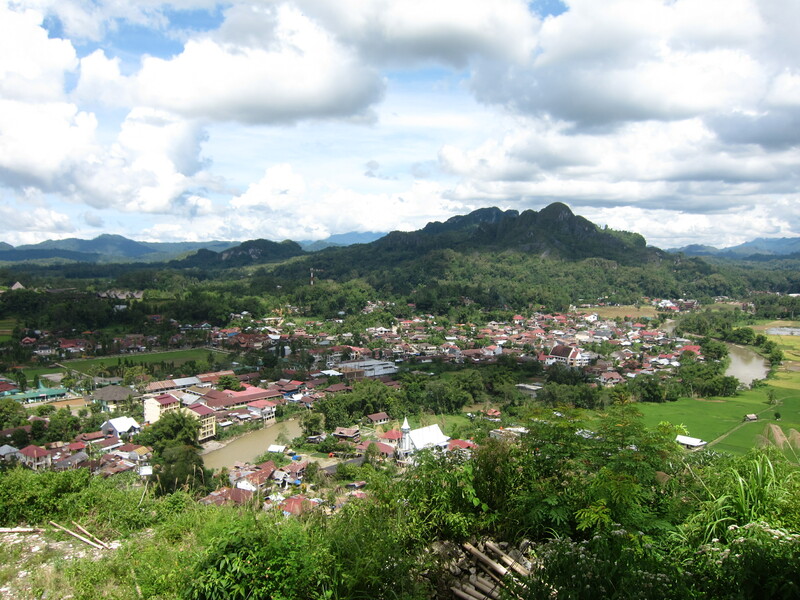 ), I decided to take some advice from a total stranger, and head to a region known as Tana Toraja, a remote but still readily-accessible destination in Sulawesi (an island well-known for its coffee). To some extent I thought I was getting off the beaten track; in my mind Sulawesi was a place that you just couldn’t go to ten years ago. Only later, however, would I begin to appreciate the complex history of the place, and discover just how touristy Tana Toraja is, and was. Sulawesi is an octopus-shaped island, one of the largest in Indonesia, situated between Kilamantan (Borneo) and Papua. I flew into the capital of Makassar, a sprawling, rather unpleasant port town, and two days later caught a bus that drove ten hours North to Rantepao, a small city at the heart of Tana Toraja. 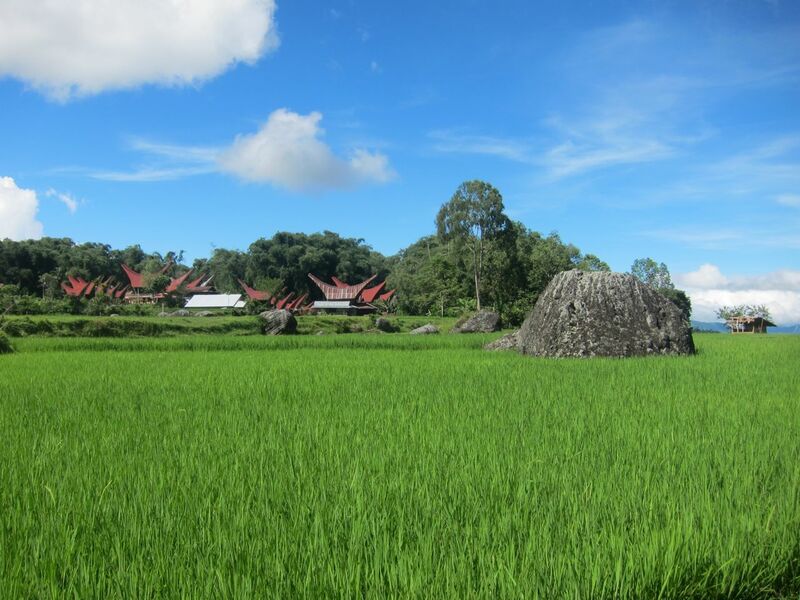 Surrounded by lush hills and rice paddies, Tana Toraja is undeniably beautiful. Unfortunately, in terms of independent exploration, Rantepao was a bit of a disappointment. Although it can boast of great views and a cooler climate than the rest of Indonesia, it lacks the two chief requirements for good hiking – a system of trails, and a decent map. Sadly, I could find neither. The only map available (and the one recommended by Lonely Planet), was produced 15 years ago, and is hopelessly out of date. All the trails near Rantepao shown on that map have now been paved, so just relying on walking was not a very pleasant option. The only saving grace was that motorbikes could be rented for about five dollars per day, so I was still able to do some exploring, just not in quite the way I had planned. Ultimately, the best combination proved to be riding as far as was practicable until the roads disintegrated into rocky swaths of hard-packed stones (see the photo below), then parking the bike and continuing on foot. Lacking a decent map, I never quite knew where I was, or where I was going, but it was still a lot of fun. 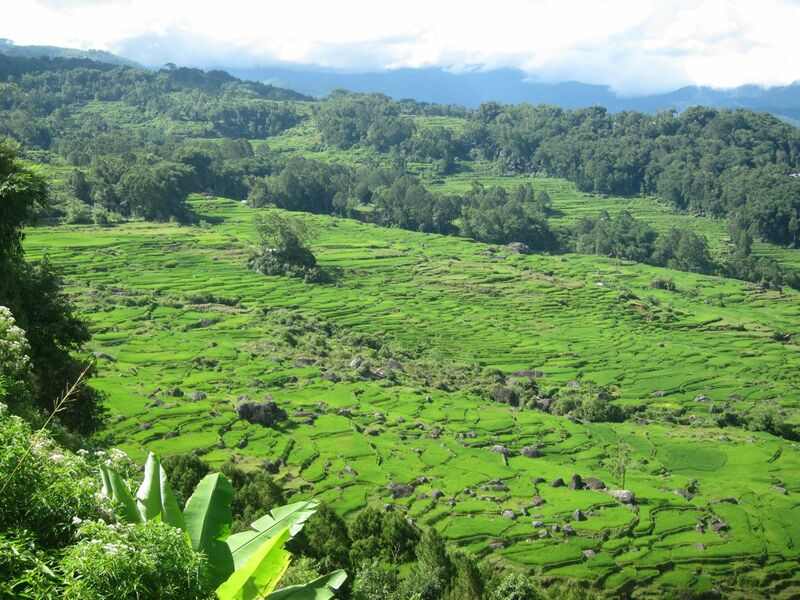 Until the start of the 20th century, Tana Toraja was relatively isolated. 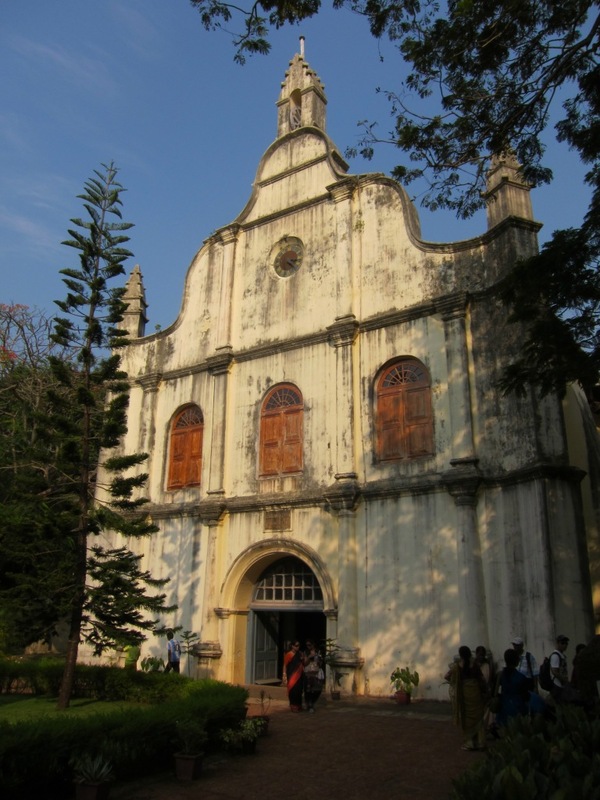 Over the last 100 years, however, the region has experienced a rather turbulent political history, beginning with Dutch missionaries that sought to bring the region under greater control. 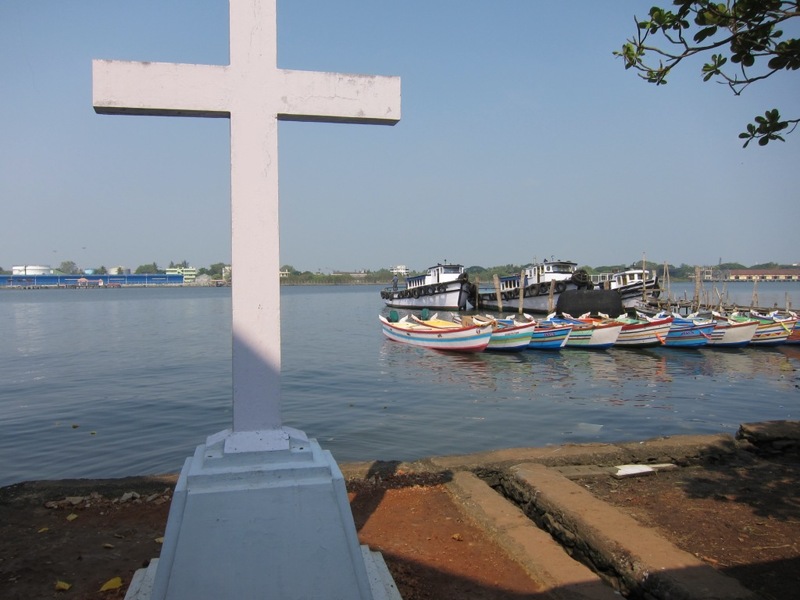 In terms of their objectives, the missionaries were quite successful in their work, as a majority of people in the area now identify themselves as Christians, despite the fact that Indonesia as a whole is almost 90% Muslim. In fact, while walking down the street, I happened to hear the following coming from what turned out to be rehearsals for an upcoming celebration of a century of Christendom in Toraja. (Fortunately they still had a few weeks to practice). The full story, of course, is much more complicated, and the identities of both the region and the people who live there are inextricably bound up with the history of colonialism, narratives of Indonesian nationhood, and the impact of modern tourism. 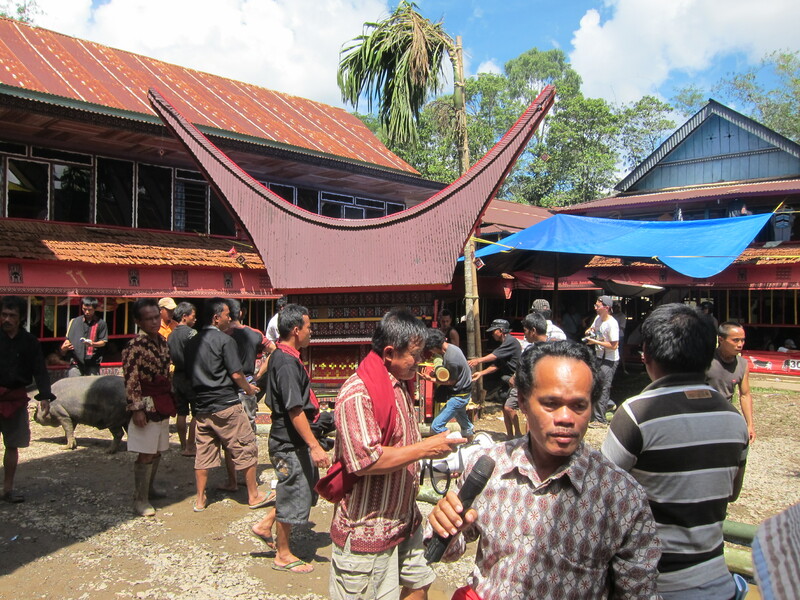 Moreover, most people in Toraja still hold very strongly to more traditional beliefs and practices, despite being ostensibly Christian. 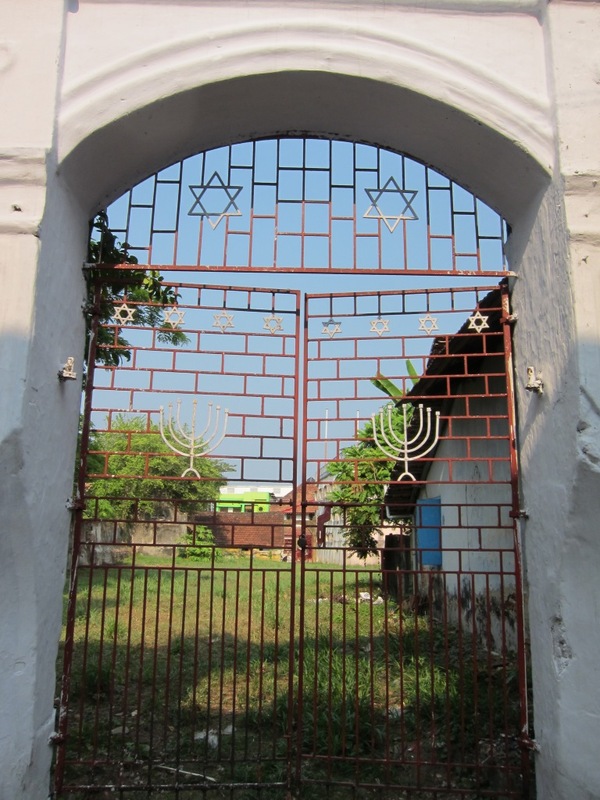 As a result, the area has received a lot of attention, and it experienced a huge boom in tourism in the nineteen-seventies, eighties and nineties, a boom that was only interrupted in the early years of the twenty-first century by an eruption of violence along religious and geographical fault lines in Sulawesi. As the violence has subsided over the past few years, so the tourist industry has returned, and in a big way. 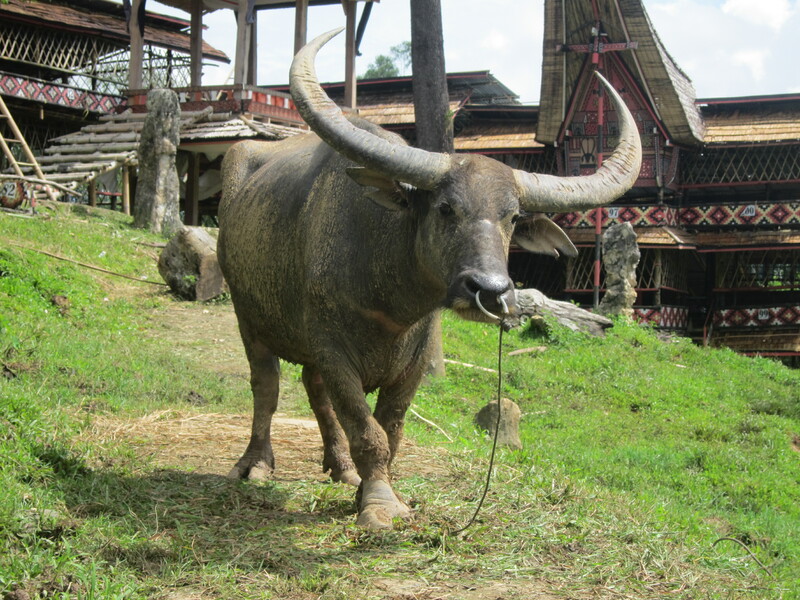 Obviously, by visiting Toraja (and perhaps even more so by writing about it! ), I’m contributing to this industry, and I certainly wouldn’t argue that the effects of tourism are entirely negative (how could I, having been a professional tourist for over five months?). However, in this particular case, things are a bit more complicated, and I can’t help but feel somewhat conflicted, which in part explains the long delay in getting this post online. 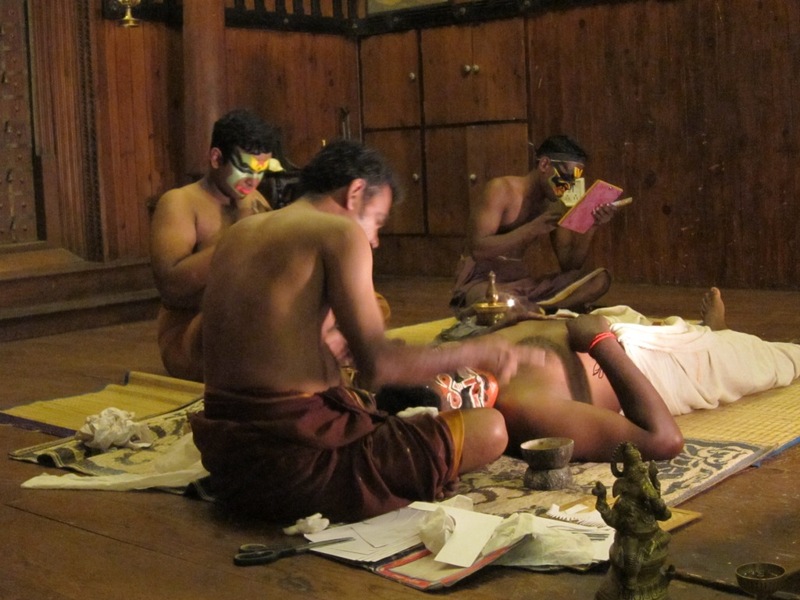 The most salient aspects of Torajan culture, and the main reason tourist come here, are practices centered around death and the disposal of human remains. Bodies are commonly interred in coffins, but these coffins are often placed either in caves, or high up on a mountain ledge. 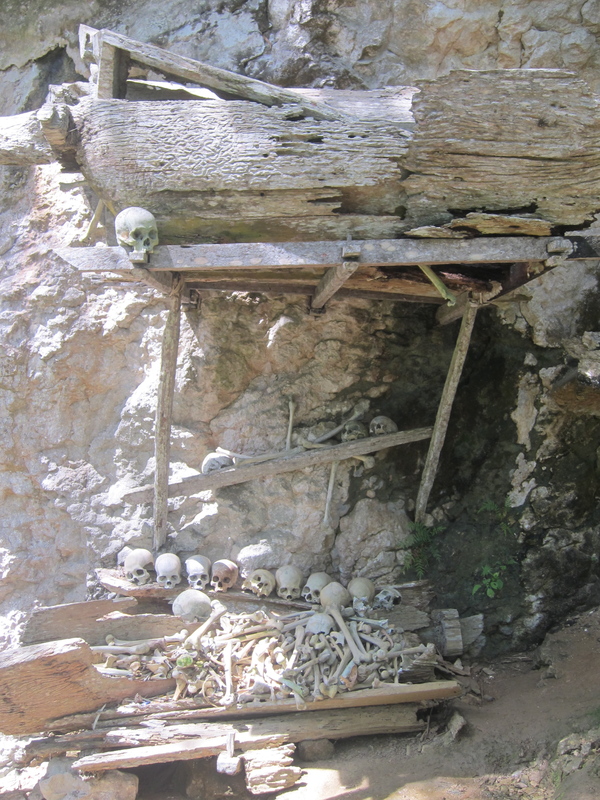 Coffins can be seen on cliff faces all around the region, hanging precipitously from high places, often in a near-complete state of disintegration. Although family members will sometimes relocate the bones of ancestors, they otherwise remain in place, wherever they happen to land. 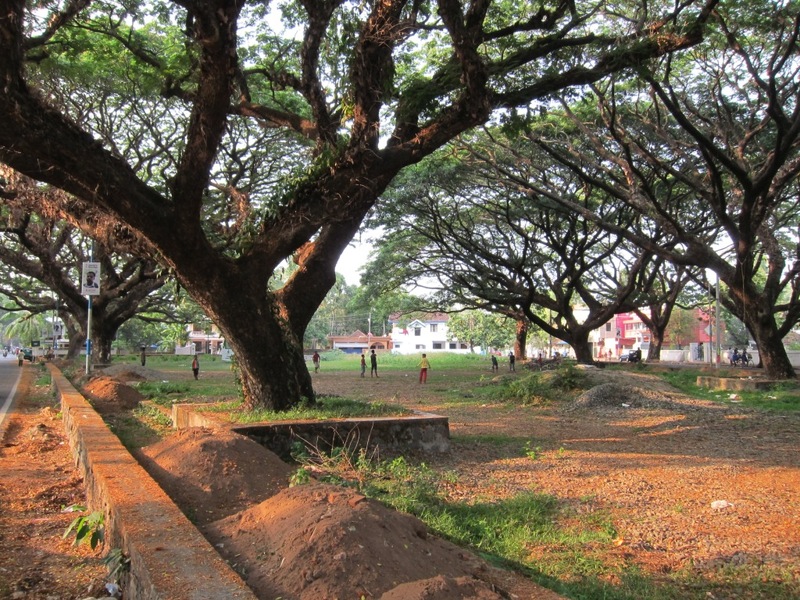 In the case of infants, bodies were sometimes buried in trees. 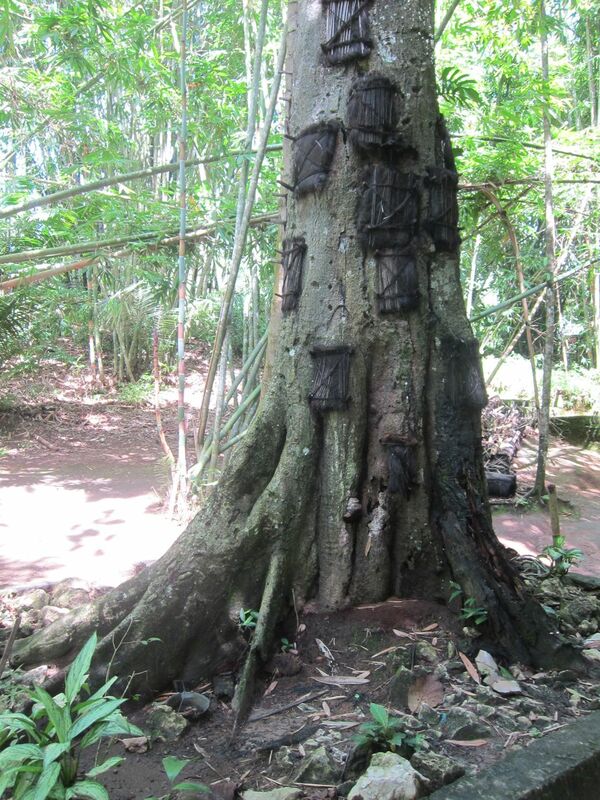 A few of these so-called “baby grave” trees have become dedicated tourist attractions, complete with a ticketing system. This provides both a way of generating income, and a means of controlling to some extent the areas which tourists are allowed to visit. 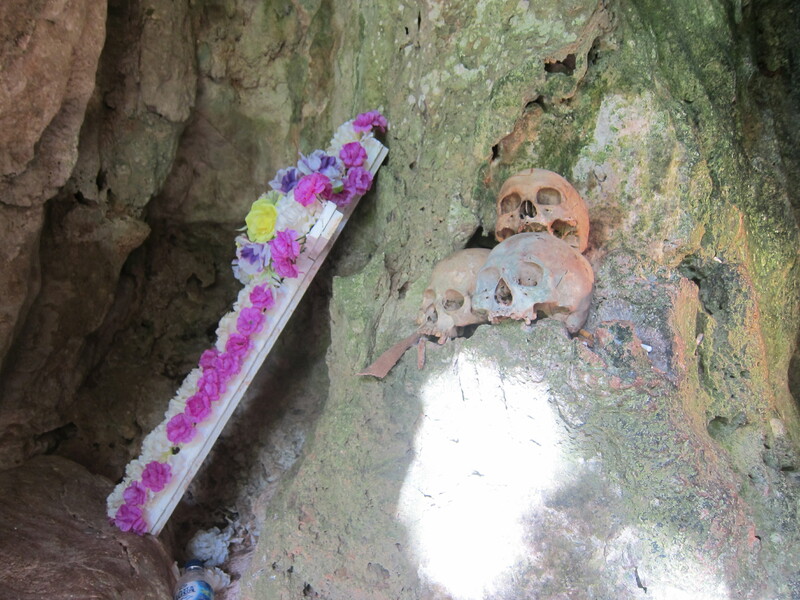 In the network of deep caves and caverns in the area, you can also find a multitude of coffins, many emblazoned with crosses or other Christian symbols, literally piled on top of each other. 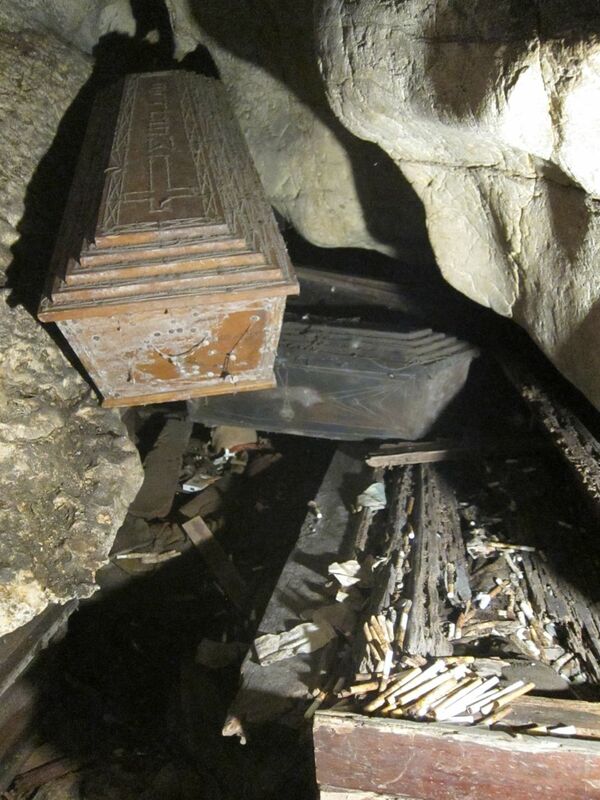 In the photo below, you can also see cigarettes piled up in a corner of one of the coffins, left as an offering. 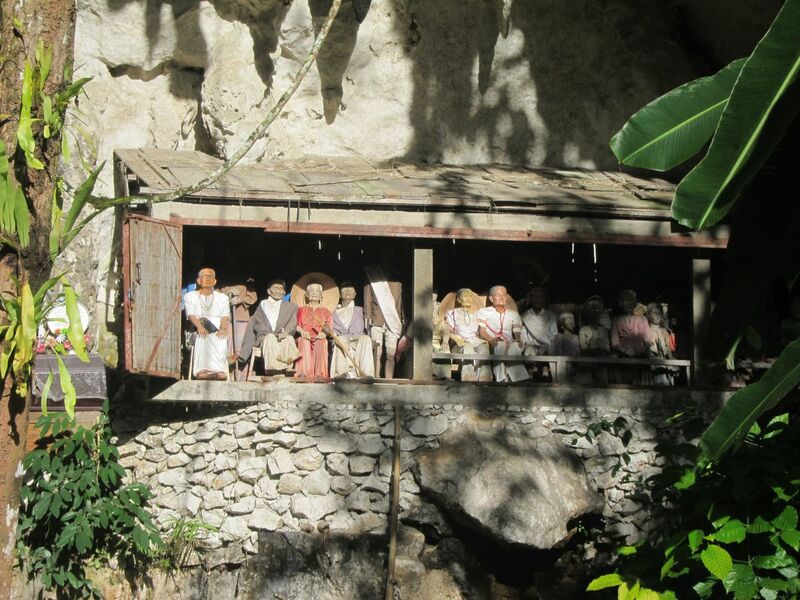 In some cases, these grave sites are guarded by “tau tau”, carved figurines representing the deceased. 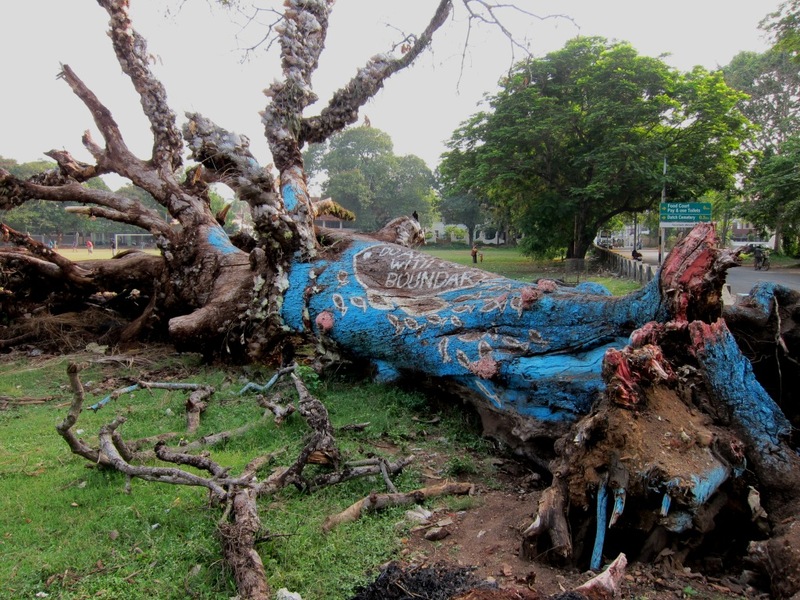 Again, several sites have been designated as official tourist attractions, in part because the theft of these sculptures was becoming a problem. As unusual as all of this may be, it is nothing compared to the elaborate funeral ceremonies which take place before burial. 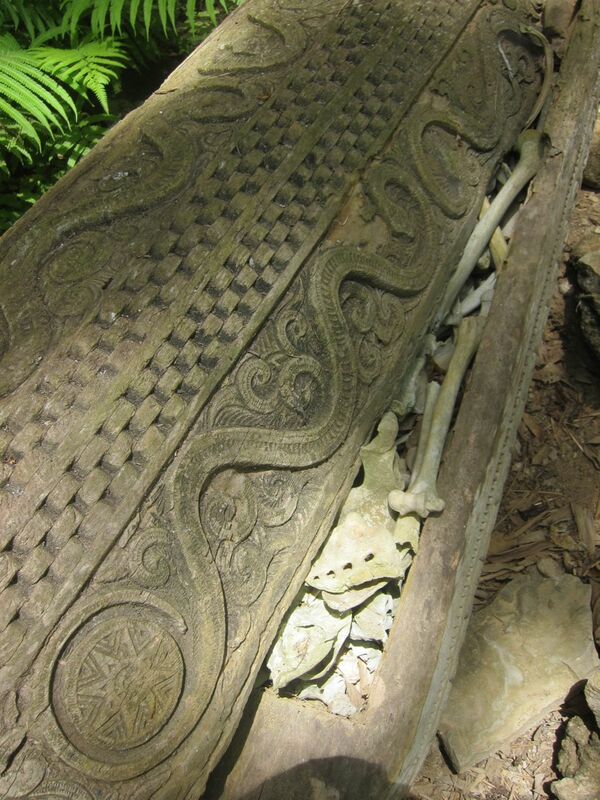 The tradition in Torajan culture is not to bury a dead person right away. 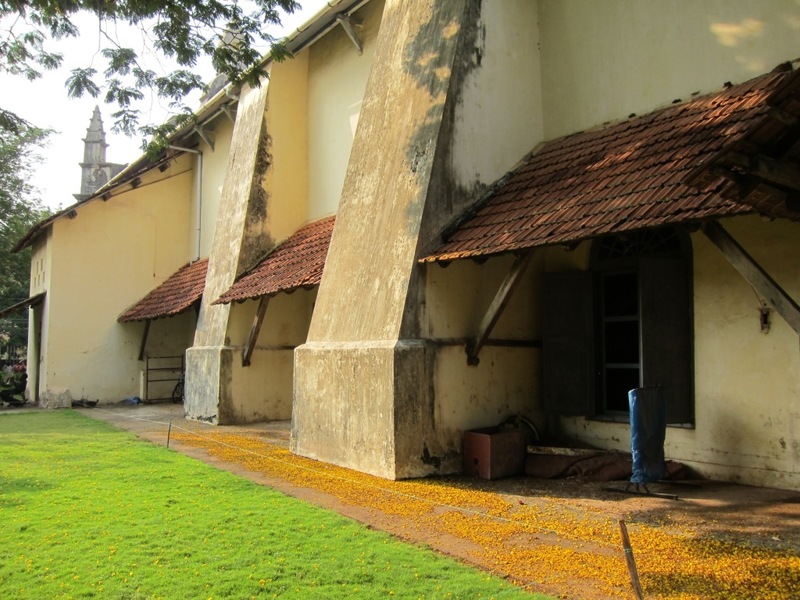 Historically, dead bodies were preserved using whatever herbal means were available, and the corpses were kept in the family home as long as necessary, in a place of honour in the bedroom. Today, more modern methods of embalming are used, but bodies are supposedly still kept in the home until a family decides to hold a funeral ceremony. Most of these ceremonies are held in July and August (which not-so-coincidentally coincides with a major boom in tourism). Given that I was arriving in May, I wasn’t sure what I would find. As luck would have it, however, a rather large funeral began the day after I arrived, and took place over the next five days. Before I had even got my bearings, a guide found me, and convinced me that the first day was the best day to go. I had no idea of his credentials, but he spoke reasonably good English, and was invaluable in helping me understand what was happening. 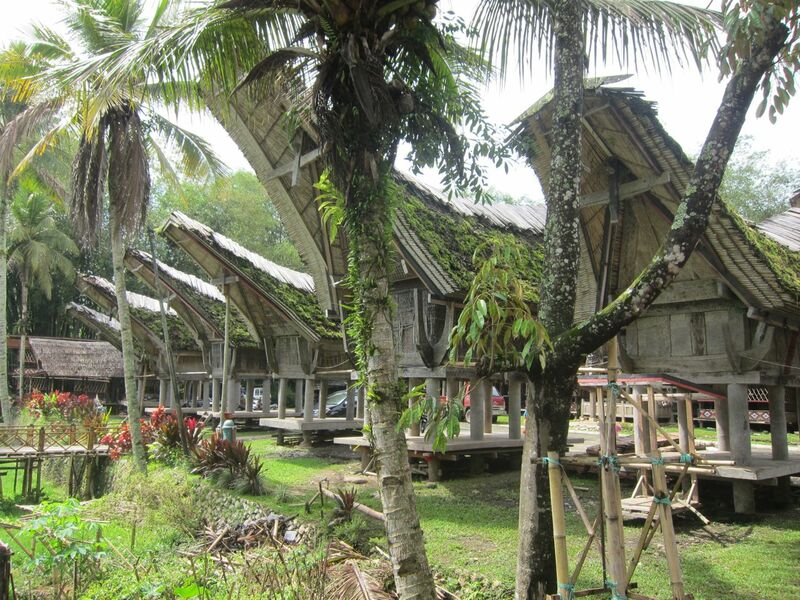 The most permanent element which remains after a Torajan funeral ceremony is a complex of buildings built around a central courtyard, to accommodate neighbours and relatives who come to participate in the ceremony. 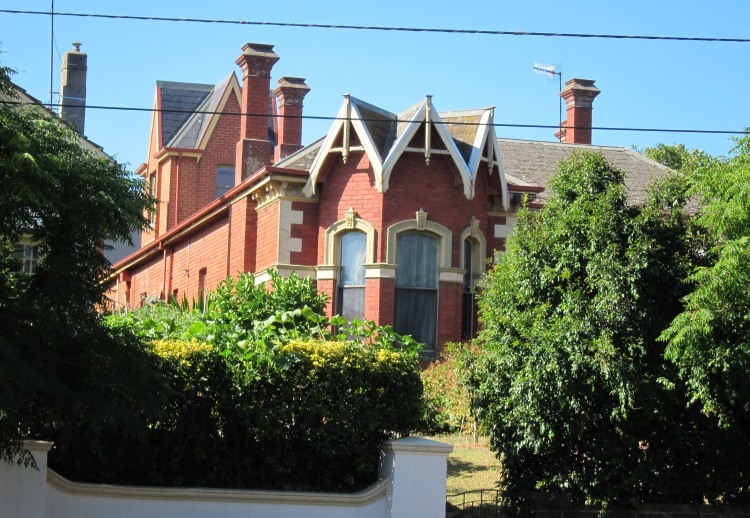 There is a very particular style to these buildings, including the architectural elements, colours, and motifs, and I found very similar ones everywhere throughout my later exploration of the countryside. With a sitting platform below, and space for sleeping or rice storage above, the most distinctive feature is the horn shaped-roof. This may or may not relate to the horns of the water buffalo, a very important animal in Torajan culture, both practically and thematically. 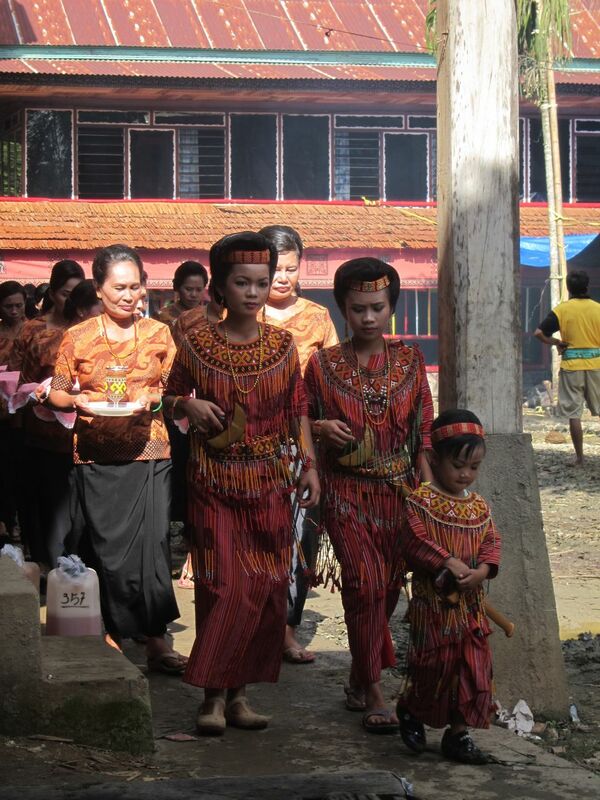 The ceremony I attended was for a relatively important person in the village who had died about a year and a half ago. As I negotiated a price with my guide, he included a line item for a carton of cigarettes, to be given as a gift to the brother of the deceased. I politely suggested that perhaps a different gift could be substituted, something less associated with addiction and disease, but my guide insisted that no other gift would do. It turned out to be the first of many ethical dilemmas that day in which my shaky principles were bulldozed by compromise. We arrived around 10:30 in the morning. There were a few hundred people there, including a few dozen tourists, most of whom had come as part of a package tour group, traveling directly from Makassar airport to Rantepao. There were also several dozen buffalo, and an equivalent number of pigs. All of these would be sacrificed over the next five days. The photo below shows the general layout of the area, with the tourists on the left, a prized water buffalo on the right, and a platform in the middle where a Master of Ceremonies spoke through a microphone hooked up to a set of giant speakers, and where the body was eventually to be moved, to sit for the five days of the funeral. The sitting spaces in all the buildings were mostly occupied by men, all of whom sat chain-smoking cigarettes and drinking arak (palm wine). The women were mostly out of sight, apparently preparing food. My guide had a first cousin who was somehow connected to the deceased, so we joined his group in one of the buildings, and were given a tasty meal of rice, meat, greens, and chilies. As things got underway, guests entered in processions, dressed in elaborate costumes and carrying symbolic objects (trays, pillows, kettles, etc). As they entered, the emcee called out their names and the animals that they had brought for the family. In between these arrivals, a group of older women started a phenomenal musical accompaniment, using bamboo sticks to strike an old hollowed out tree. (In the photo below, you can also see the speakers being used by the emcee). 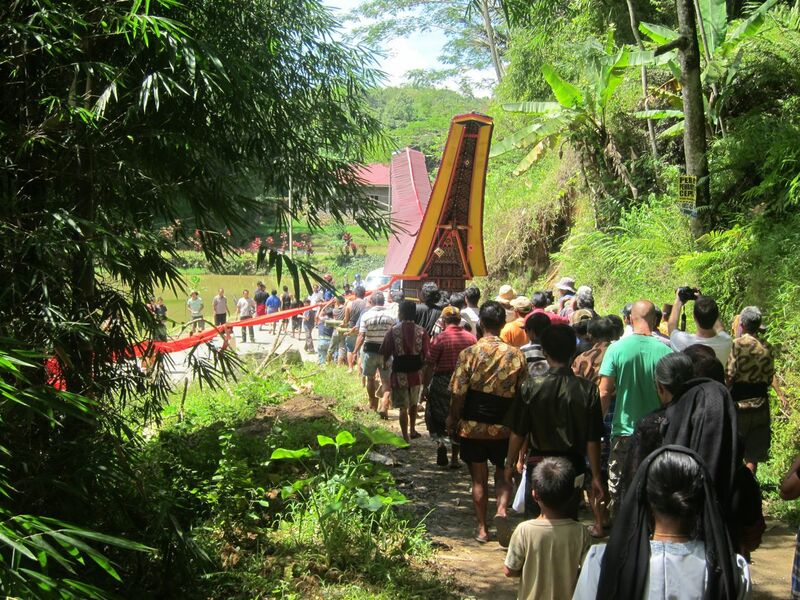 After a number of these processions, the body was brought out into the central courtyard, carried in a large litter shaped like a miniature Torajan house. The closest family members formed a circle around it and performed a ritual song and dance, with the emcee occasionally joining in over the loud speakers. After this ceremony, things started to move. A lengthy procession was formed, with the women leading, holding a long red cloth over the heads, and the men lifting, pushing, grunting, and shoving the litter through the village, out onto the main street, and then back again. This task was made all the more difficult both by the closest female relatives, who clung to the side of the litter, and by the bystanders, who continuously tossed small, sealed cups of water high into the air, which would then explode upon whomever they struck, to the general amusement of all concerned. The strangest part of the whole thing, however, was a quadracopter incessantly buzzing in the air above (which you can see in the photo below). By this time, I was already asking myself serious questions about the nature of this event. How much of it was in the authentic traditions of the Torajans, and how much if it was just for show? 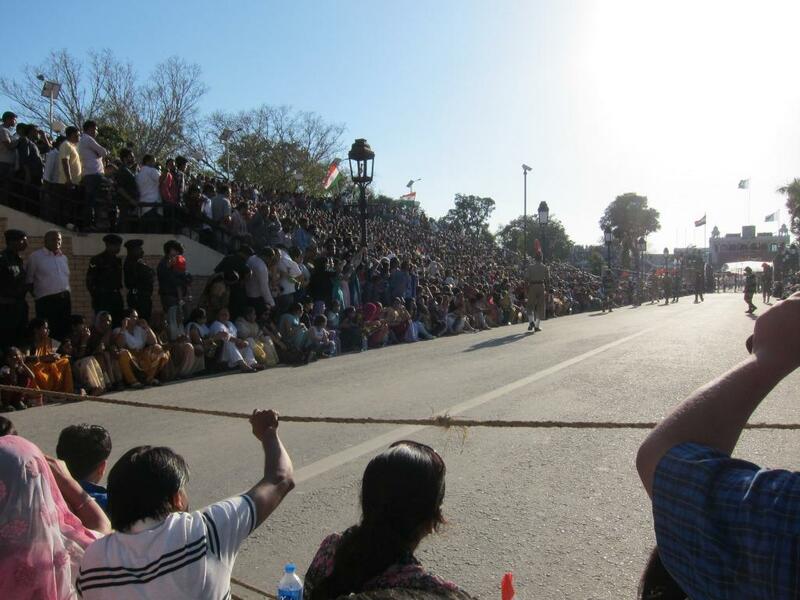 How was my presence and that of other tourists affecting the people participating in the ceremony? To what extent was all the photography and videography exploiting a private ceremony, and how did the family feel about the presence of all these tourists? The whole thing was undeniably theatrical, from the costumes, to the props, to the layout of the buildings, which provided stadium seating around a space which functioned as a central stage. The man with the quadracopter seemed like a microcosm for the absurdity of this particular spectacle as theatre. 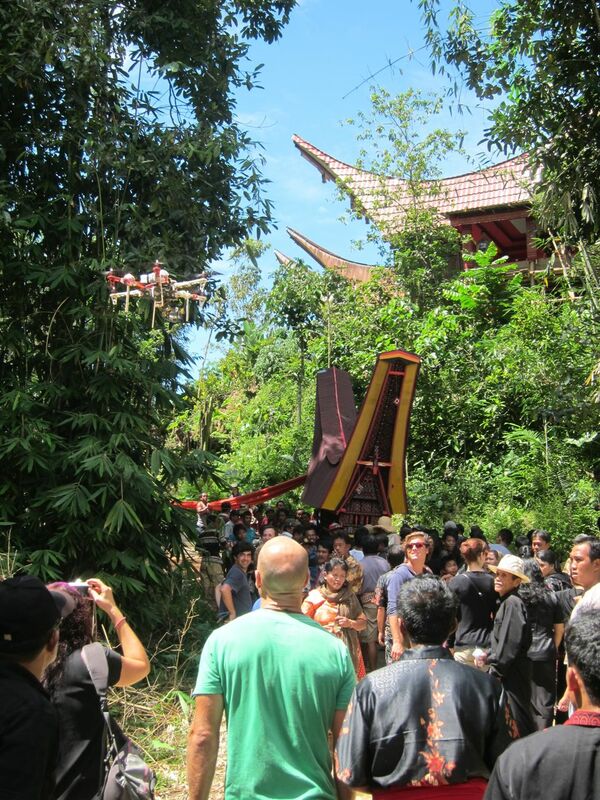 It turned out, however, that the flying machine contained a video camera, and the man controlling it was part of a team of people from South Korea making a documentary about Torajan culture. I had taken the quadracopter to be the epitome of rudeness, but some of his collaborators went much farther in getting up close and personal with their professional video cameras. The filmmakers obviously had permission from the family to film (though not from bystanders, such as myself! 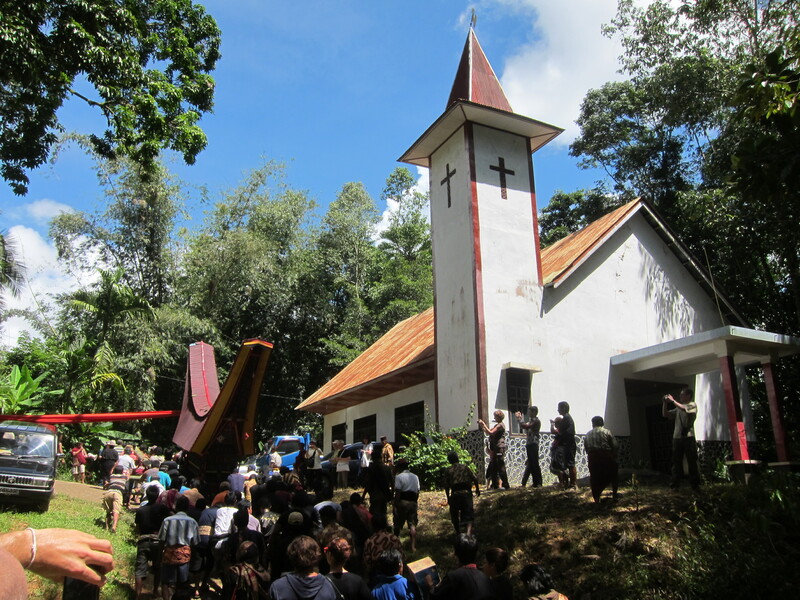 ), but moreover, according to my guide, the family was very proud that their ceremony was being captured on film, and that it might encourage greater interest in Tana Toraja among South Koreans! In any case, there is no doubt that the influence of the filmmakers was far from passive. Although I assume the ceremony was in general conducted essentially as it would otherwise have been, I could see individuals becoming more self-conscious and theatrical as they came into close proximity of the cameras. By this point, I had long-ago lost track of who was the spectator, and who the spectacle. Then, the animal sacrifices began. At first it was just pigs, who were killed very unceremoniously (brutally, I would say) with knives. They died quite quickly, and as soon as they had been killed, the men traded their knives for giant flamethrowers to scorch the skin so that it could be scraped off with sticks. The pigs were then gutted, and tossed into a pile, to be carried off to the food preparation area. The transition from live animal to raw meat was so fast, that to my mind, at least, it almost seemed to make a mockery of, or at least call undo attention to the fact that such an elaborate funeral ritual was being performed for a different being, a human, let alone one who had died over a year ago! On the other hand, this was presumably to some extent the point, to make clear the distinction between humans and other species. Later that afternoon, two buffalo were also killed, their throats cut in a somewhat more ritualistic fashion, just two small ones, as this was only the first day of the funeral. The buffalo took much longer to die, and it was a grim and gruesome spectacle for those who, like myself, had stuck around for their own Apocalypse Now experience. Obviously there are complex things going on here. I wondered again how much my presence encouraged this sort of practice, as traditional as it might be. My guide assured me that this was the way things were done, no matter who was present, and that moreover, it was a huge expense for the family to hold the ceremony. According to my guide, the only people making significant money off the whole affair were the owners of tour companies in Makassar. Still, I was left with many doubts in my mind. As it happens, I had just finished reading David Graeber’s “Debt: The First 5,000 Years”. I thought the book had an interesting premise, but found it somewhat incoherent overall. Nevertheless, it did provide a useful reminder that debts in more traditional societies are binding in a way that they are not in our larger, more impersonal societies. 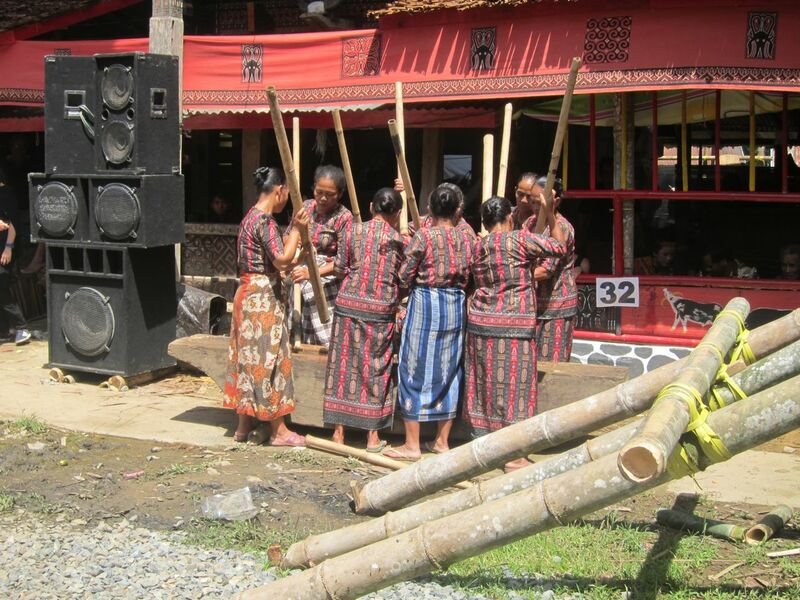 In line with this idea, family members in Toraja are liable to be called upon in all kinds of ways whenever a relative dies, from helping with the construction of buildings, to bringing animals as gifts. This is more complicated than it seems, however, as it turns out that these offerings were not exactly gifts. In fact, the value of each animal and its donor were carefully recorded in a ledger as they were being announced by the emcee, and the family of the deceased will apparently be expected to repay the gift some day, by donating an animal of equivalent value when the time arises. 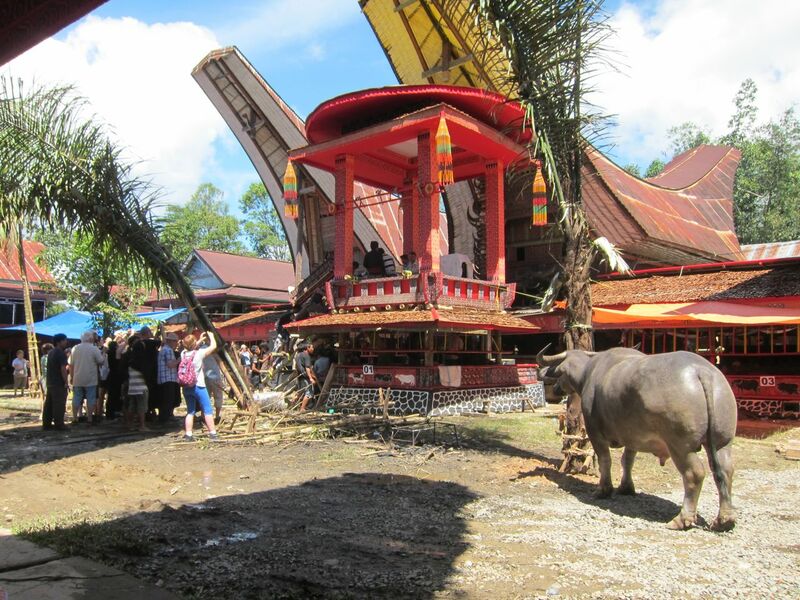 Not really knowing what I was getting myself into when I booked myself a plane ticket in Kupang, it’s hard to say to what extent I owe a debt to the person who recommended I go there, the people of Tana Toraja, or the animals that died as part of the spectacle. Officially, of course, I discharged that obligation through the purchase of a carton of cigarettes. Perhaps, in some sense, I added to the prestige of the ceremony through my attendance. And there’s even the remote possibility that blog will in some small way encourage tourism to the area. Or perhaps it’s precisely the opposite. In any case, there is obviously nothing novel in the death of animals, (or the death of anything, for that matter), except in so far as such things have been largely banished from public life in Western societies, pushed aside through the power of wealth. And if all I wanted to see was a bull being killed, then I no doubt could have stayed home and found something on YouTube, rather than travelling half-way around the world. But being present, being part of something like this, does seem to me to involve something that cannot be so easily captured, quantified, or repaid. Ultimately, I think, the gift for me was to a chance to see life and death a little more for what they are, or at least to be forced to think about the distinction, if only for a little while. And in the end the only appropriate response seems to be to tell about it, to share what I experienced, and thereby to keep the gift in circulation.